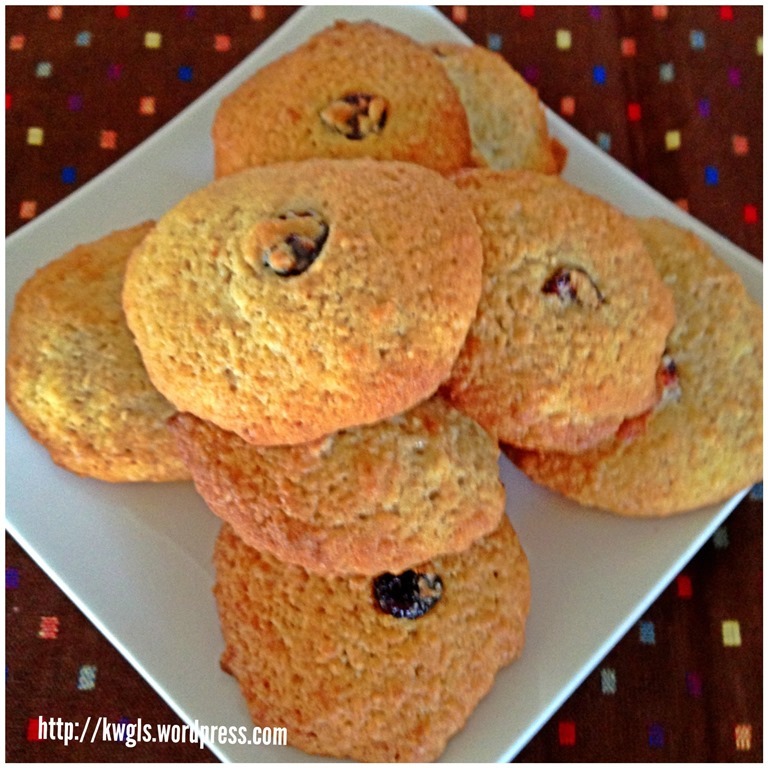 This is a special compilation of the biscuits and cookies recipes that were issued by the blog. 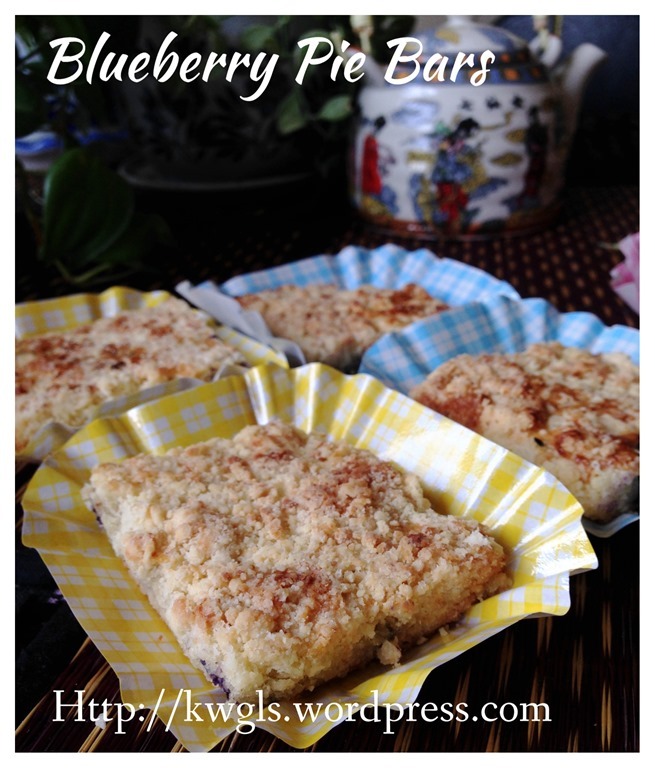 For recipe, please click on the pictures or the blue colour link to go individual posts. 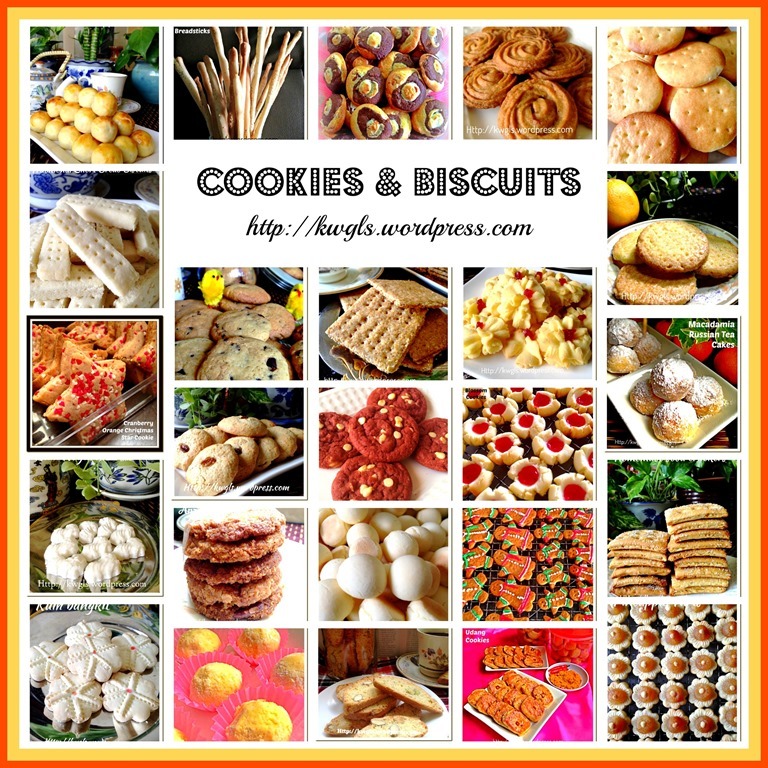 At least half of the cookies and biscuits are suitable for festivals such as Chinese New Year, Hari Raya Aidilfitri, Diwali or Christmas. 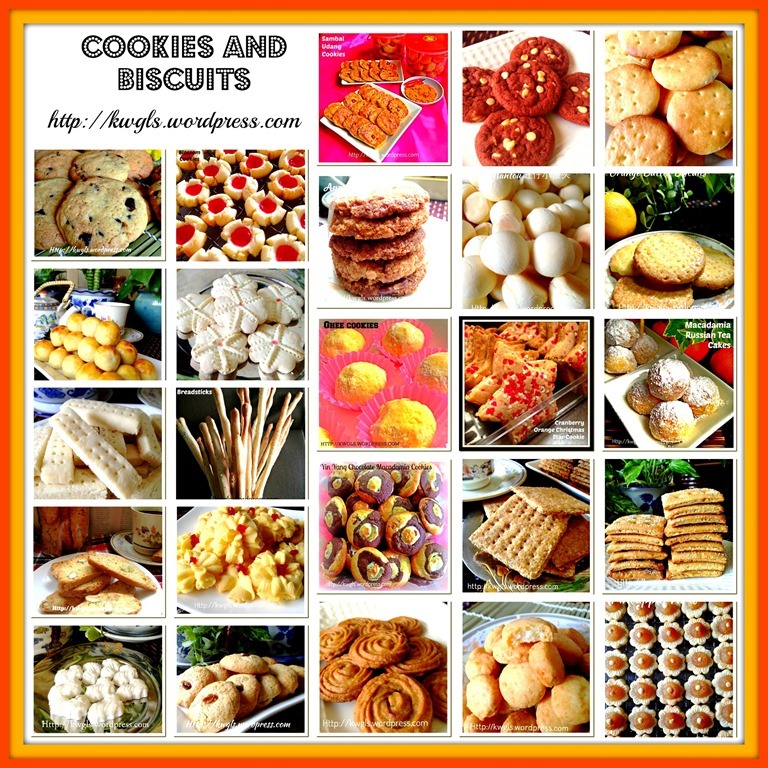 It is hope that this simple compilation of cookies will help the readers to look for the relevant cookies. 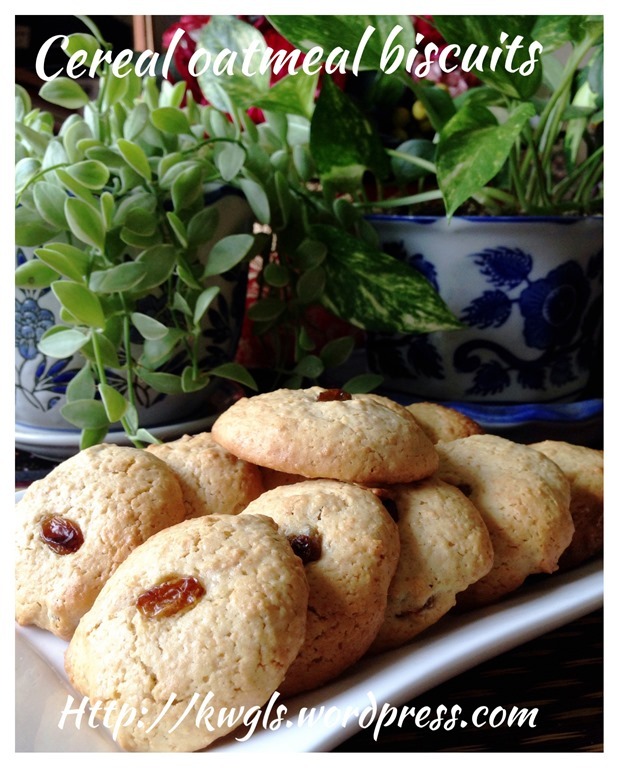 Spicy Shrimp Floss Cookies – A savoury cookie that is spicy and full of dried shrimp floss. 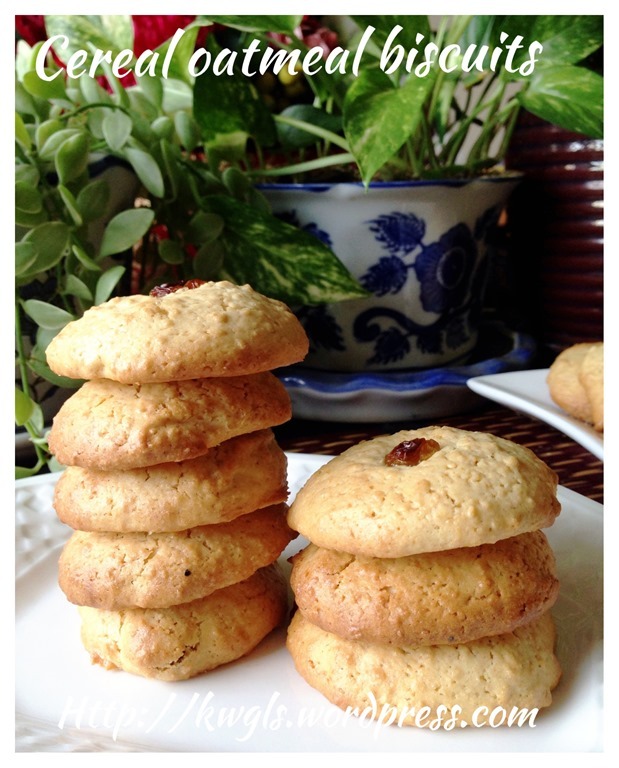 Almond sugee cookies – Made from ghee/butter together with semolina flour. 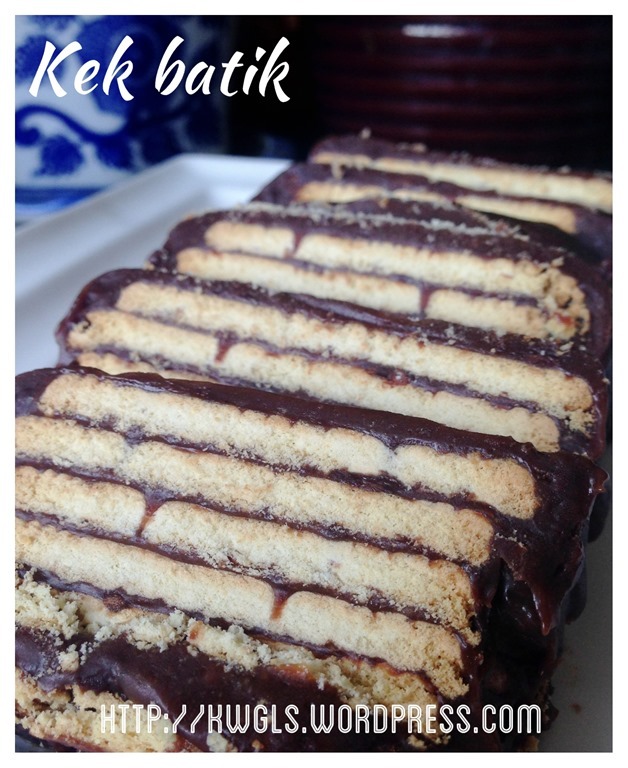 Another melt in the mouth cookie. 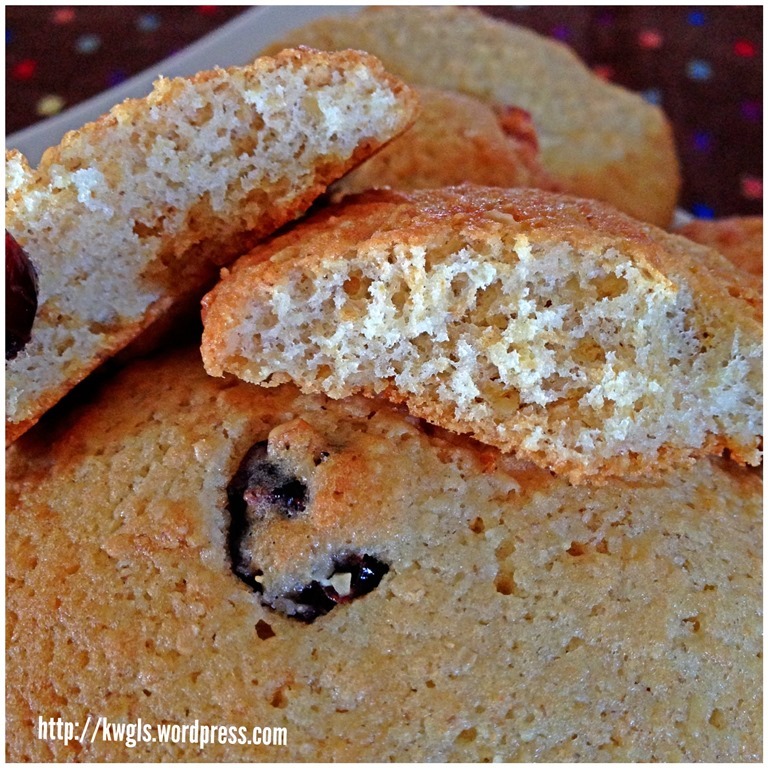 Melting moments – It is like Danish butter cookies made from butter and sugar. 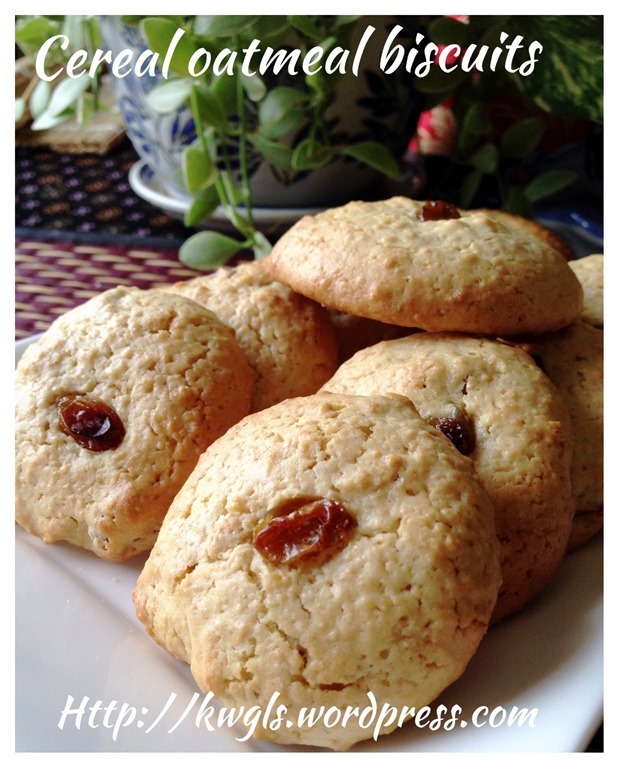 ANZAC biscuits (澳纽燕麦饼干） – though this biscuit is rather big, one can prepare in a smaller version and it will be another nice biscuit in a tray of cookies. 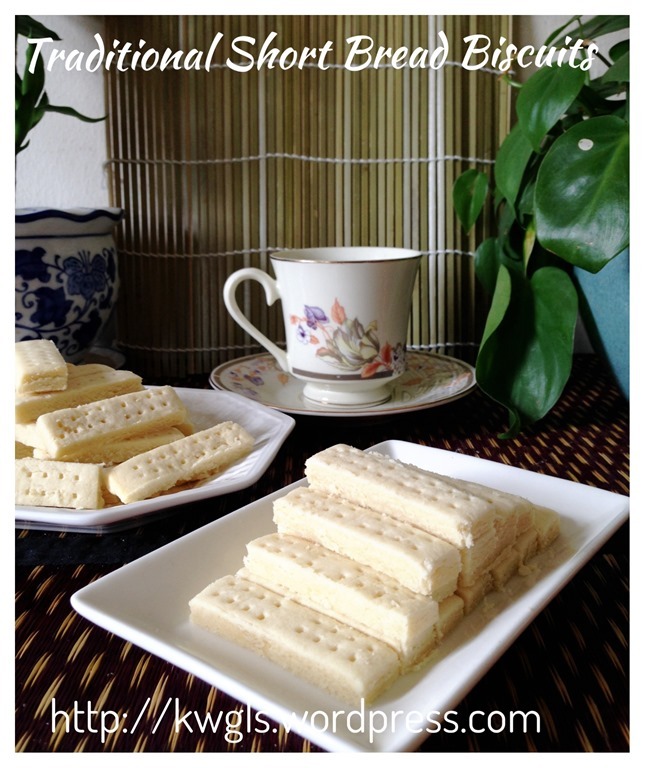 Coconut Delights – A three ingredients simple snacks good for small gatherings during Chinese New Year. 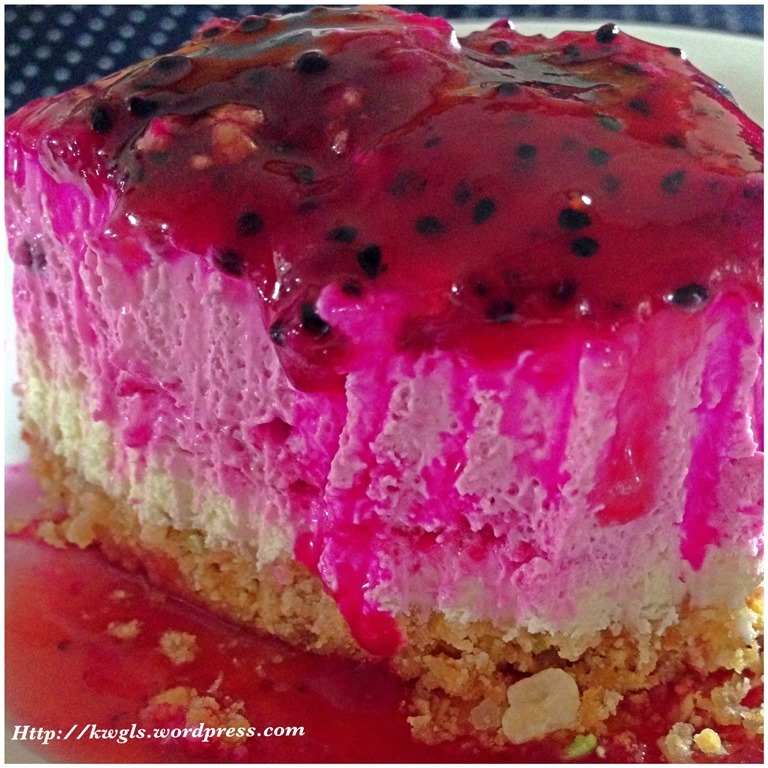 After Red Dragon Fruit Pie Bar, Shall We Have A Red Dragon Fruit Cheese Cake? Life as a food blogger has his/her fair share of pressures. He/she will have to design a dish, prepare the dish, decorate the dish and take picture for the blog. A poorly taken picture may ruin all his efforts putting in for the dish he or she prepared. All bloggers will have its own strengths and weaknesses and some of my weaknesses are cake cutting, decoration and photographing. I am especially wary of cutting an 9” inch diameter cakes. I am not fully satisfy with the images in this post and I shall improve on it. Though I do not really like the colour of red dragon fruit, however, I am amazed by the visual presentation that it can create for cakes and pastry. 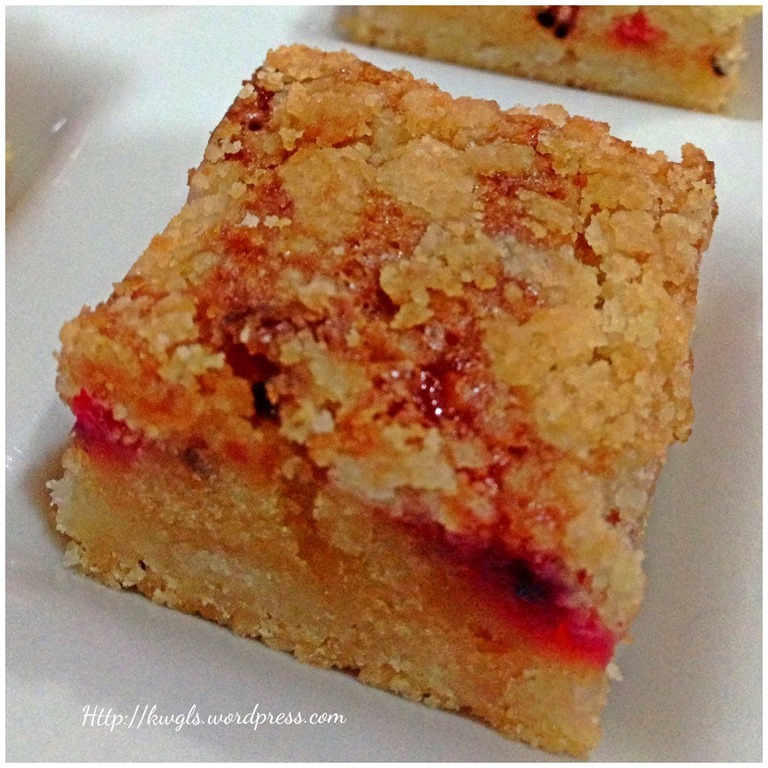 I have blogged about red dragon fruit pie bars yesterday and have another half a red dragon fruit left. I thought it would be a good idea to use it for some cheese cakes. 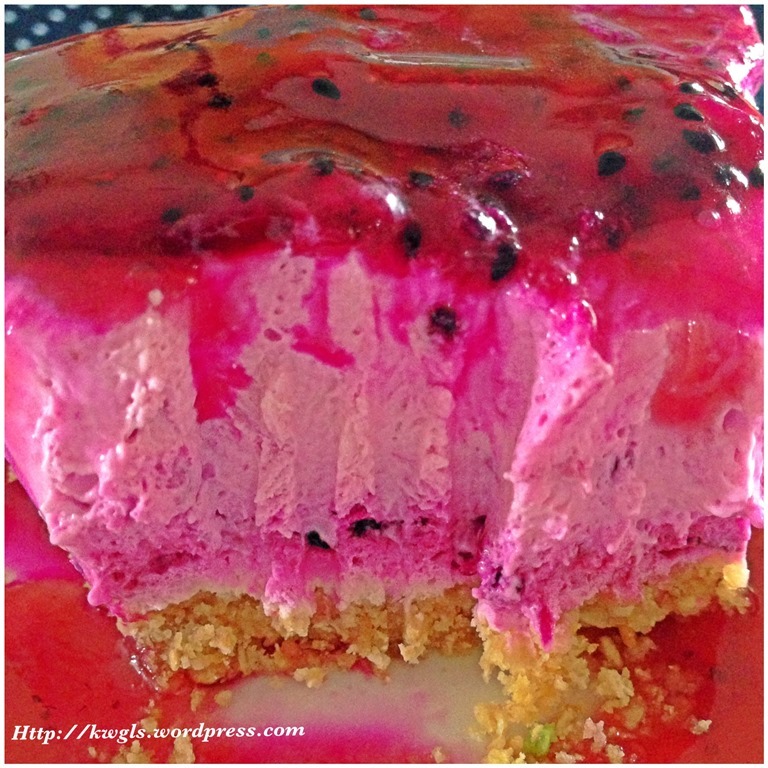 I looked up my favourite dessert cookbook “The Essential Dessert Cookbook” published by Murdock Books 2007 and found this Raspberry Swirl Cheesecake that I have always wanted to try but do not have the opportunity as it is not a seasonal fruit in Singapore and Malaysia. 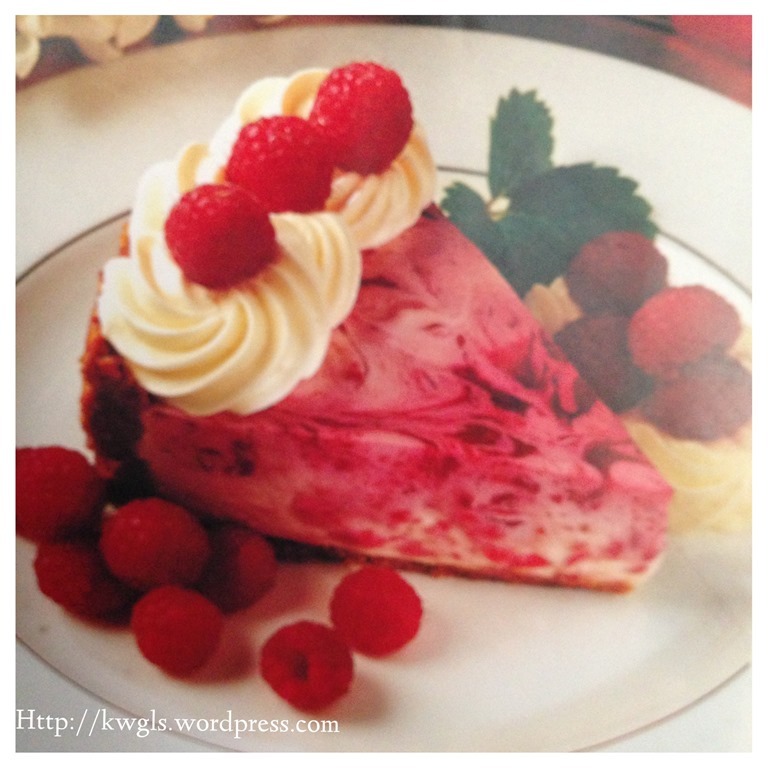 Prices of raspberry were rather costly and readers may not have a chance to prepare the cake if I blogged about it. 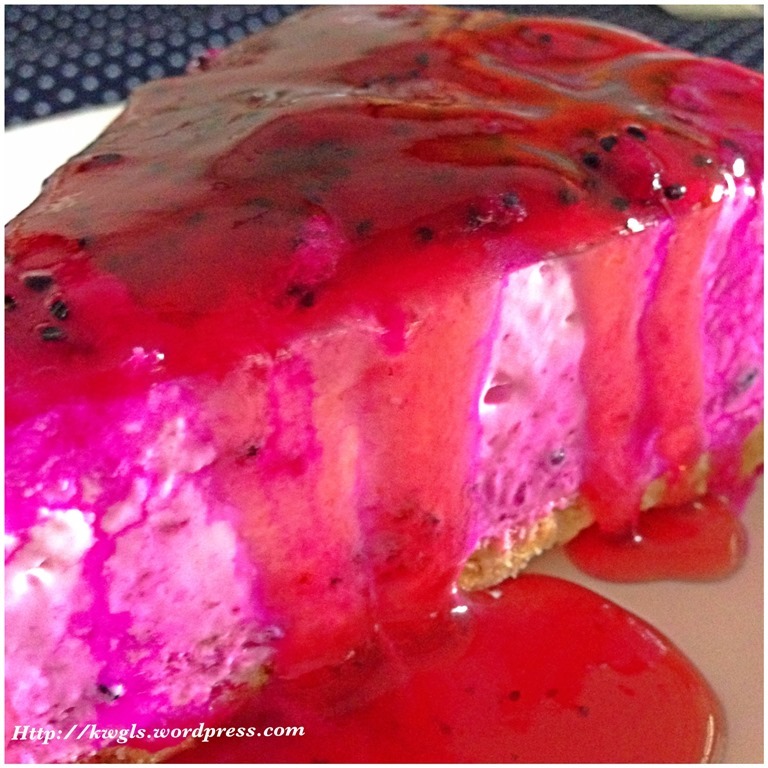 So I have decided to use red dragon fruits for the cake. 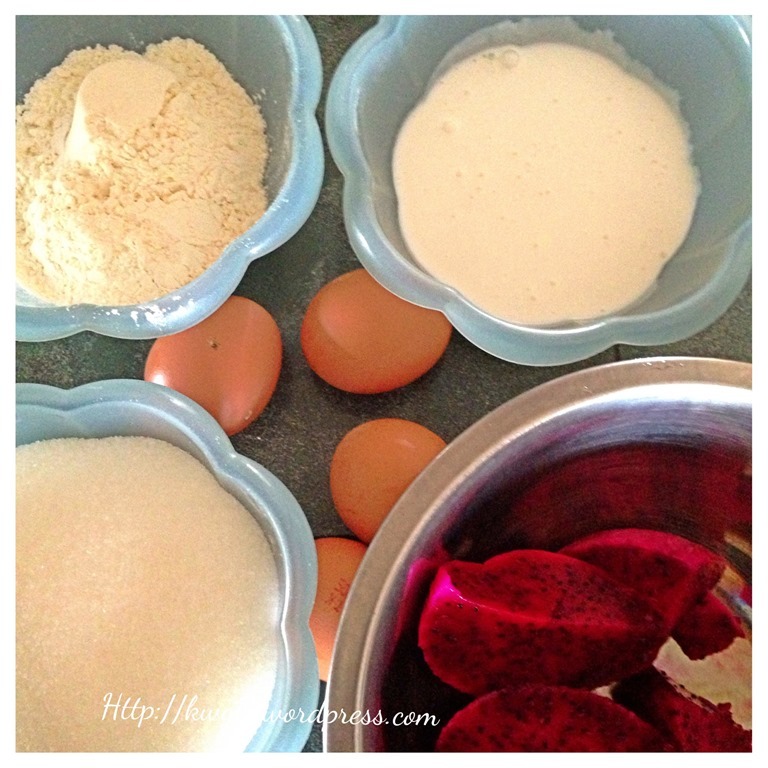 Blend the biscuits in a food processor. Add the melted butter to the biscuit crust and mix well. Have a 9” diameter spring form baking tin, spoon the crushed biscuits and press firmly against the base of the baking tin. Chilled in the refrigerator for at least half an hour or until firm. Lightly grease the sides of the baking tin with butter. For biscuits, it can be any type of biscuits. In fact I have used some biscuits that have some meringue on top and therefore you can see some coloured meringues in my biscuit crusts. Have a metal bowl, put in 1/4 cup of water and sprinkled the gelatine on top of the cold water as evenly as possible. 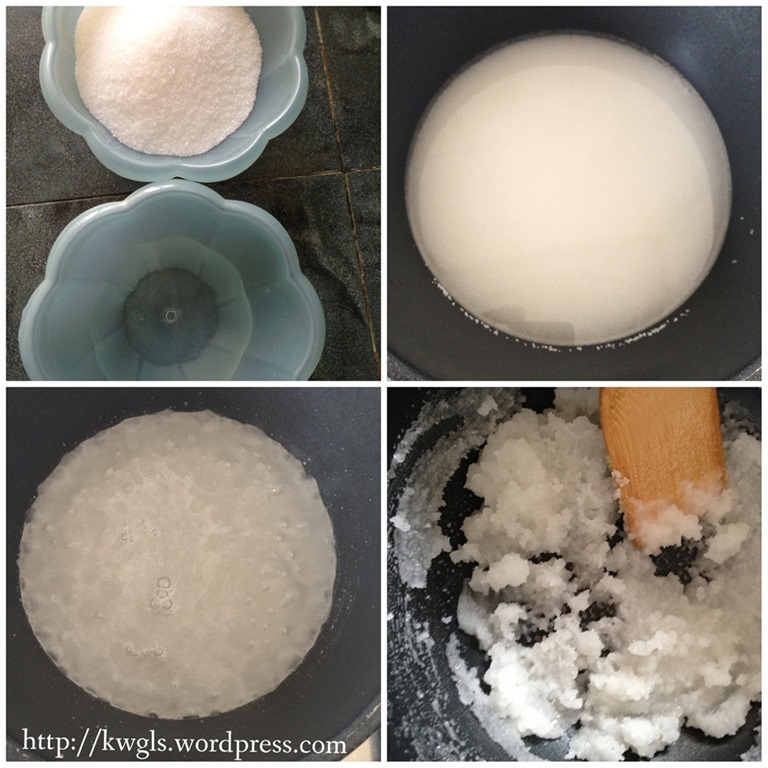 Use a tablespoon to lightly stir the gelatine powder solution and ensure all the gelatine absorb the water. Bring a pot of water to boil in a stove. Turn off the heat. Place the metal bowl with gelatine on top of hot water, stir until all the gelatines are dissolved without signs of gelatine powder. Leave the metal bowl floating in the hot water for later use. 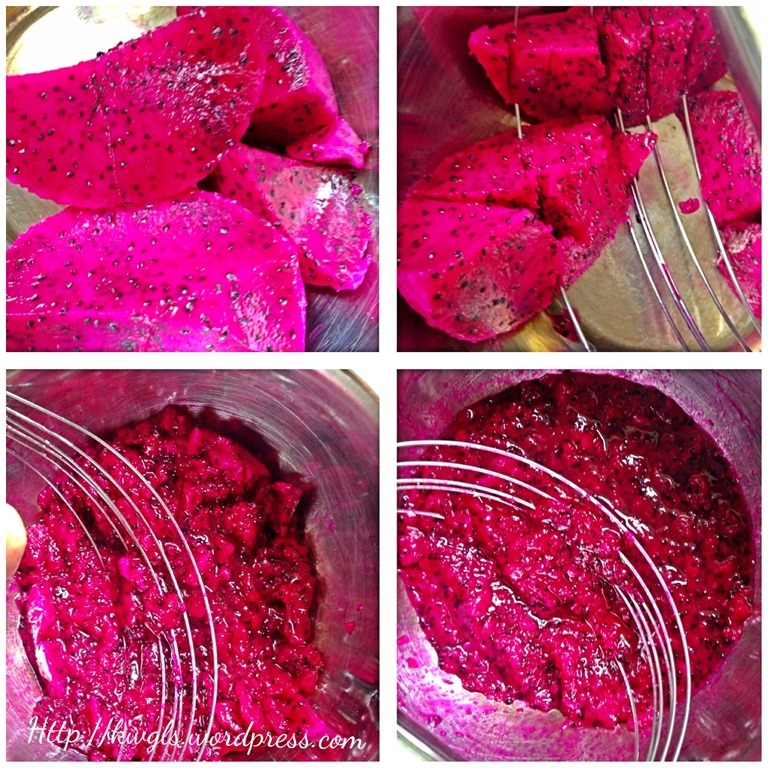 Put the dragon fruits in the food processor and blend it until it become puree form. Add in half of the gelatine and set aside for later use. 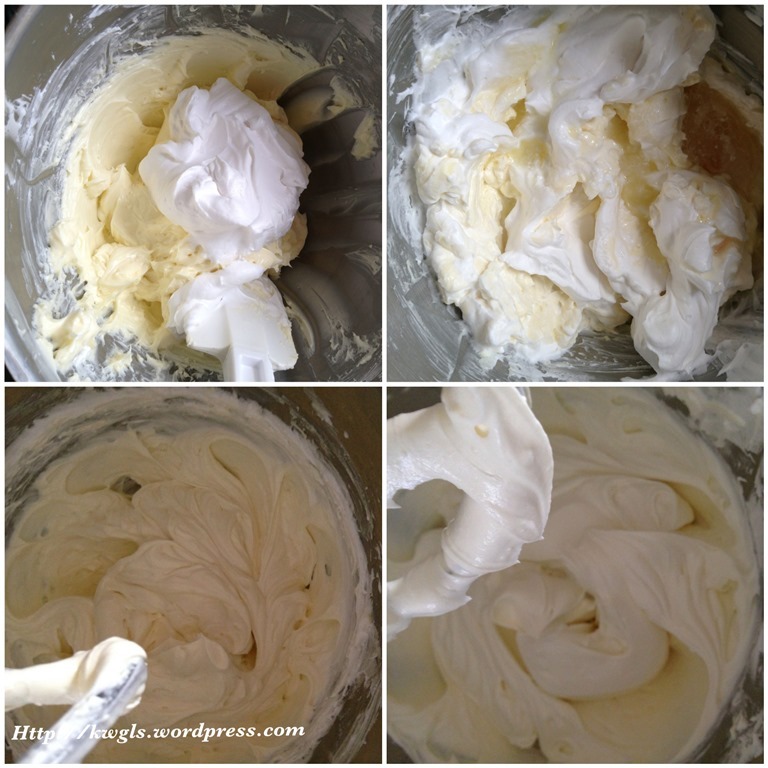 In a standing mixer, whipped the cream until firm peak form and set aside for later use. 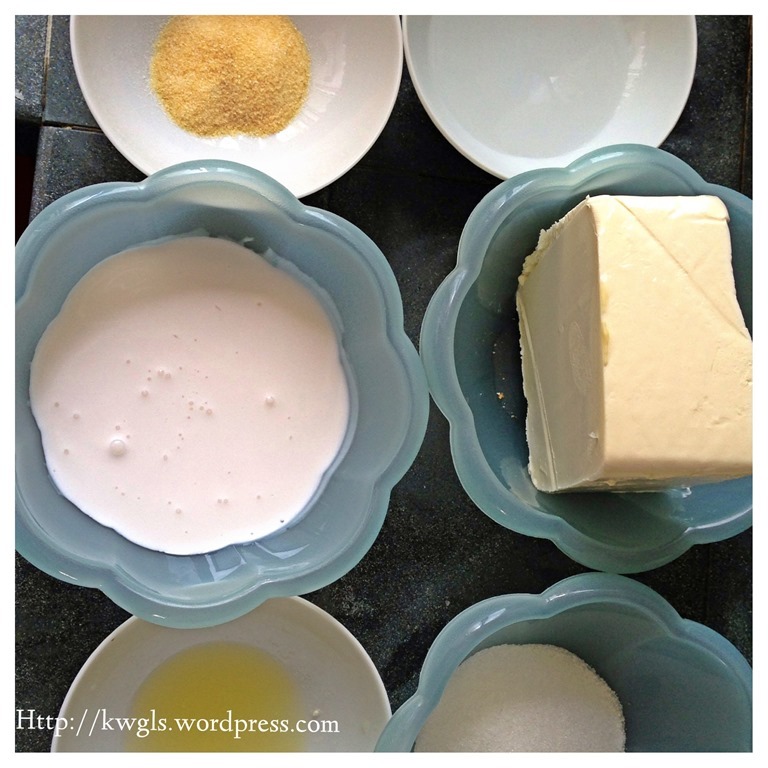 Using the same mixing bowl, put sugar and softened cream cheese. Beat until light and smooth. Scrap bottom of the mixing bowl and ensure there are no deposit of cheese at the bottom of mixing bowl. 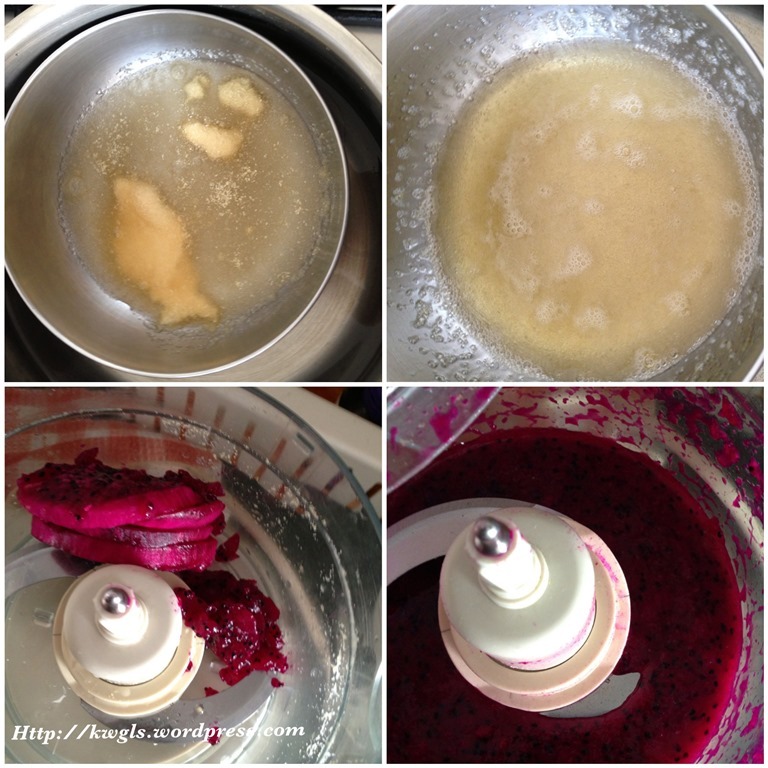 Add in half of the gelatine, lemon juice and whipped cream, use the slowest speed of the mixer to whisk until well mixed as indicated in the fourth images. 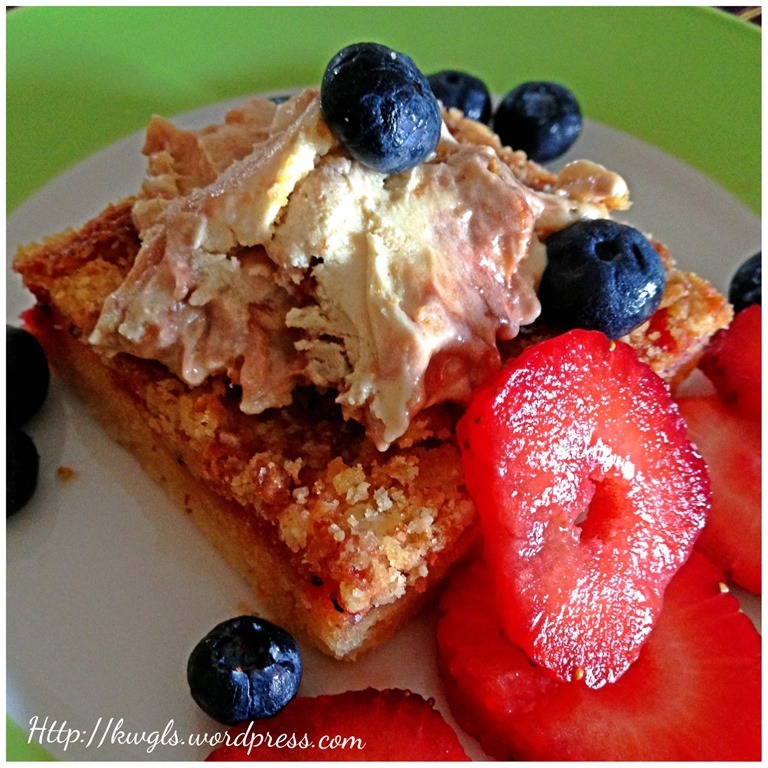 Take out the spring form tin from the refrigerator and place some whipped cream cheese on top of the biscuit crust. Place two to three tablespoons of dragon fruit puree on top of the whipped creamed and followed by another level of whipped cream cheese. 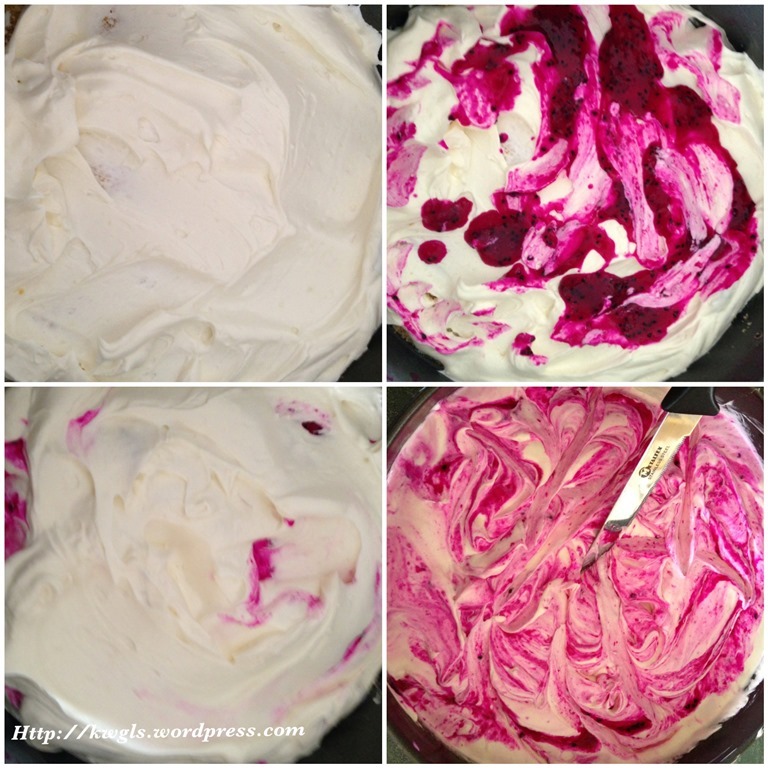 Perform the same procedures alternating between whipped cream cheese and dragon fruit puree until all was done. 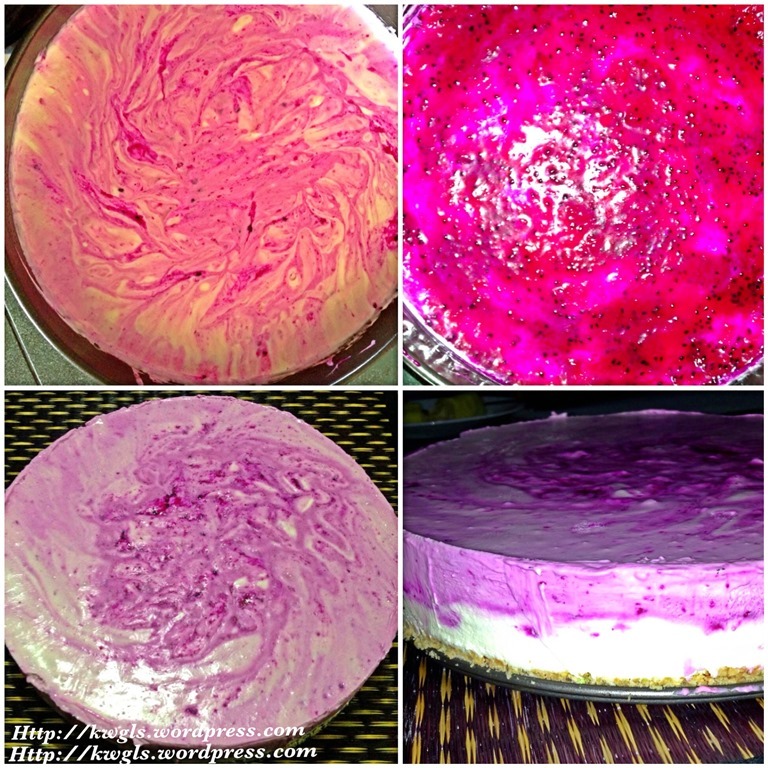 Use a knife to lightly swirl through the cheesecake. 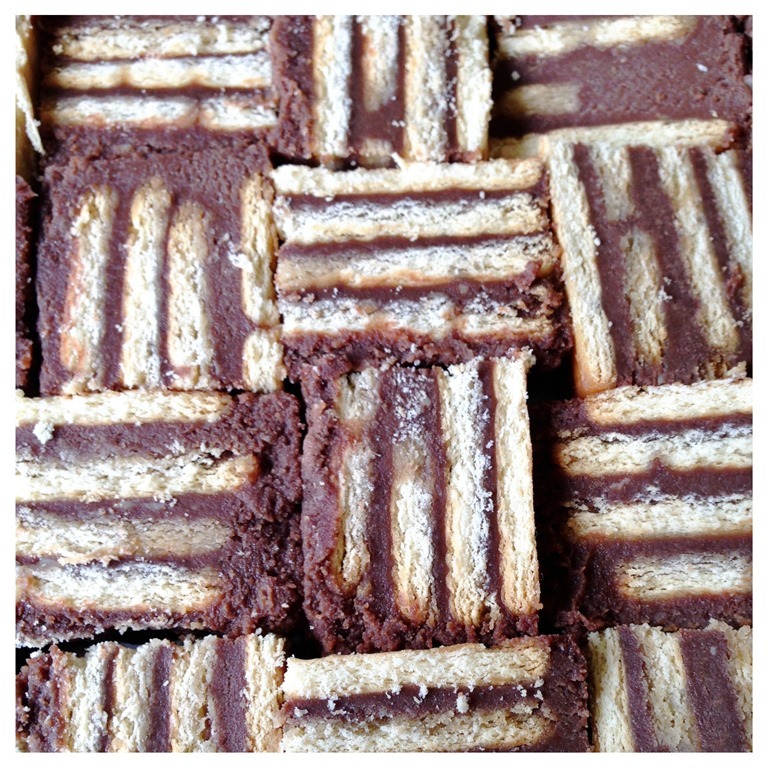 Lightly tap or shake your baking tin and you will see patterns start to evolve. Chilled in the refrigerator for at least 4 hours before serving. 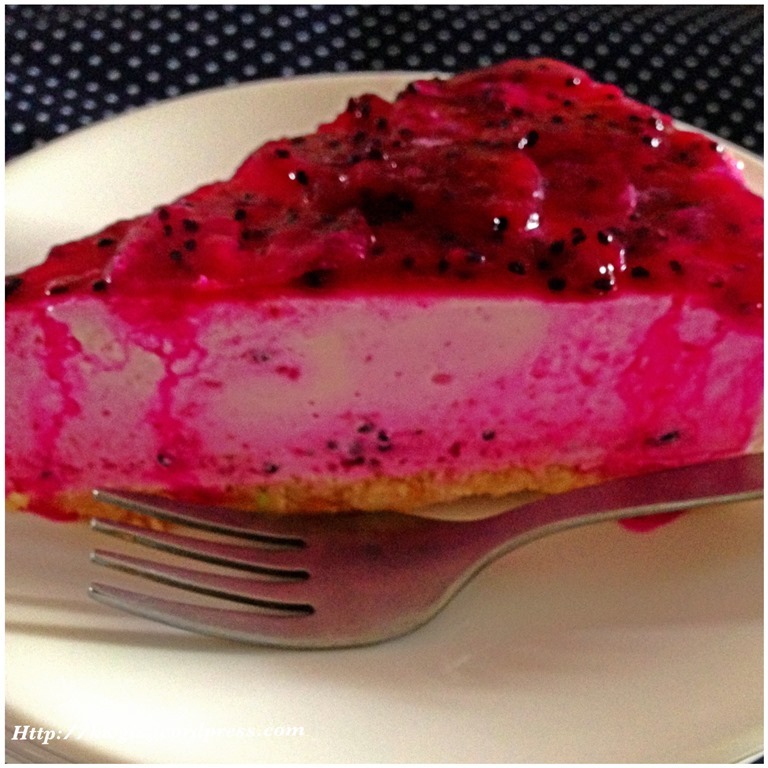 Top with whipped cream or additional red dragon fruit or other topping as you wished. Not as difficult as one thinks to make this cake, The visual effect, in my humble opinion is astonishing. 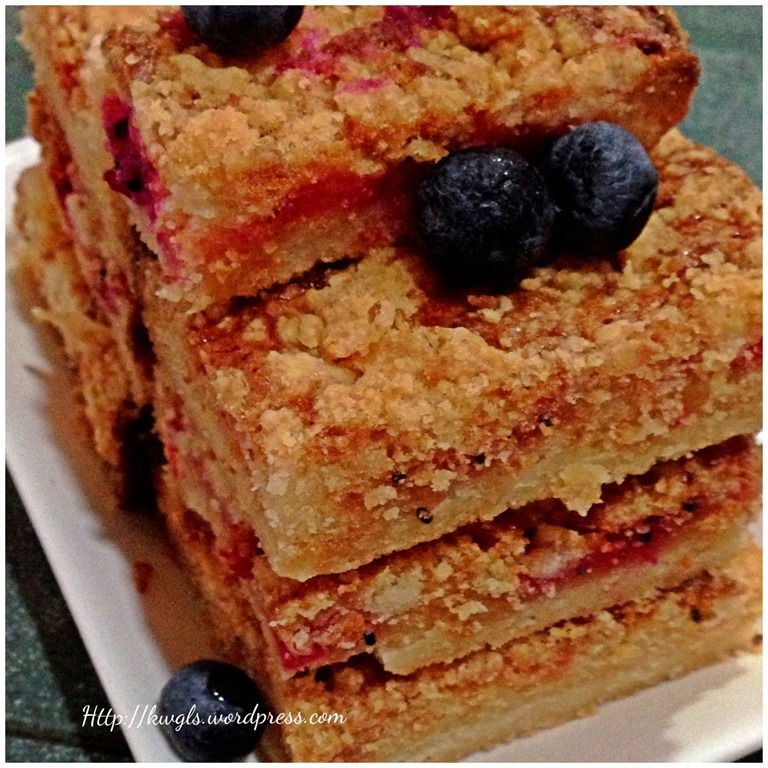 While in my red dragon fruit pie bars, the red dragon fruit appeared to be red in colour. 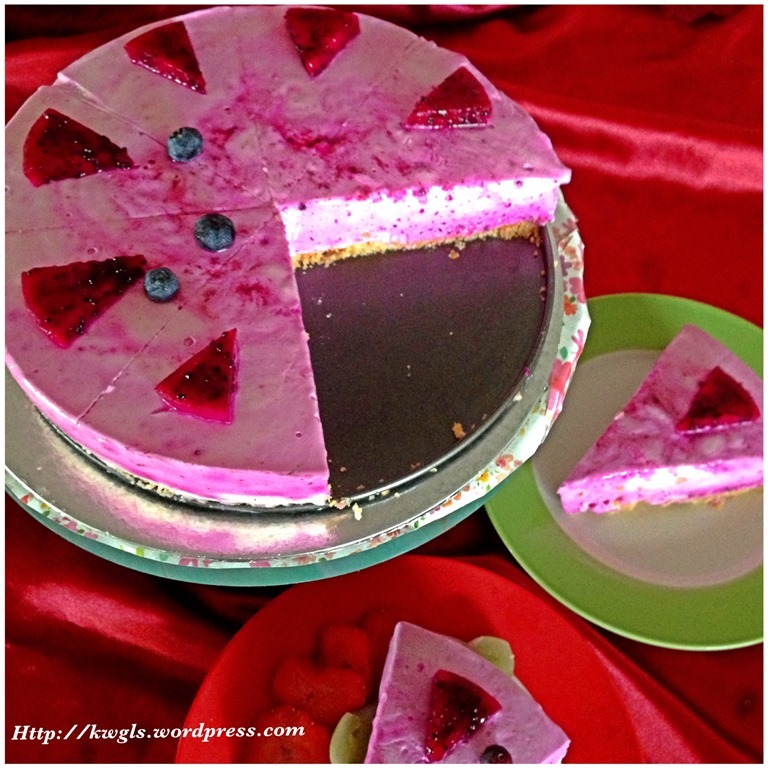 However, in this cake, it appeared to be purplish colour which shocked me! It is a big cake, a 9” inches diameter cheese cake, I am now thinking how I can finish the whole cake! Haha. 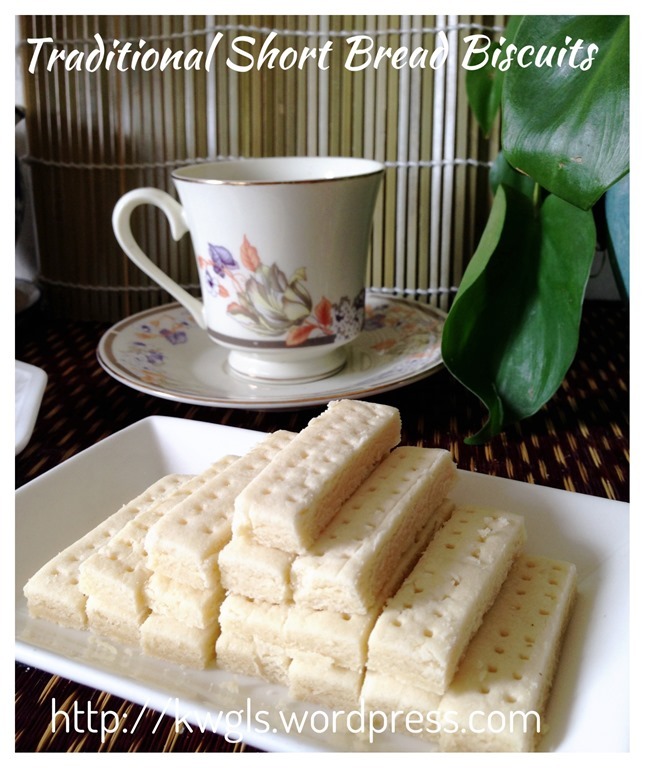 If you are interested on cheese cakes, you may want to check out my other two cheese cakes – Durian Cheese Cake , Ferraro Rocher Ice Cream Cheese Cake not forgetting the peanut flavour cream cheese ice – cream. Saw some blueberry in the supermarket and I have decided to update this post with some new pictures. 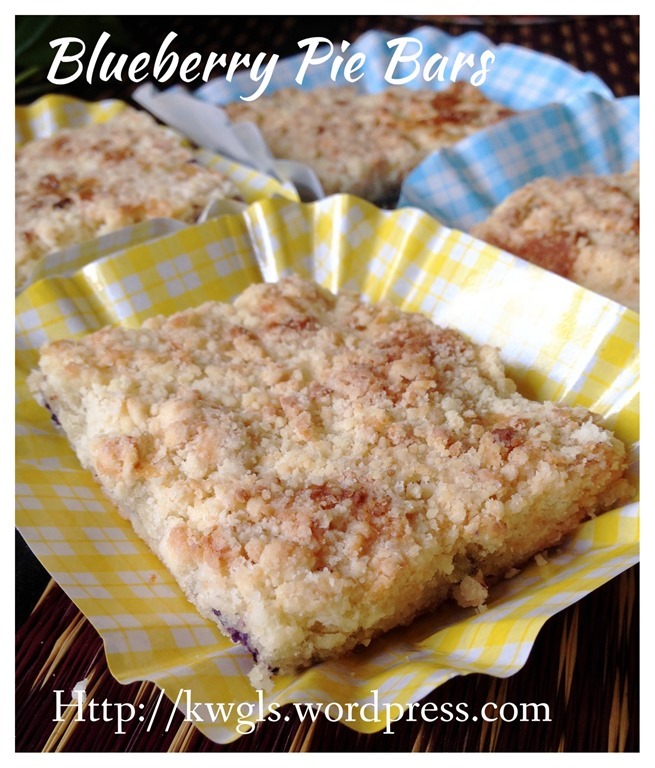 Decided to prepare blueberry pie pars.. 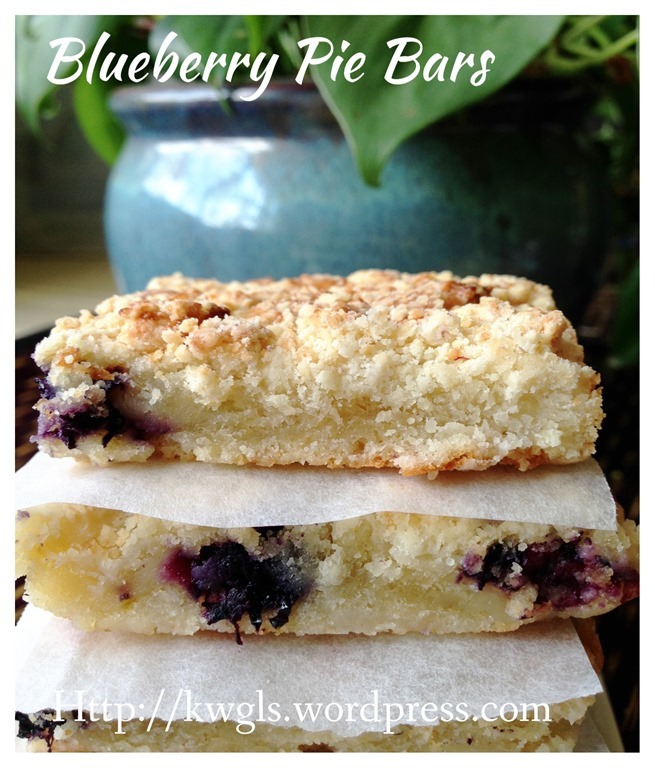 I have always loved pie bars especially its crumbly top.. 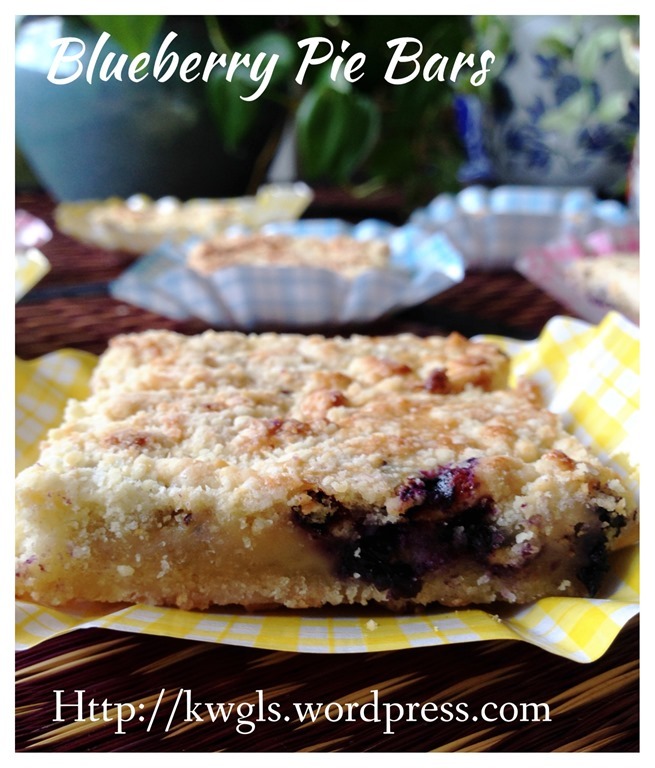 Unlike normal pie, pie bars have more short crust pastry than its fillings. If you like short crust pastry of any sort, you shall try this..No major changes in the recipe, just torn down the sugar content to suit Asian taste buds..Changes are highlighted in red. 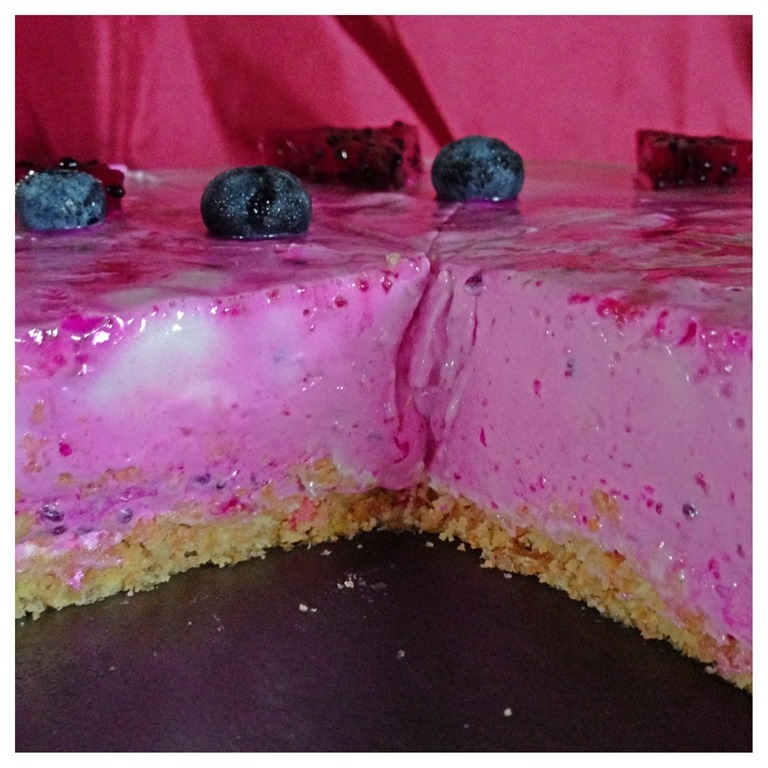 I have been challenged that most of my recipes that I have written are very “colourful”. If you think that I like permitted food colouring, that is not entirely true. You may have seen a few post that uses food colouring, but that essentially was because I am doing it more for illustration and picture taking purposes. If you read my post on Rainbow Loaf, you will understand how I justified the usage of permitted food colouring and struggling whether such a post should be issued. While I don’t encourage the use of food colouring, but we have to be realistic in our daily lives. I strongly believed the usage of permitted food colouring are all over the food outlets. What about Angkukueh? Do you think all mango puddings are consistently as yellow as what you saw every time your bought it? 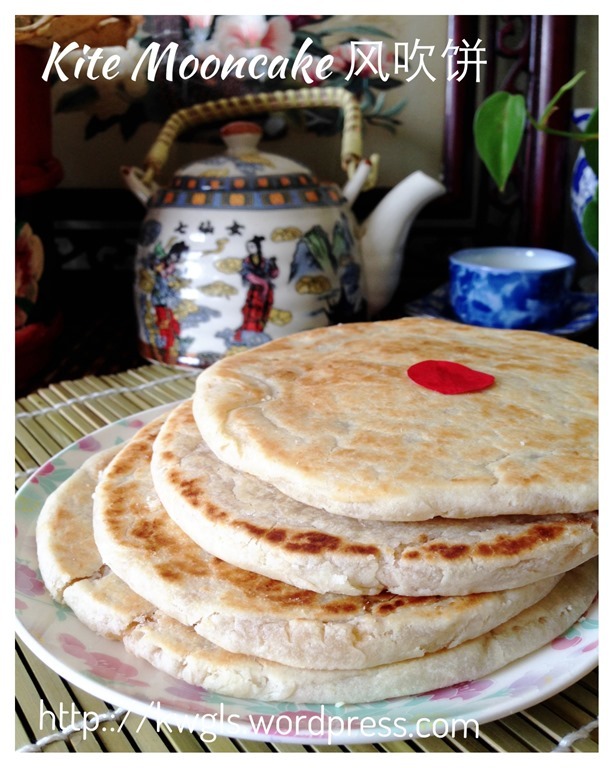 How about various type of tapioca pearls, milk teas, pasta sauces or even moon cakes? Well that is up to individual and I tend to choose to believe that NOT all the green colour in the Pandan Kaya or Kueh Srimuka/Salat that are sold in eating outlets are all from the Pandanus leaves…. This post is using a natural colour. A colour that I am very hesitant to touch. I even hate it when it stained my cloth! 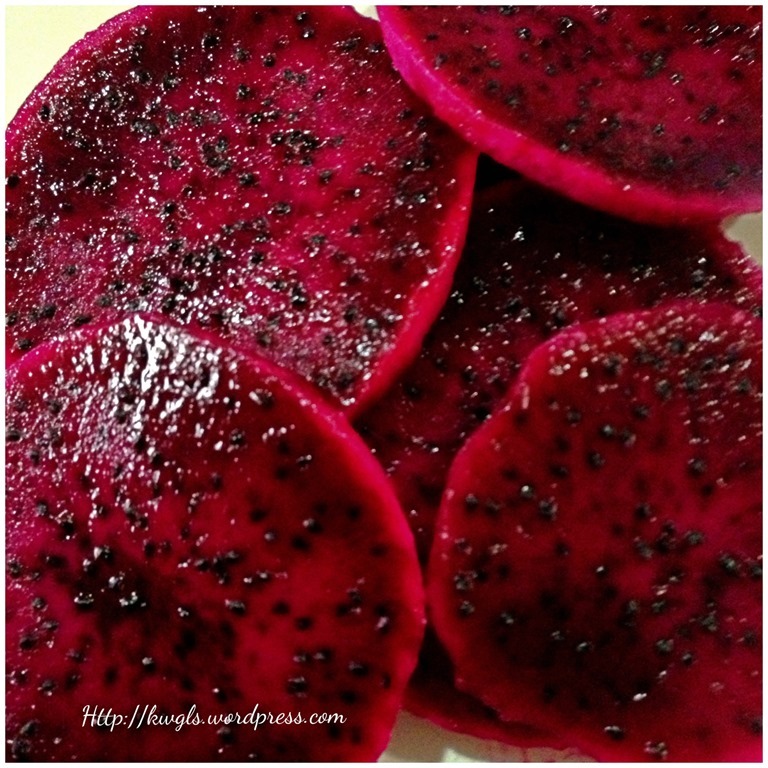 It is one of the very strong natural colour – Purplish Red dragon fruits. 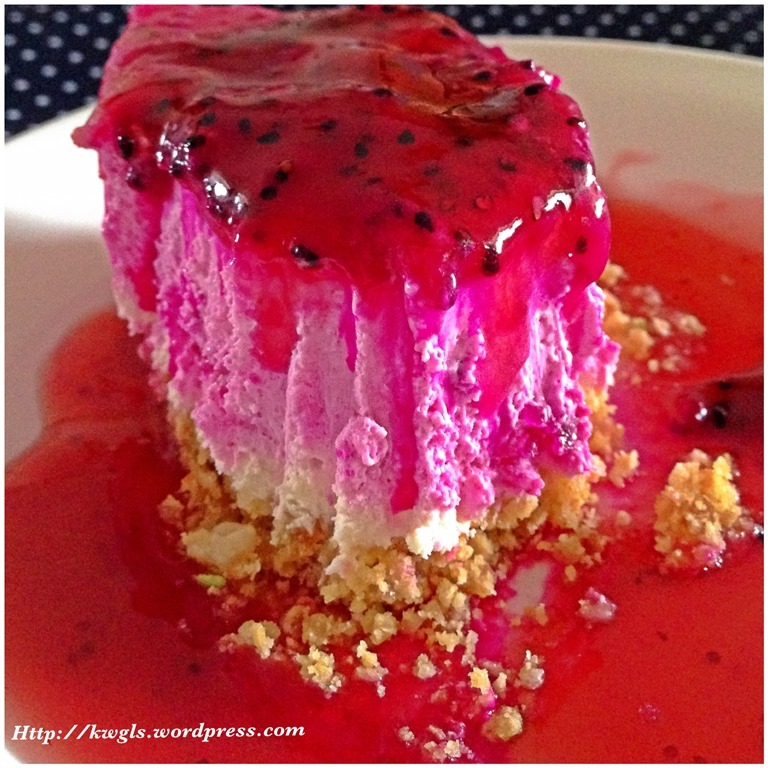 There is an influx of purplish red dragon fruits in Singapore supermarkets in current year. Though I do not really like to touch the colour by itself, but I do believed it will help to create a visual effect in pastry’s presentation. In last week’s marketing, these dragon fruits were on sale and I managed to get 2 big red dragon fruits for S$2.50.. I think that it is a deal and I think I should made use of its natural colour to make some pastries. 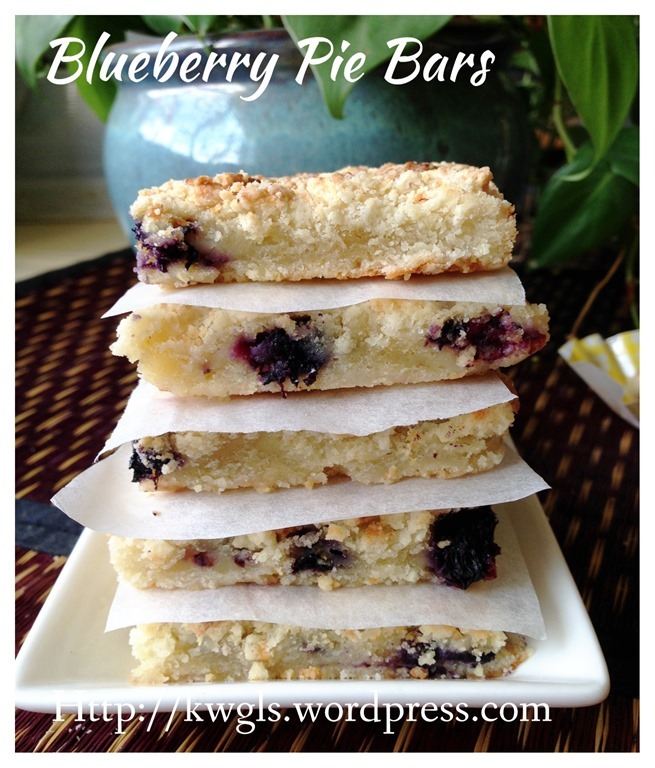 Then it reminded me of some blueberries pie bar that I read while browsing the internet. therefore, I have decided to use these dragon fruits to prepare some dragon fruits pie bars..
Pie bar is a type of short crust pastry usually loaded with seasonal fruits and served as desserts. Fruits that are usually used include strawberries, blueberries and blackberries. Use some kitchen utensils or sharp objects such as forks or knifes or potatoes mashers to mesh the dragon fruits. Get ready a baking tray of 12” x 15” baking tray. 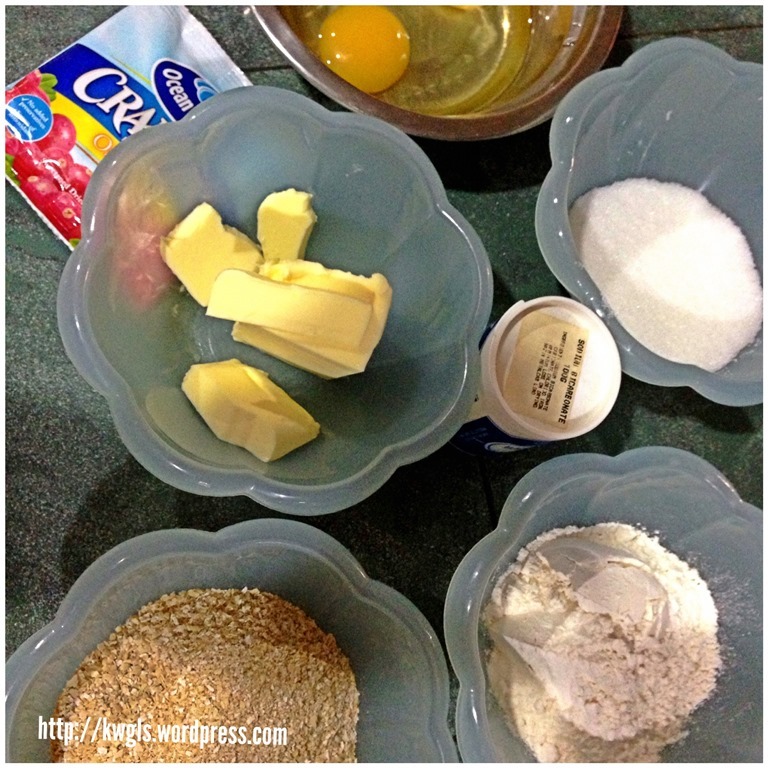 In the big mixing bowl, put cold cut butter, flour and sugar. 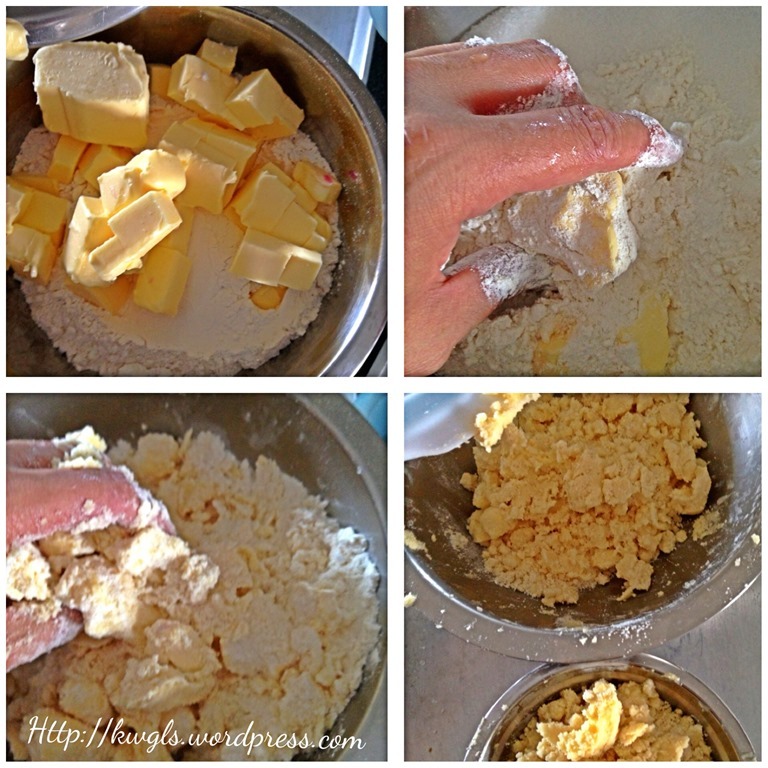 Use finger tips to rub the butter and flours mixtures together until resemble some crumbs. 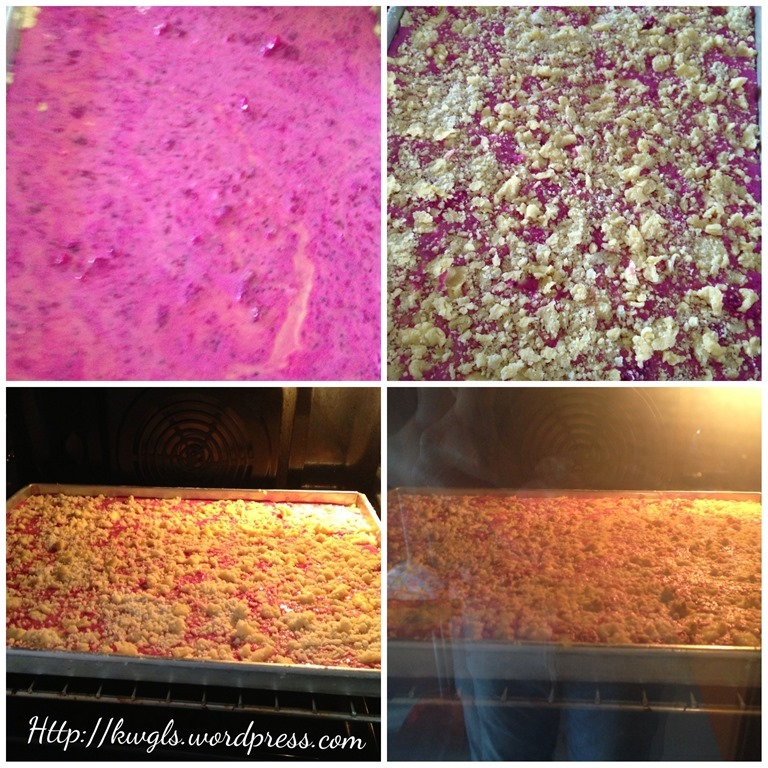 Divide the crumbs into two portion, one for the bottom layer and another portion for the toppings. 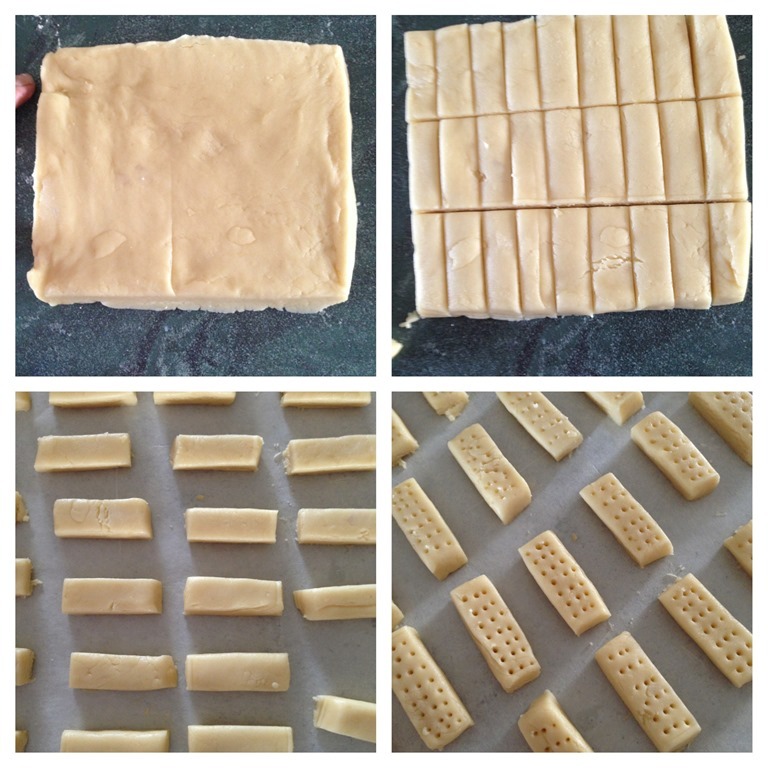 Press half of the pastry against the bottoms of the baking tray. 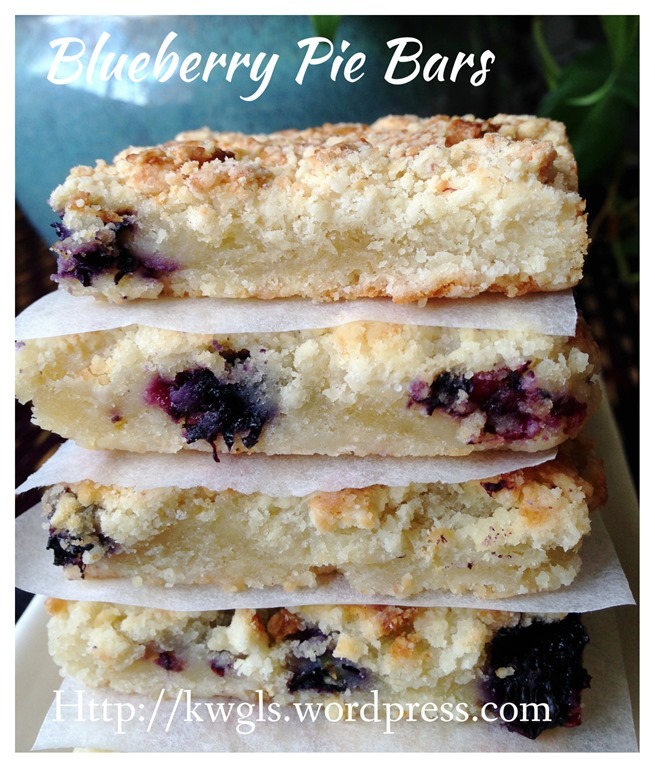 Use a fork to make a few holes in the pastry and set aside for later use. In another mixing bowl, beat eggs, sugar, and cream together. Add flour and followed by mesh dragon fruits and mixed well. Pour the dragon fruits fillings on top of the pastry. 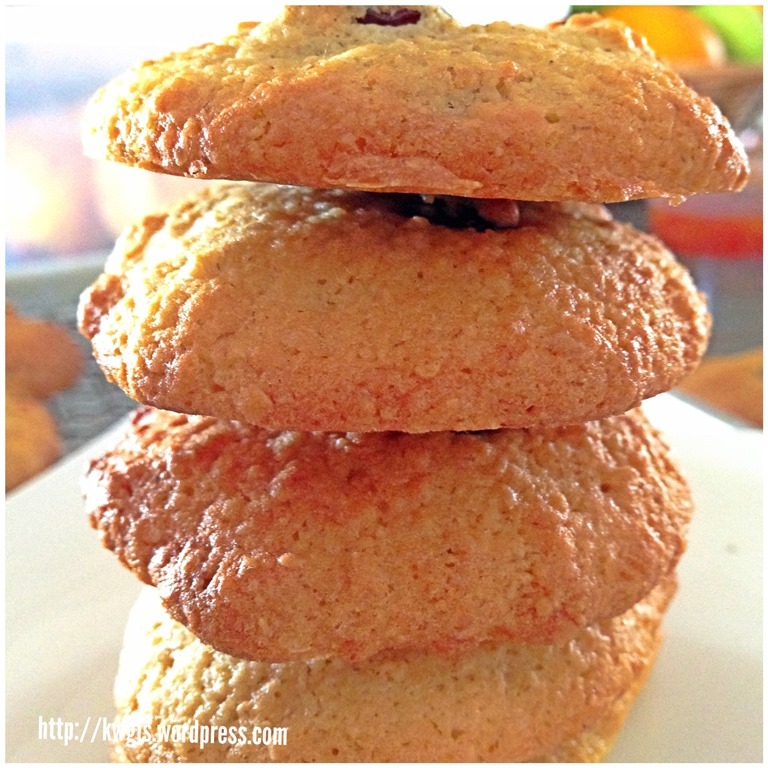 Sprinkle the remaining flour mixture evenly over the fillings. Bake in the oven for about 45 minutes at 180 degree Celsius. Cool at least one hour before cutting your desired sizes. Best served with some whipped creams, ice creams, additional fresh fruits or on its own. 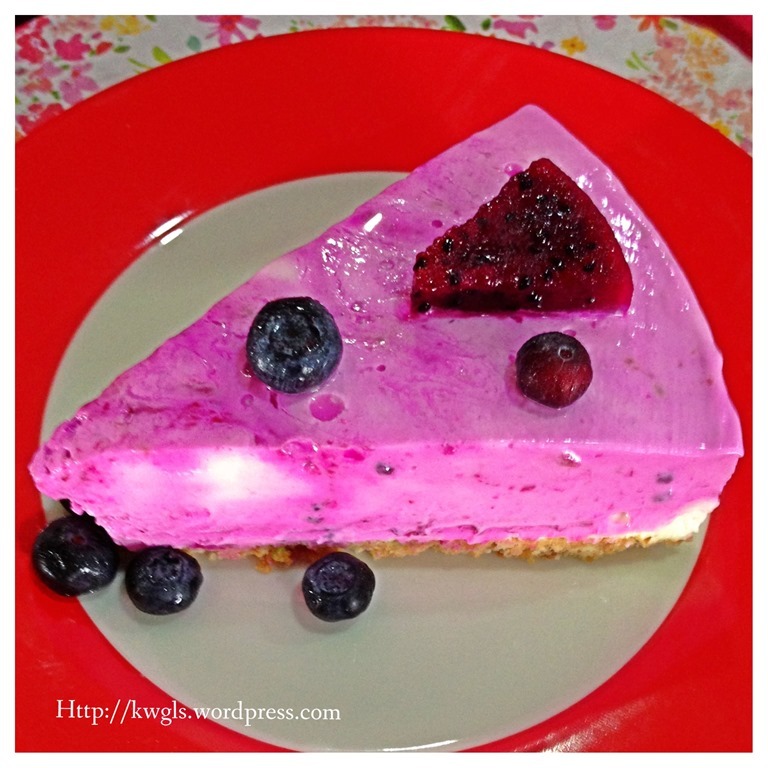 It is a dessert that is not that tough to prepare. I believed it is still relatively uncommon in Singapore and Malaysia. 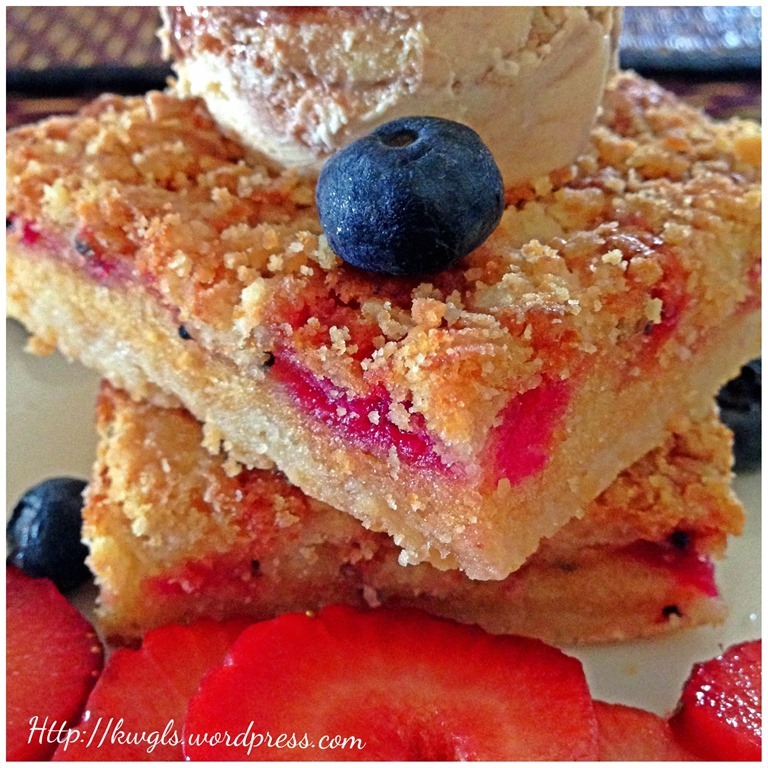 For a person with sweet tooth like me, I definitely wouldn’t object such a treat. The crispy and crunchy toppings resembles a bit of the biscuits with some mild fruity flavour of the red dragon fruits. I have hold up this post for one day as I am unsure about the colour combination and the acceptability of this desserts in this area of the world. 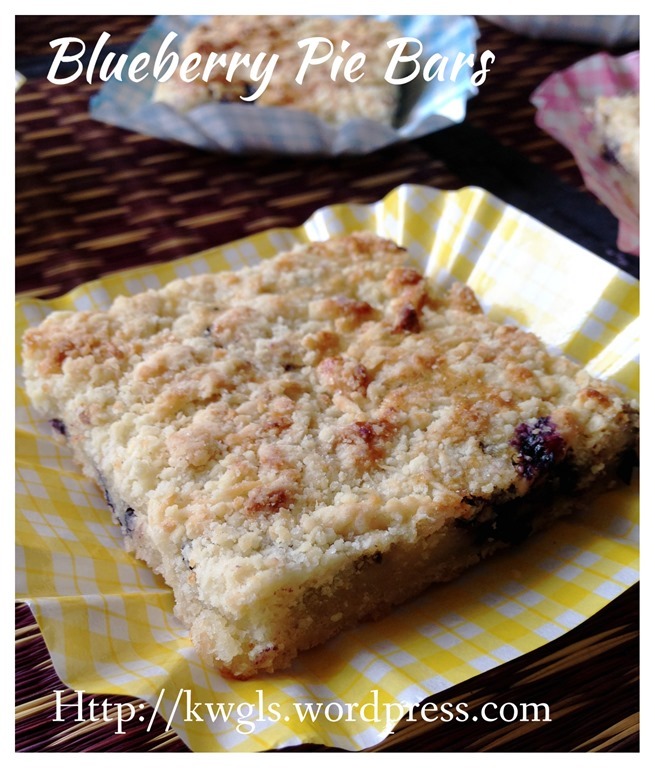 When I posted up to one international communities in Google Plus, I was being encourage to proceed with the post as the pie bars looks appetizing.. Thanks to those members who have encouraged me to have this post. 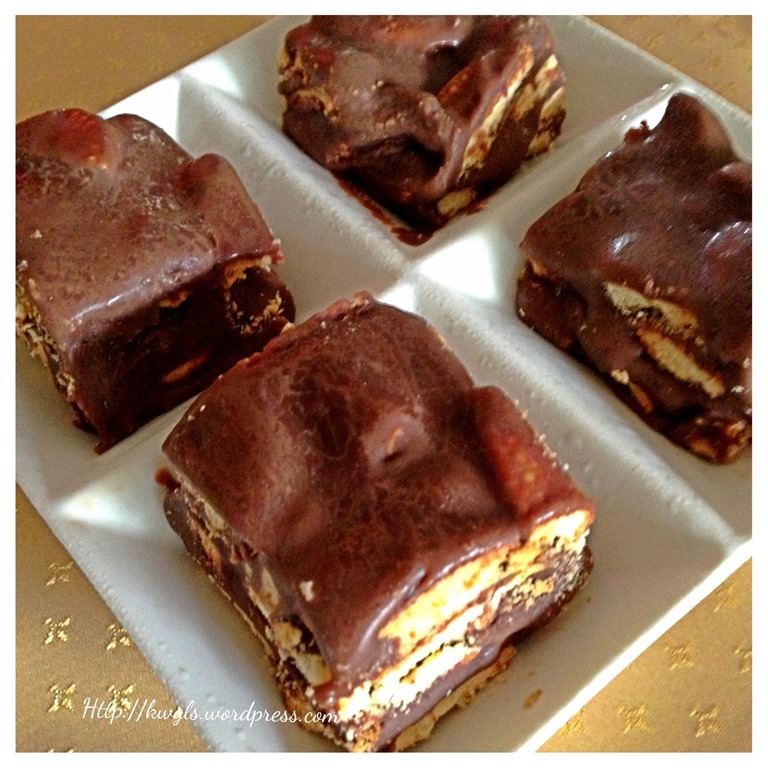 For more recipes, you can refer to my RECIPE INDEX (updated as at 26 November 2014) here and you can follow me at PINTEREST or visit the blog’s FACEBOOK PAGE to keep abreast of my future posts. 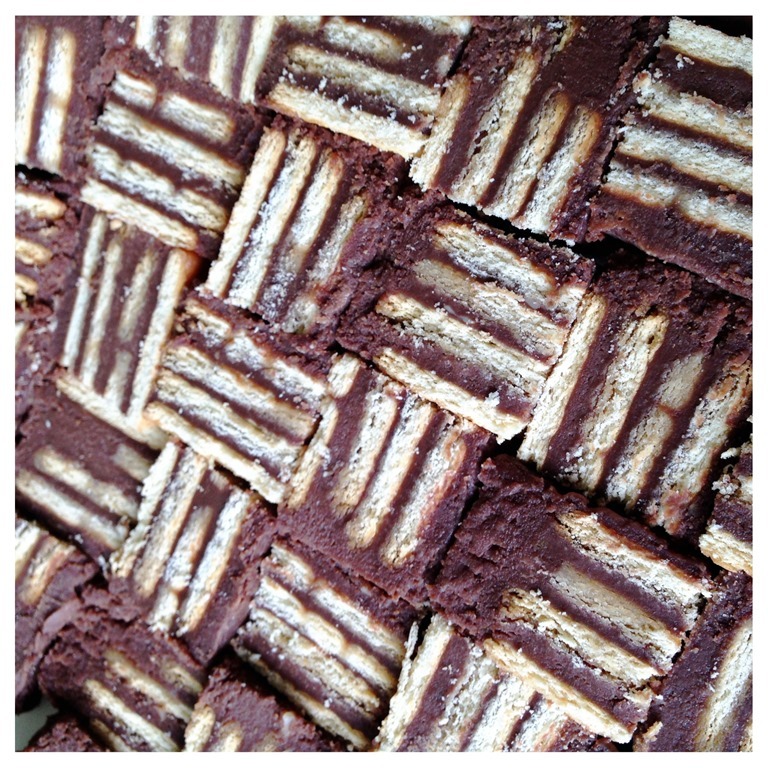 A biscuit that I like very much but went unnoticed because I did not like the initial pictures taken.. Since I have some cereal at home, I decided to prepare this for my relatives as a hand gift. 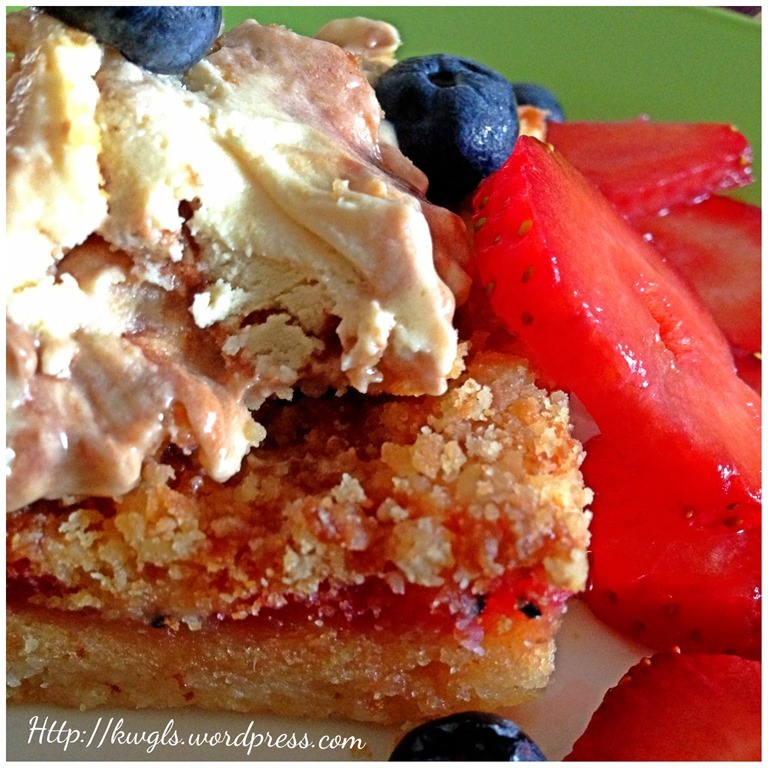 Nothing change except that I substitute the oats portion with instant cereal since I do not have it at home. In addition, instead of cranberry, I have used raisin instead. It is crispy outside and chewy in the middle. 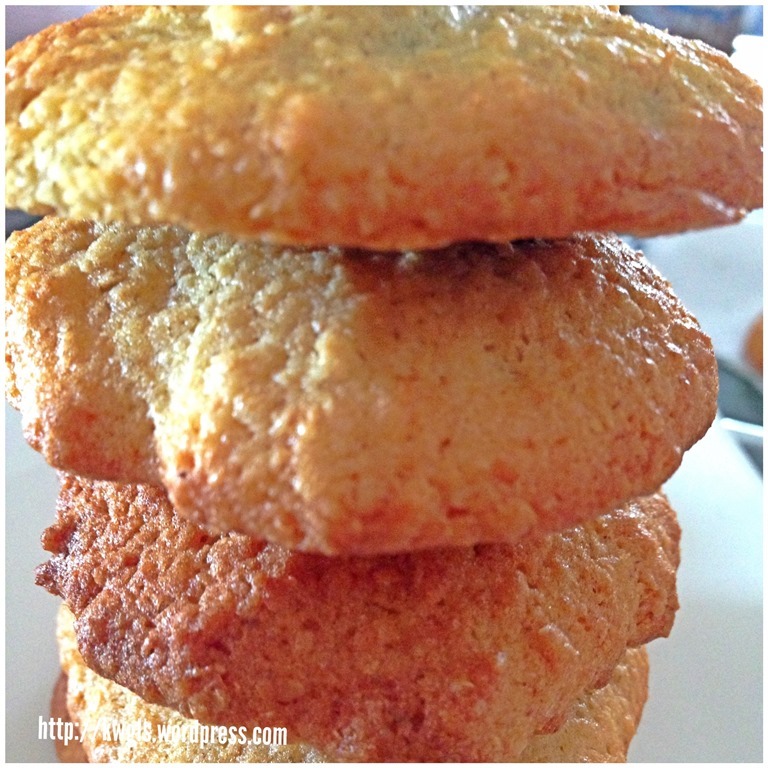 You can make it totally crispy if you make it a smaller size and extend the baking time at a lower temperature. A rather addictive cookie and I really love the cereal flavouring. One number baking ratio now extends it to biscuit and of course it had to be slightly amended. 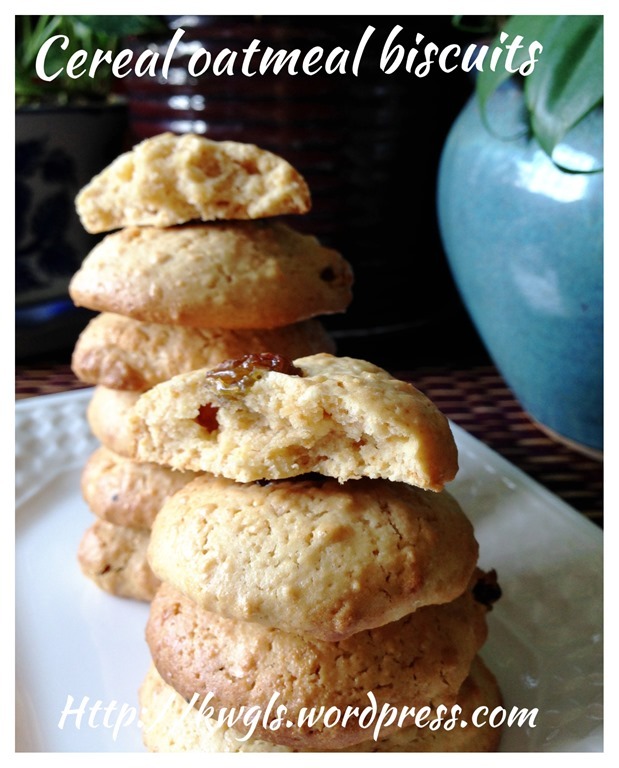 In this recipe, one portion of milk was being substituted by a portion of flour to make it a cookie liked structure. 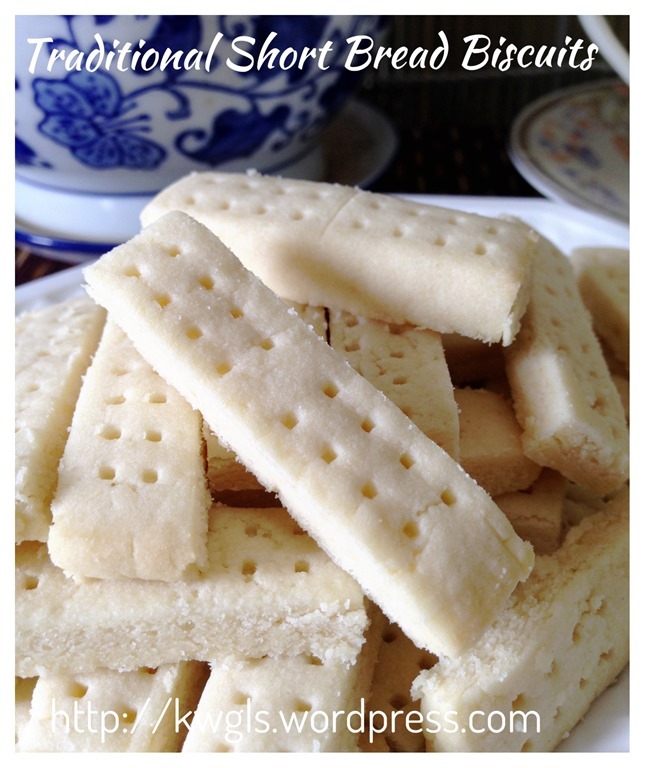 This biscuits can be a soft chewy type of biscuit that is crispy on the outside but slightly soft in the middle. 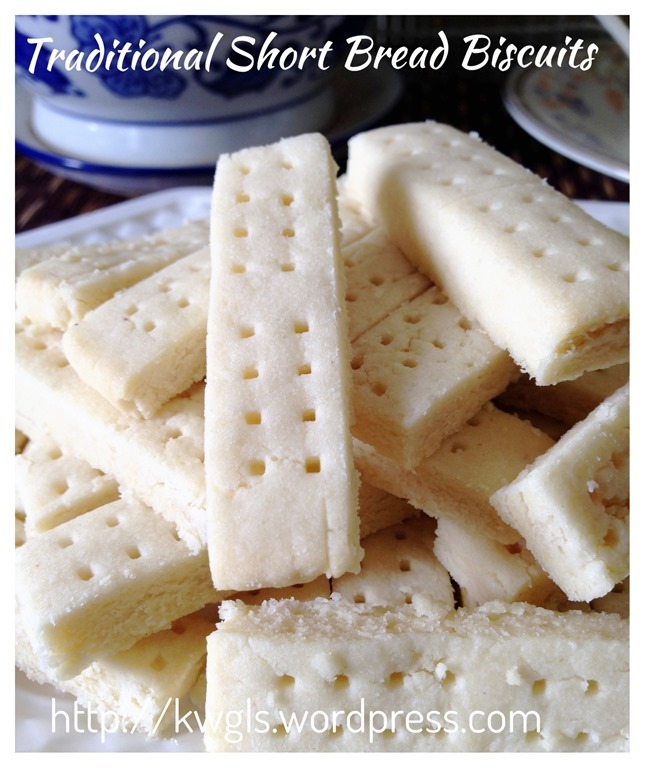 It can also be a crispy type of biscuits it you prefer it to be crunchy. This is not the first time I prepared these biscuits. 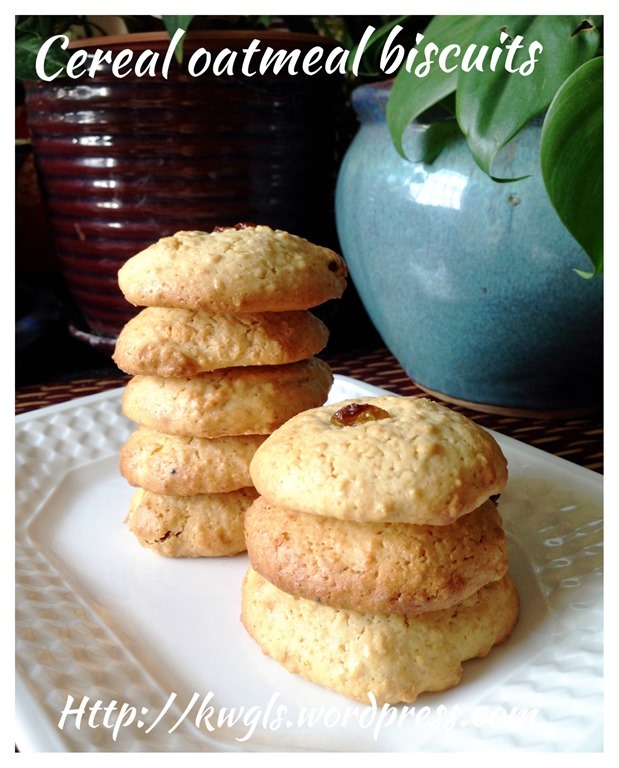 I prepared these biscuits a few months back. I loved it for its chewy texture and the baby cereal fragrance. I like to blend my instant Quaker Oats with the Nestum Baby Cereals and make it into a breakfast cereal drink. 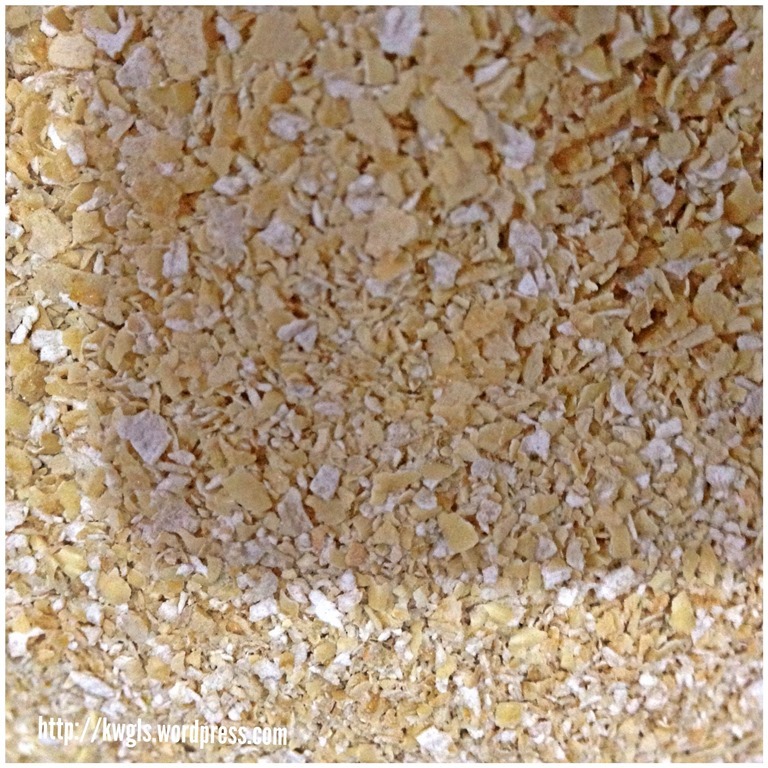 I usually put 50% of instant oats and 50% of baby cereals and use a food processor to blend these two items. The breakfast cereal drinks will have instant oats “stickiness” but with baby cereals fragrance. I usually sweetened it by some condensed milk and if it was too “sticky”, I will add in some fresh milk. Bananas and nuts were added when I craved for it. May be I shall have another post on this wonderful breakfast drinks and you wouldn’t be disappointed with this cereal drink.. Blend 50 grams of instant oats and instant baby cereal each using a food processor until your desired textures. 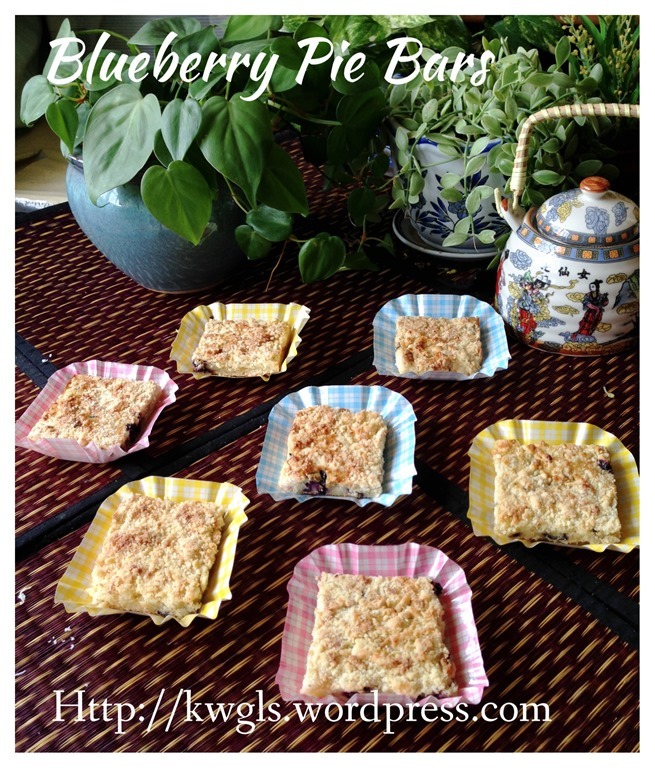 Get ready 2 baking trays lined with parchment paper or baking paper. Pre-heat oven to 180 degree Celsius. Cream the butter and sugar. Add the eggs and followed by the mixture of oats/baby cereals. Stir and mix well. 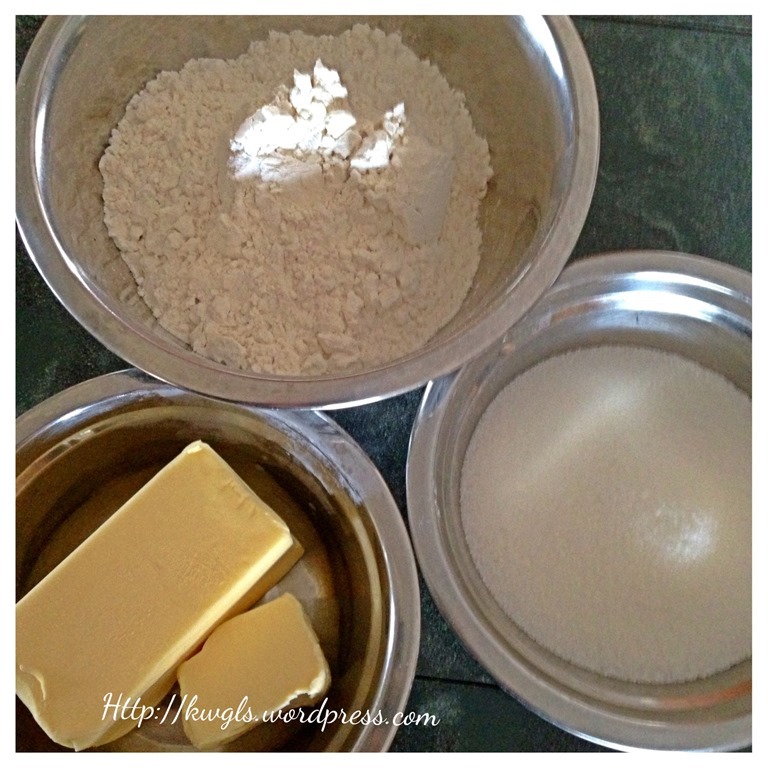 Add in the sifted flour, baking powder and baking soda, mix until just combined. 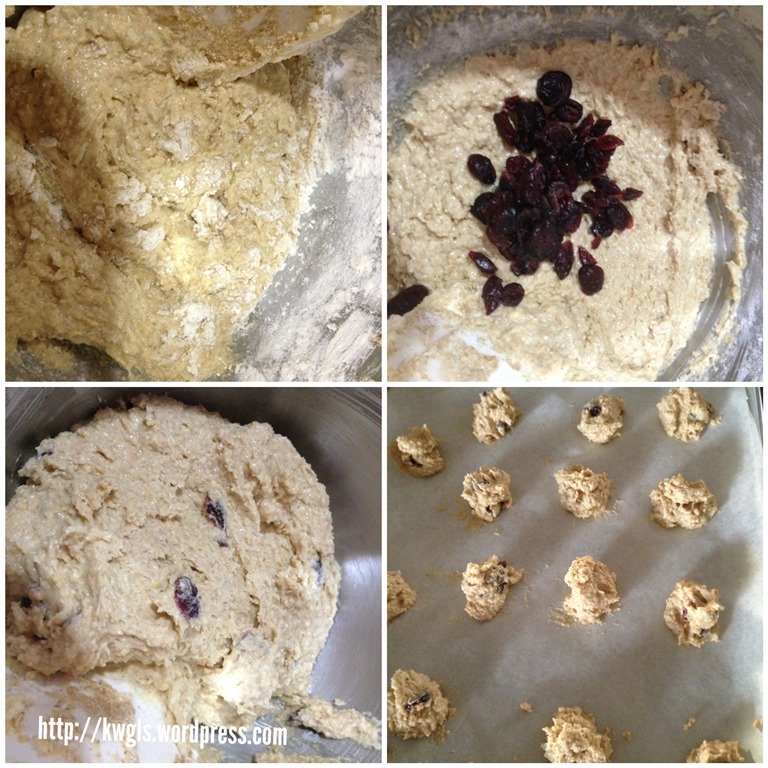 Stir in cranberries or raisins and mix well. Place one teaspoon/tablespoon full of soft dough (depending on the size you want) on the parchment or baking paper. Give adequate space for the dough to expand when cooked. Bake in the oven at 180 degree Celsius for 15-20 minutes or until the colour starts to turn golden brown on the edges but still soft in the centre. Cooled completely in a rack before store in an air tight container. Best served with hot tea and coffee and as a snack. If you preferred the crunchy version, after the 20 minutes baking at 180 degree Celsius, reduce your temperature to 150 degree Celsius and continue baking for another 10 minutes. 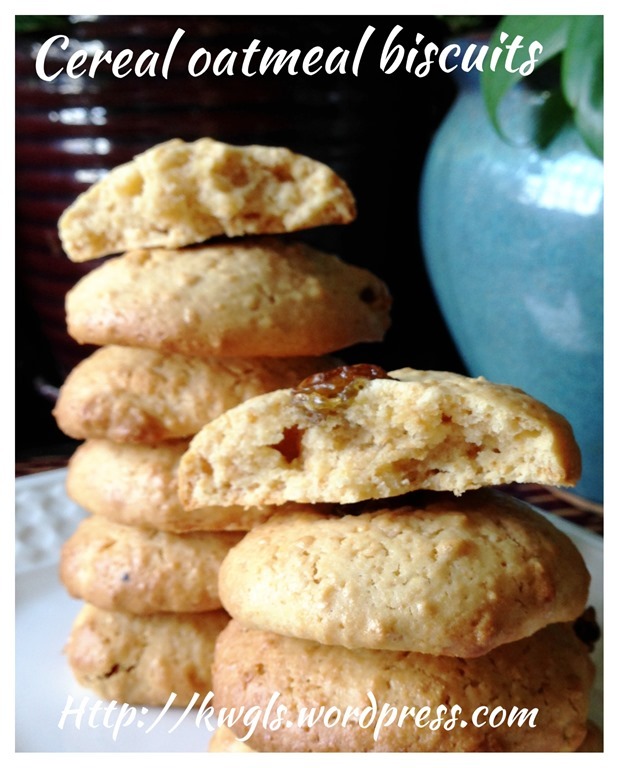 Note that the cookies will not be hardened until you take it out from the oven. 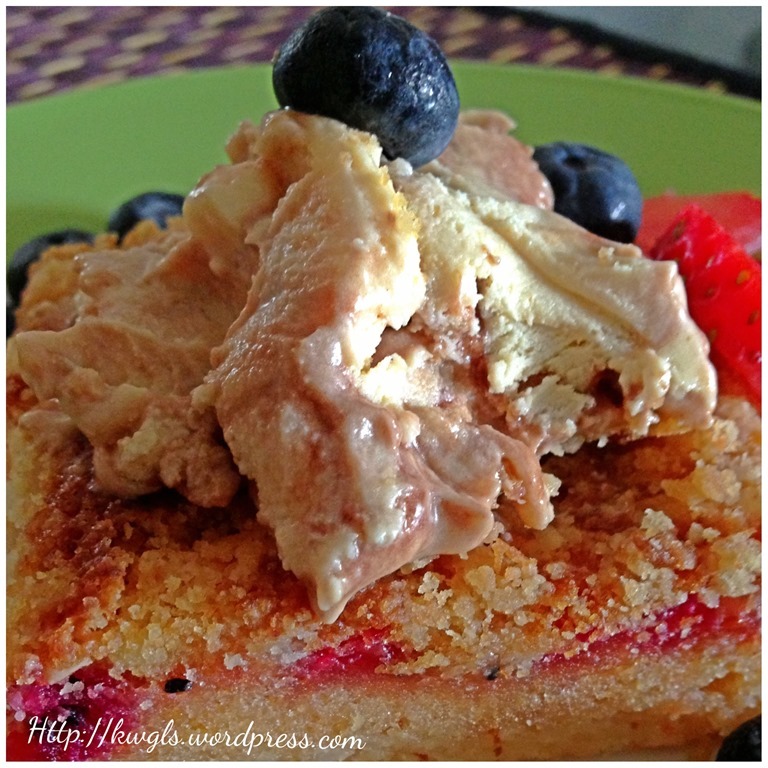 Let it cool and see if that is your desired texture. In the event you prefer to be even crispier, put back to the oven and baked for another 5 minutes. 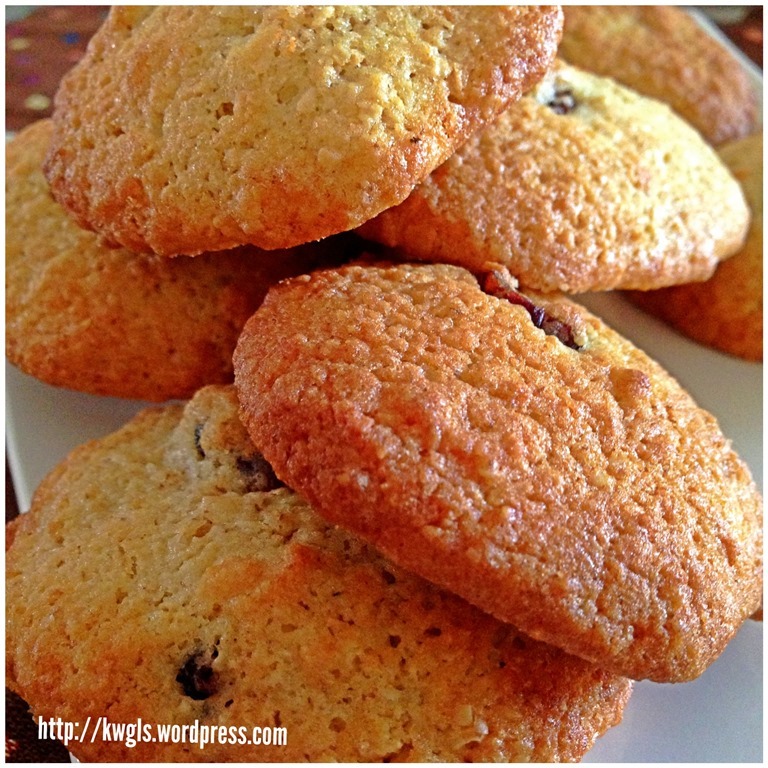 The longer you baked, the more moisture will be lost making it to be crispier. However, do watch out for the colour of cookies. 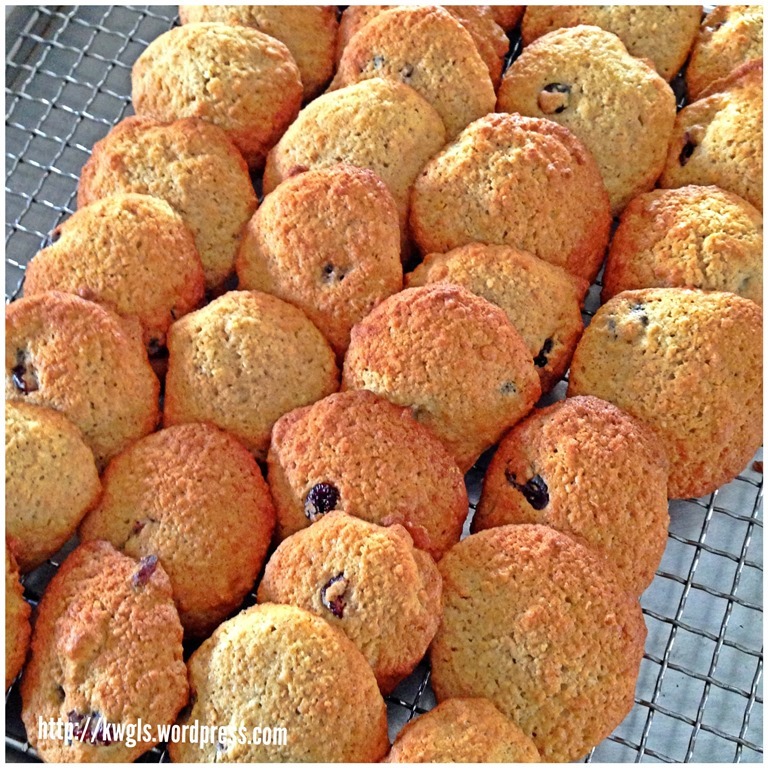 If it is too brown, you can turn off the top heat and use the bottom heat to continue the baking. 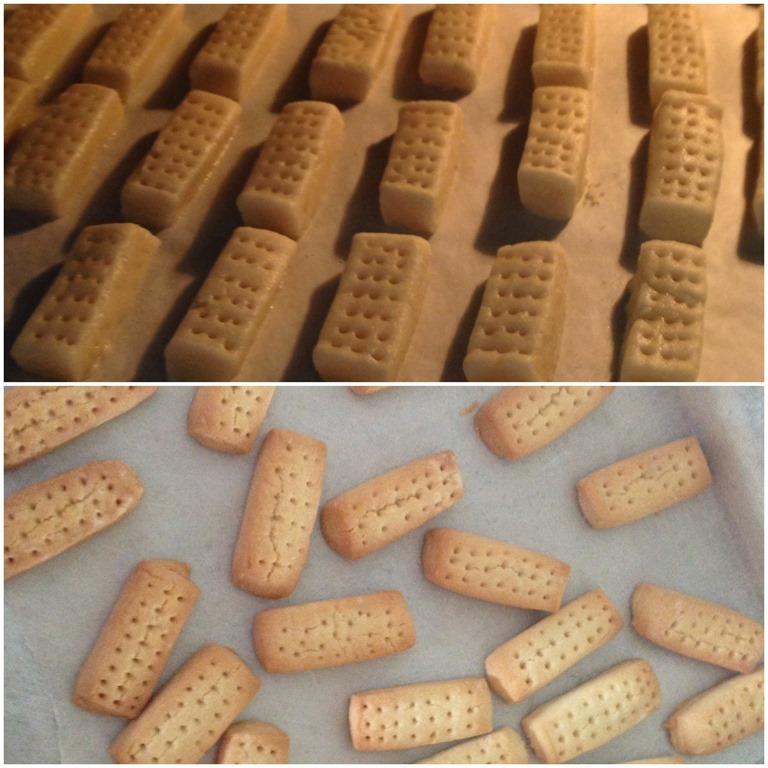 From preparing the biscuits until I finished this posting, it took me about 2 hours. 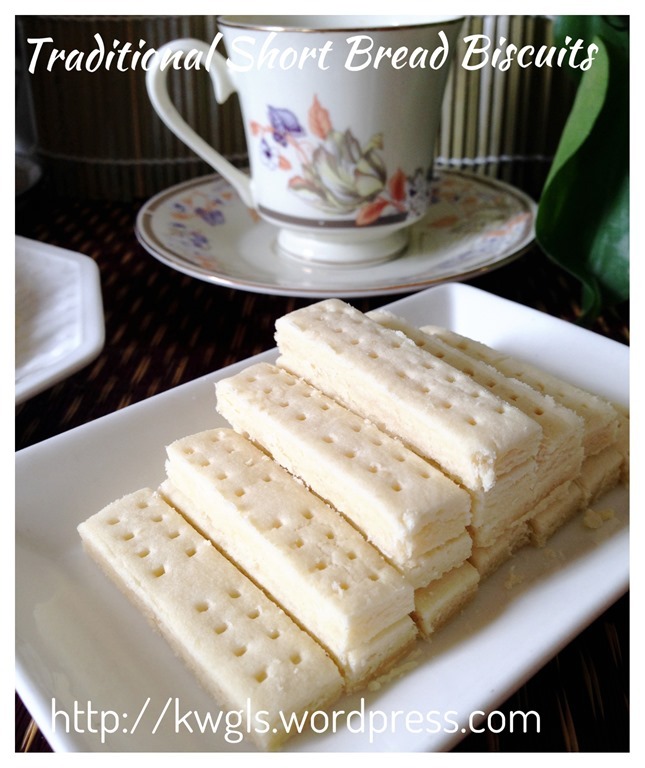 Therefore, readers should comprehend how easy this biscuit was. If you like baby cereal like I do, you will like it. 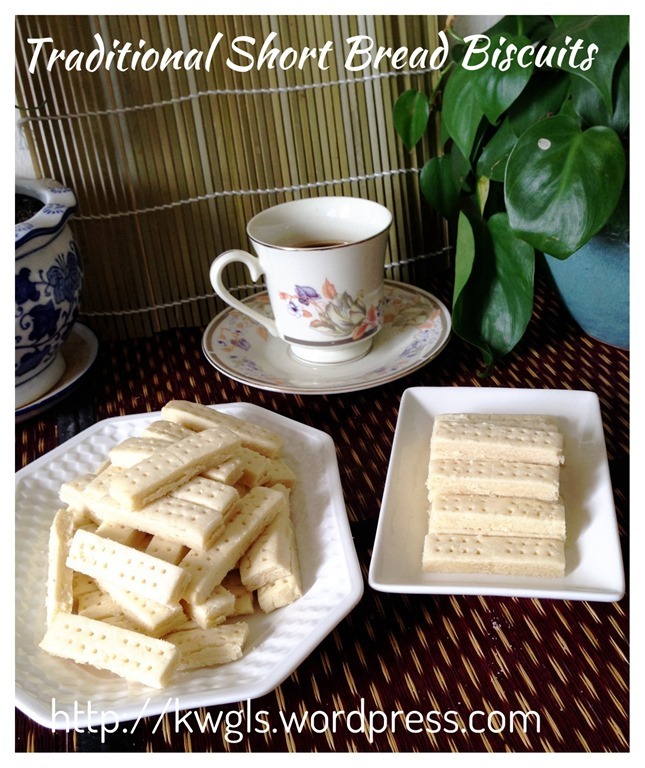 If you like soft chewy type of biscuits where the edges are crispy and soft in the inside, you will like it. Take a step to make this, tailor to your family taste buds, it definitely wouldn’t disappoint yourself and your family members. 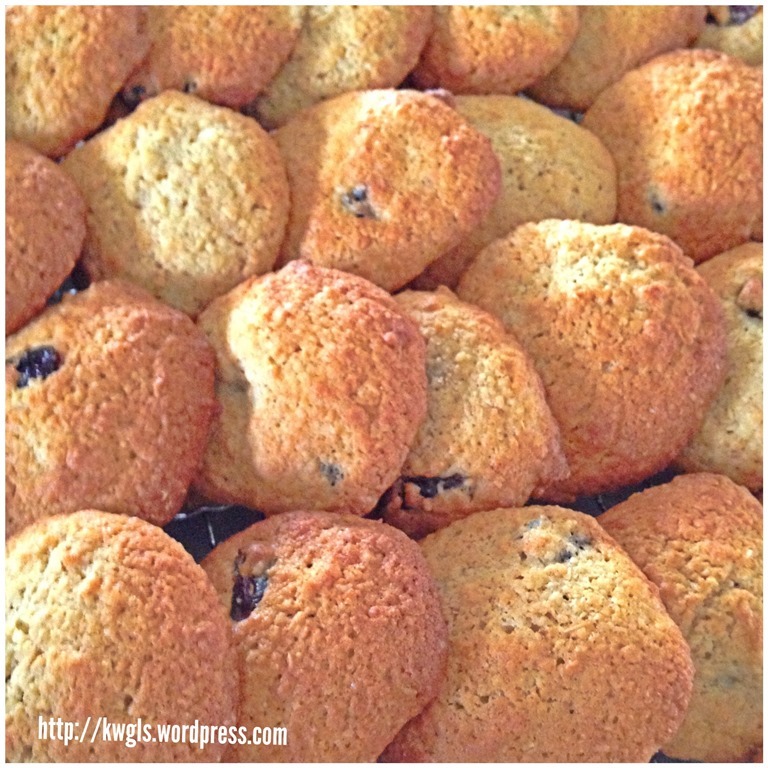 Join me to have some of these cookies as breakfast and of course, not forgetting a cup of hot Earl Grey tea. Cheers and have a nice day! 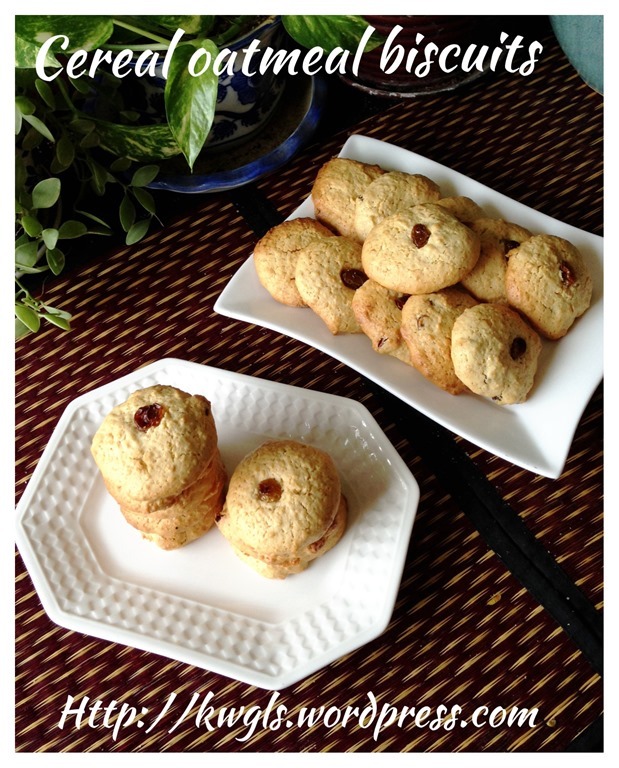 For more recipes, you can refer to my RECIPE INDEX (updated as at 28 July 2014) here and you can follow me at PINTEREST or visit the blog’s FACEBOOK PAGE to keep abreast of my future posts. Have not prepare this cake for one year. 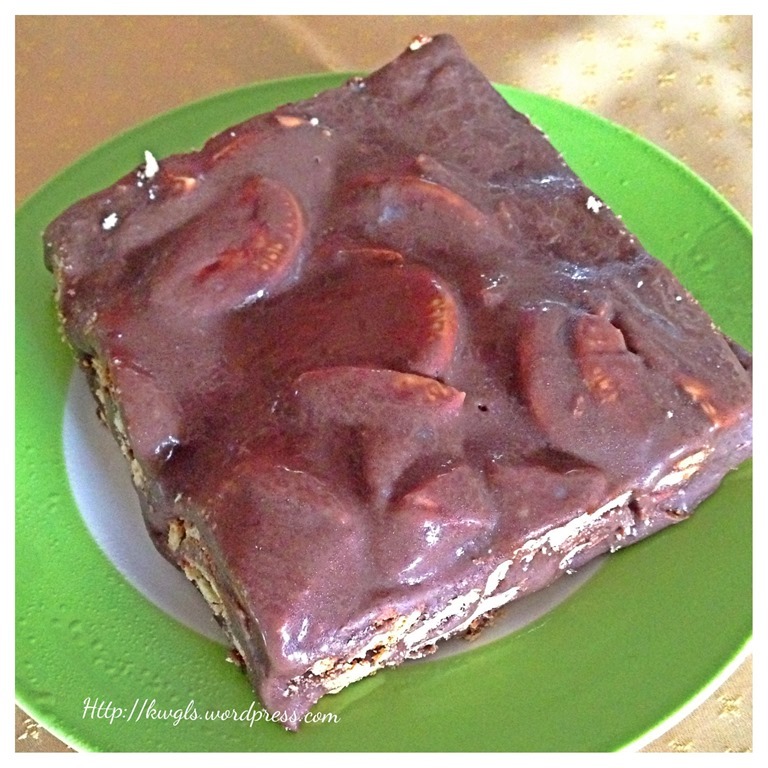 A sudden craving made me wanted to prepare this rich and sinful cake to curb the sugar cravings. However, I have added 3 eggs to the recipe and using the boiling method. 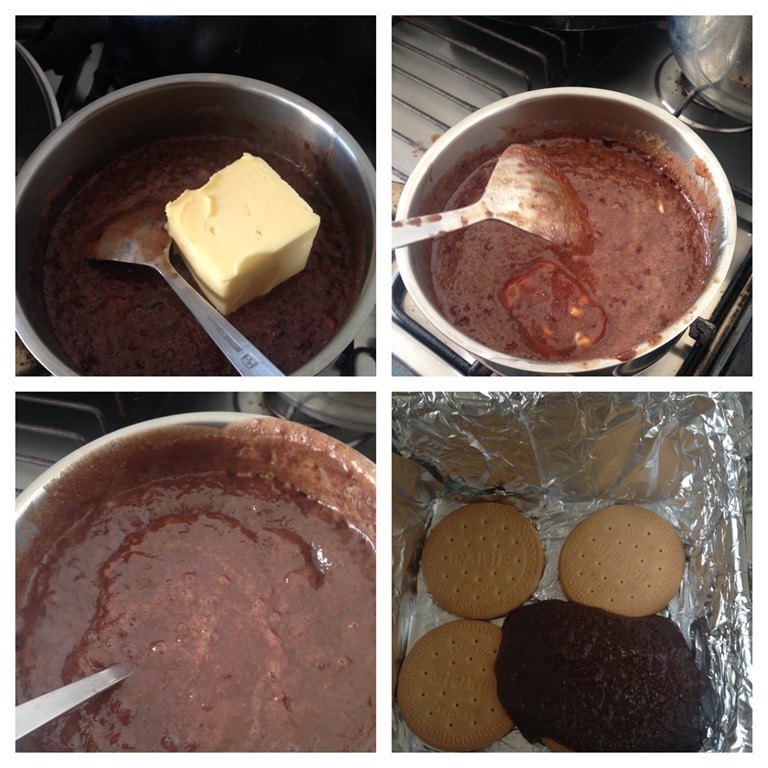 Melt the butter, add in condensed milk, beaten eggs and milo, cooked under medium heat until it starts to thicken. 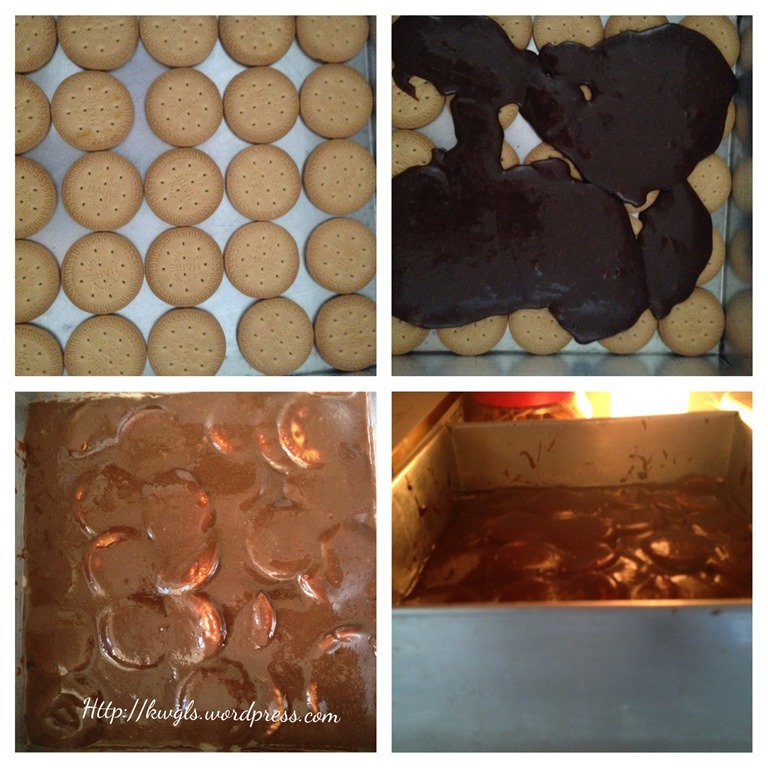 Transfer the mixture to the baking tin lined with Marie biscuits. 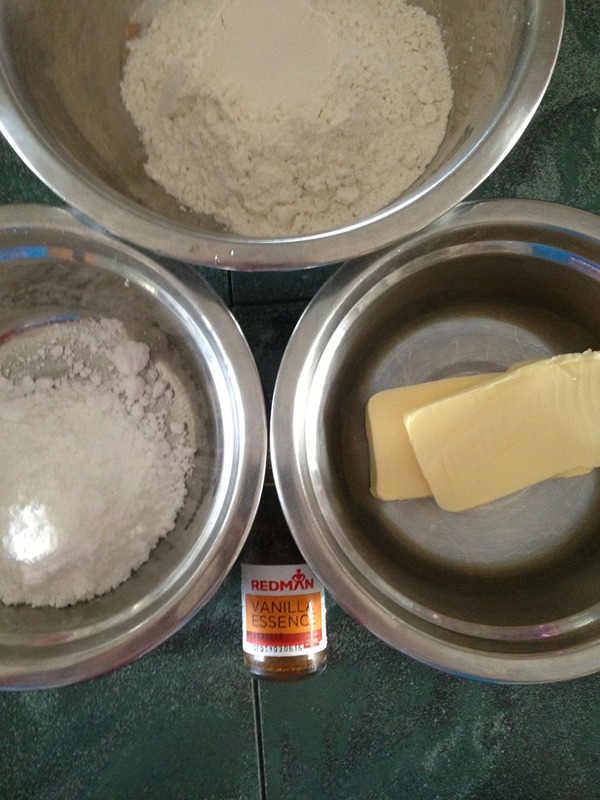 Cover the base layer of Marie biscuits with the mixture. 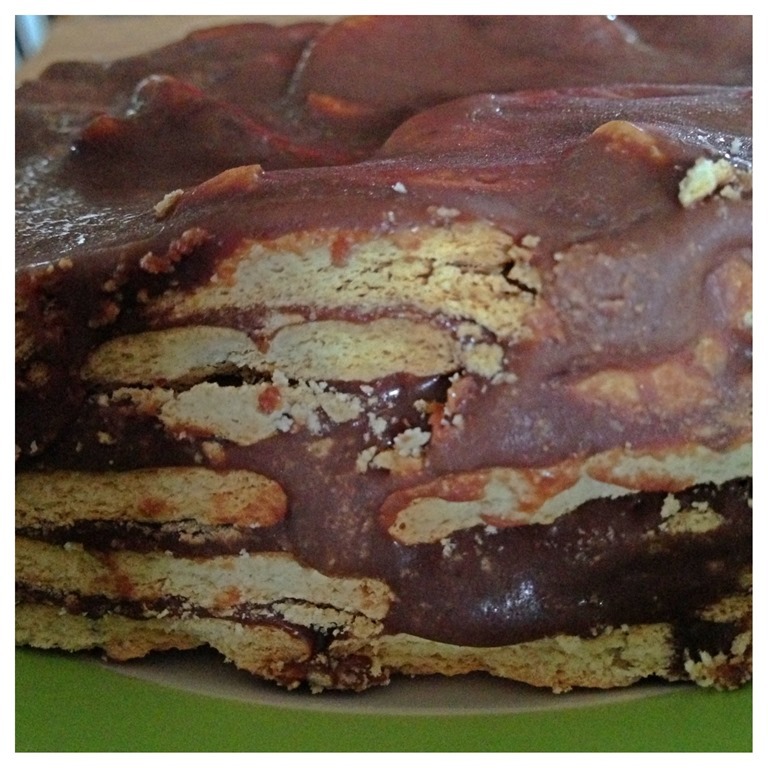 Put another layer of Marie biscuit on top and follow by another year of mixture. The shape is better and it wouldn’t melt in the hot weather. Of course, it will not be that creamy like the chilled version since it had been cooked. Happy trying. 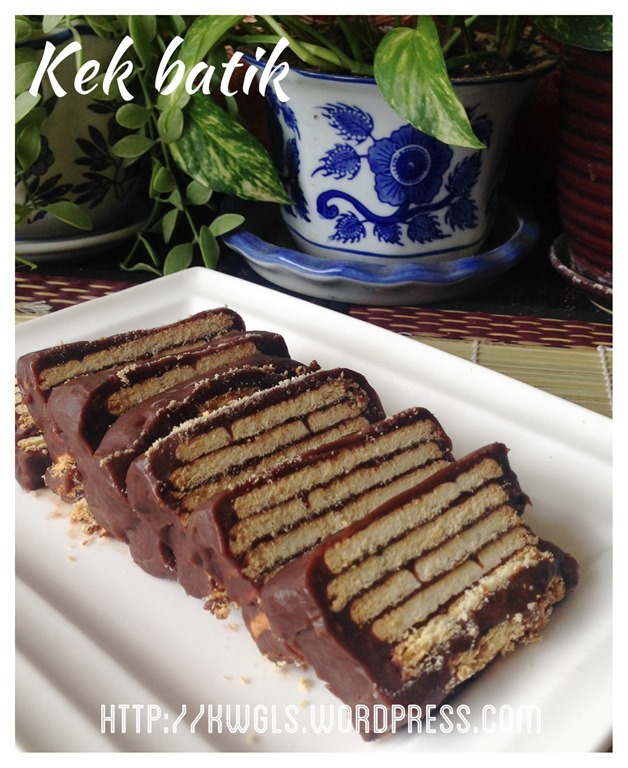 Don’t bombard me this controversial version of batik cake or “hedgehog” cake. It is simplified by Guaishushu as he had omitted the cooking steps. 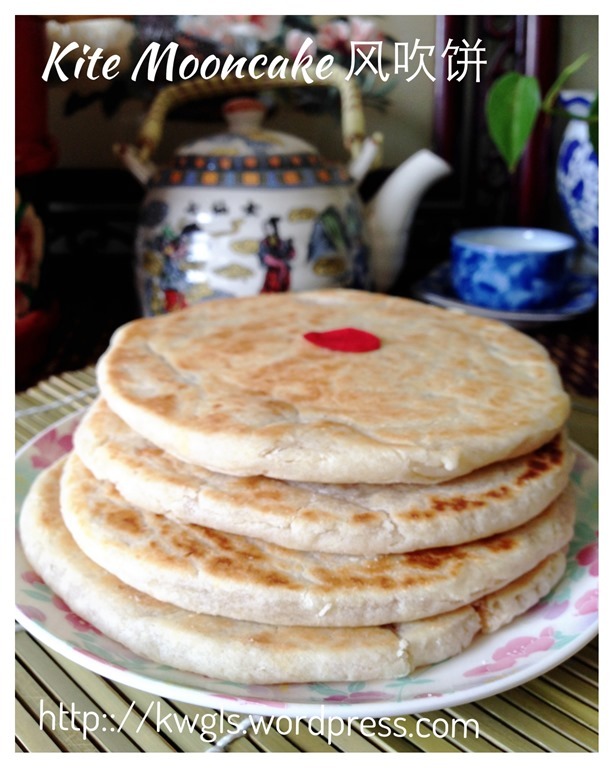 Guaishushu like traditional cakes for its simple to follow ratio. Due to lack of precise measuring equipment in the early days, most household cakes recipes are simple such as pound cakes. Today, Guaishushu is not promoting the one number baking ratio. Instead, he is making a cake that truly reflects the lifestyles of the people living in Malaysia in the early 70’s to 80’s. 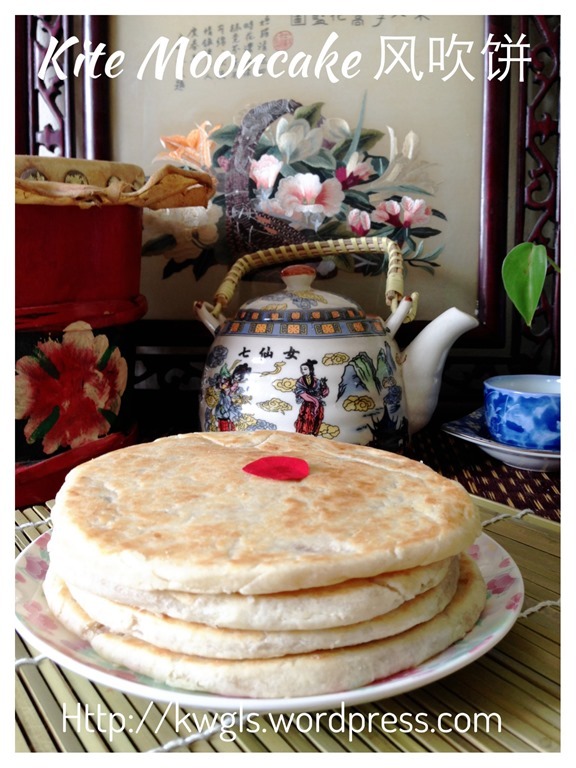 This cake is a simple cake that Guaishushu’s have made a long long time ago, may be 30 years back. Then, there was no oven in the house and his family just have a very simple fridge. This was one of the easiest cake that he can make because it required no oven, no mixer and just need a fork and a spoon. 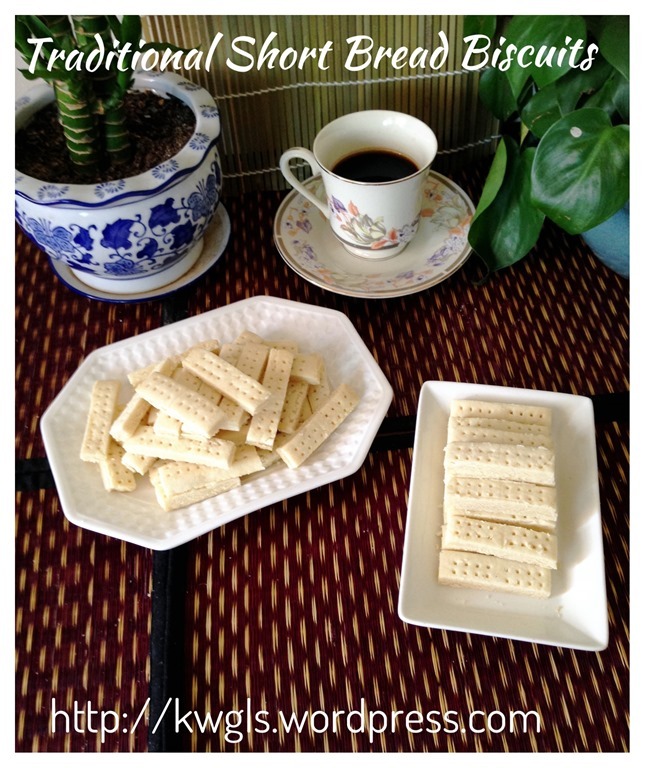 In addition, the ingredients were household common breakfast items such as Milo beverage drink and Marie biscuits. There was no internet then and most recipes were by words of mouth. He can’t recall which relative gave him the recipe, what he could remember very clearly was the nice pattern in the cake. 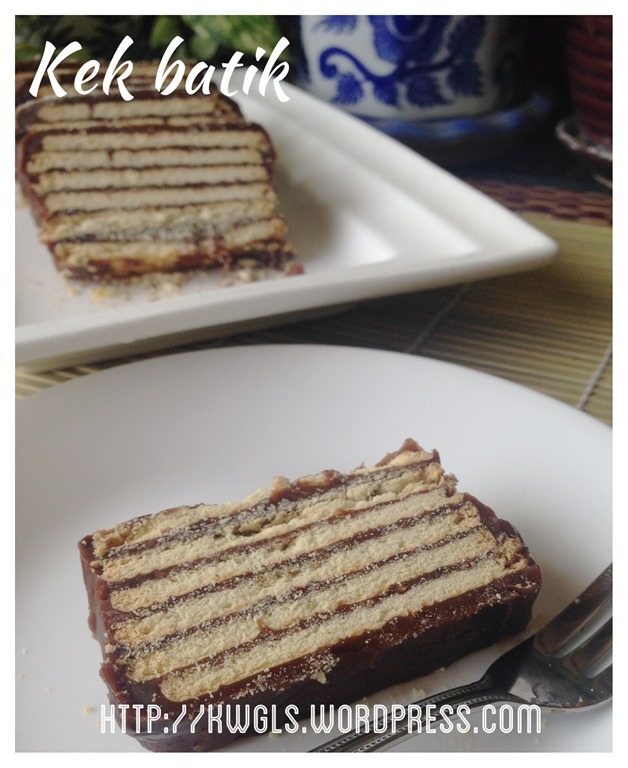 In Malaysia, the cake was called BATIK CAKE. 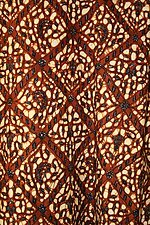 Batik is a cloth that is traditionally made using a manual wax-resist dyeing technique. It is a beautiful cloth and usually wore by Malay in the Malay Peninsular. Guaishushu had long wanted to make the cake but he did not have the recipe. He had in fact bought the Marie biscuits but did not have the time to search for a recipe. 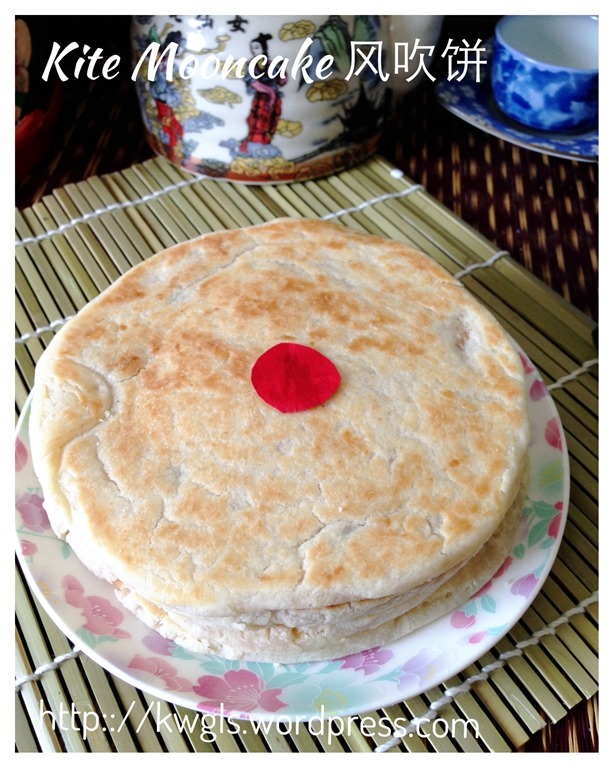 Coincidentally, one of the members in a Google Plus communities disclosed that her week end adventure was preparing a batik cake, Guaishushu immediately felt extremely happy and asked her for the recipe. 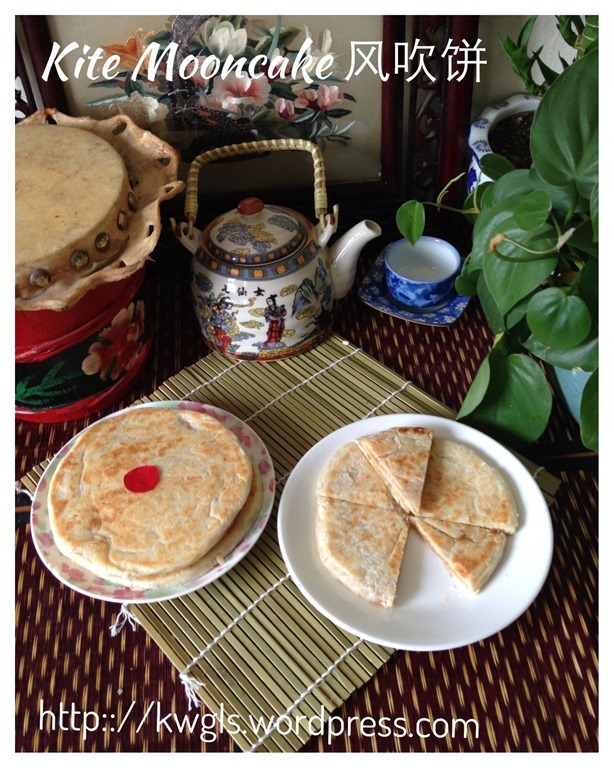 The member was very kind to share her recipe and uploaded a picture. 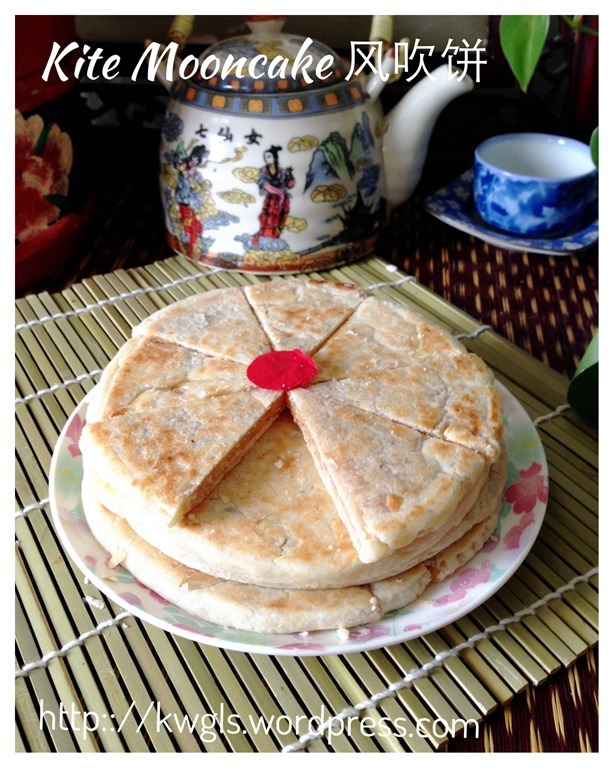 Guaishushu showed his wife the picture and his wife concurred that she have missed the cake too as she had not eaten this for ages.. With her recipe, Guaishushu started his preparation and within one hour, everything was done and send to the fridge for chilling. 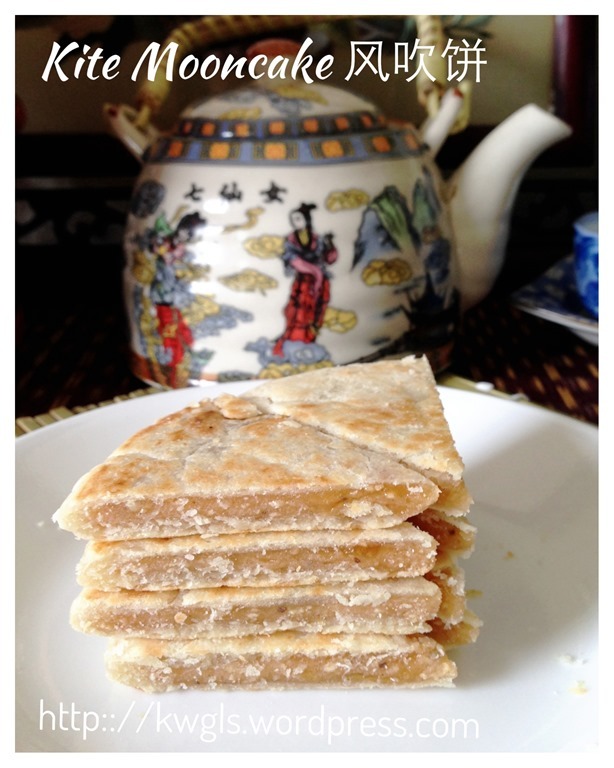 This recipe is a bit different from the original recipe in that Guaishushu do not cook the mixture. No cooking is actually required because all the ingredients are cooked ingredients. He opted just to mix and chilled to simplify the preparation. 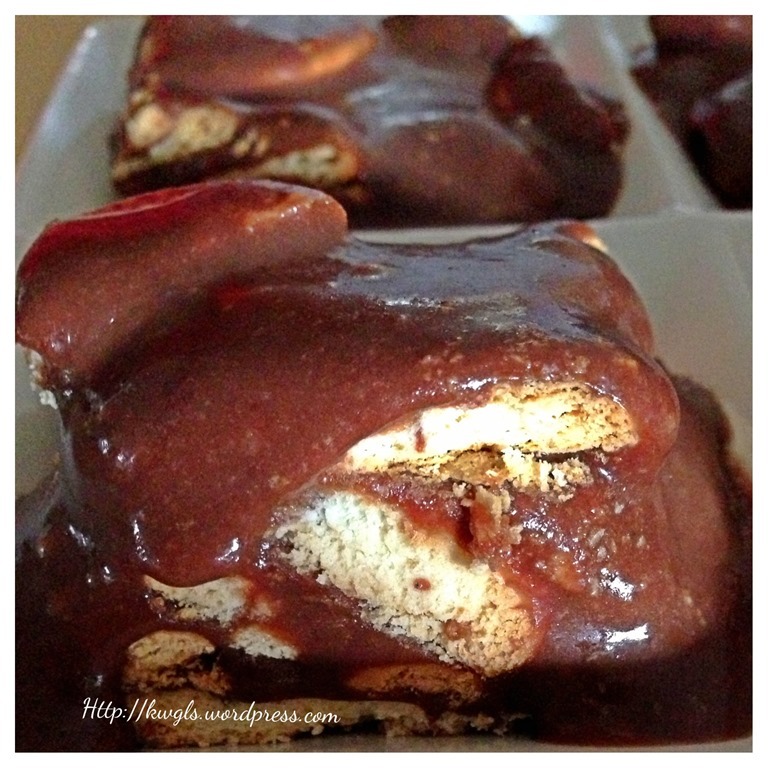 Of course, without cooking, the texture will be much softer and it can be treated as a type of chocolate sauce. The cooked version will have a better shape but the texture is slightly chewy . 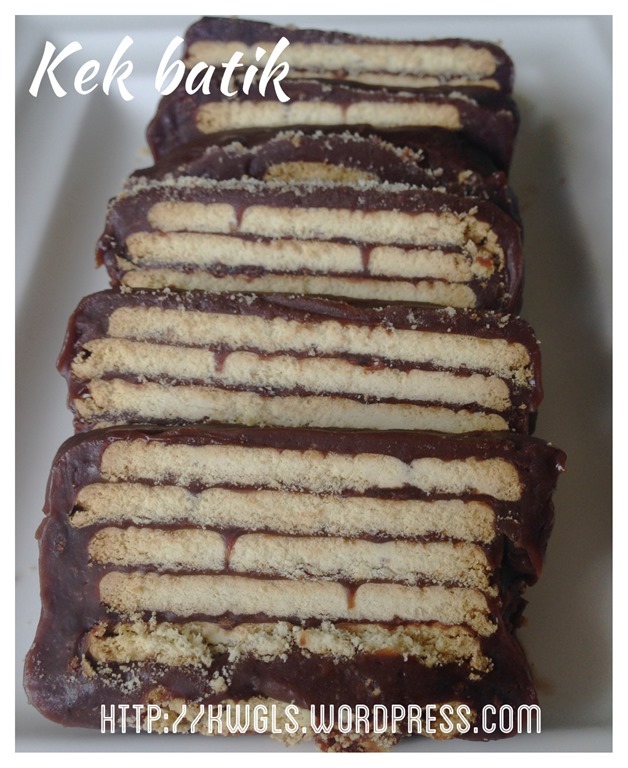 Non cooked version will have a totally different texture, soft and smooth and rich in chocolate flavour. 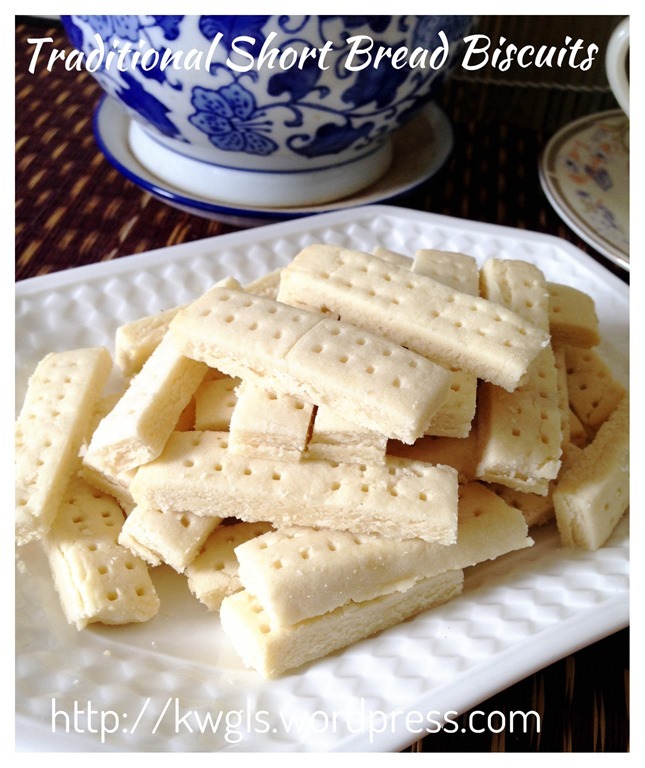 1 packet of Marie biscuits (about 250 grams) – a bit more or less is okay. 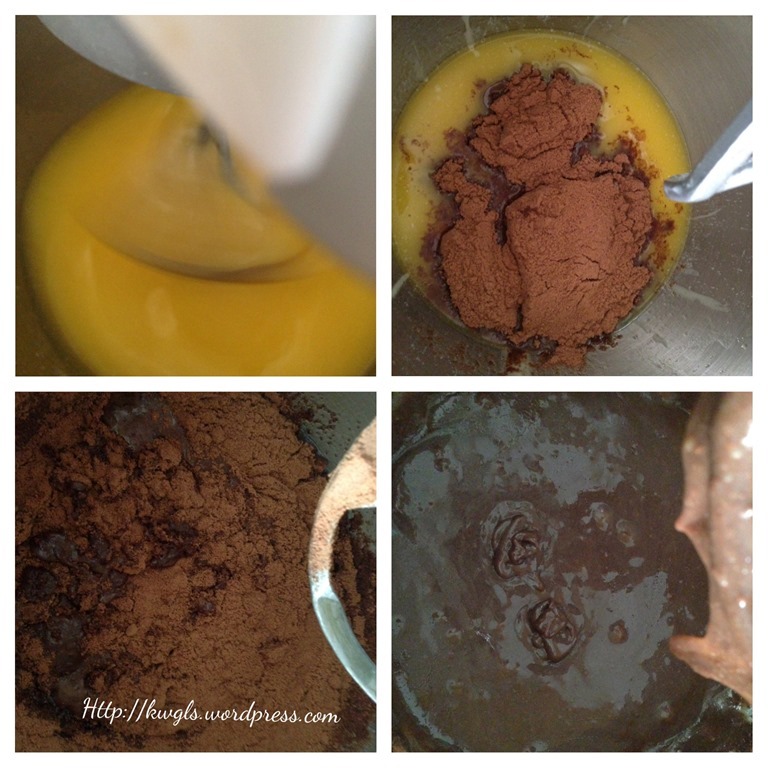 3 eggs (optional) – If eggs are added, you will have to use the cooked version. There are two methods of preparation. 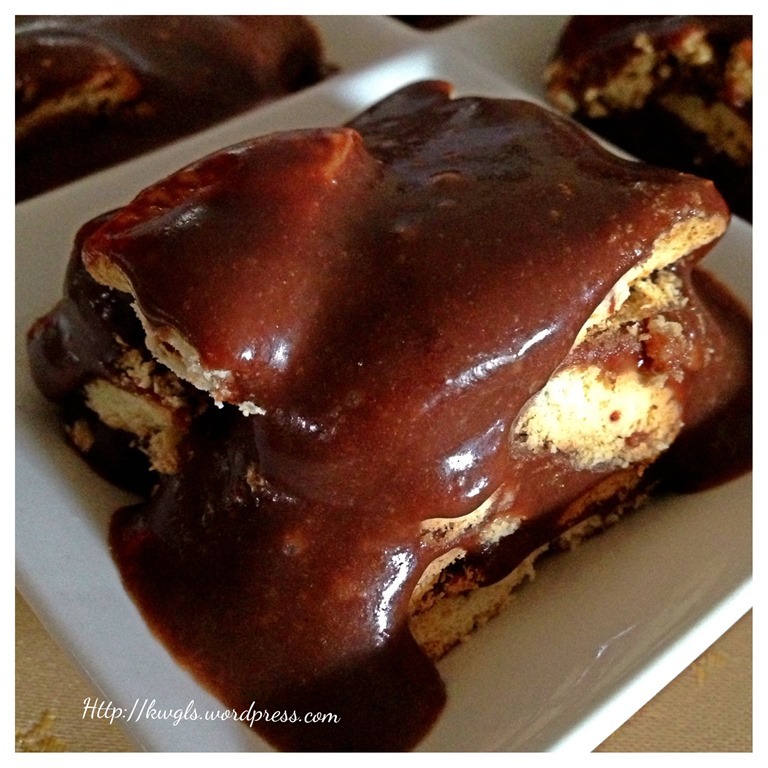 Either you melt the butter, milo, eggs and condensed milk in a sauce pan and cooked under low heat until it thickens. In this case, you cake will be chewy and more shapely (Please refer to the update post for procedures) For better presentation, it is advised that you follow this method such that it had a nicely cut cake. But for taste wise, it is advise that you follow the second method below. The second method is as in this illustration where no cooking is required, therefore, you final products will become very creamy, soft as if you are having some rich chocolate sauce with biscuits. In a big mixing bowl, place melted butter and condensed milk together, use hand or machine whisk until texture is consistent. 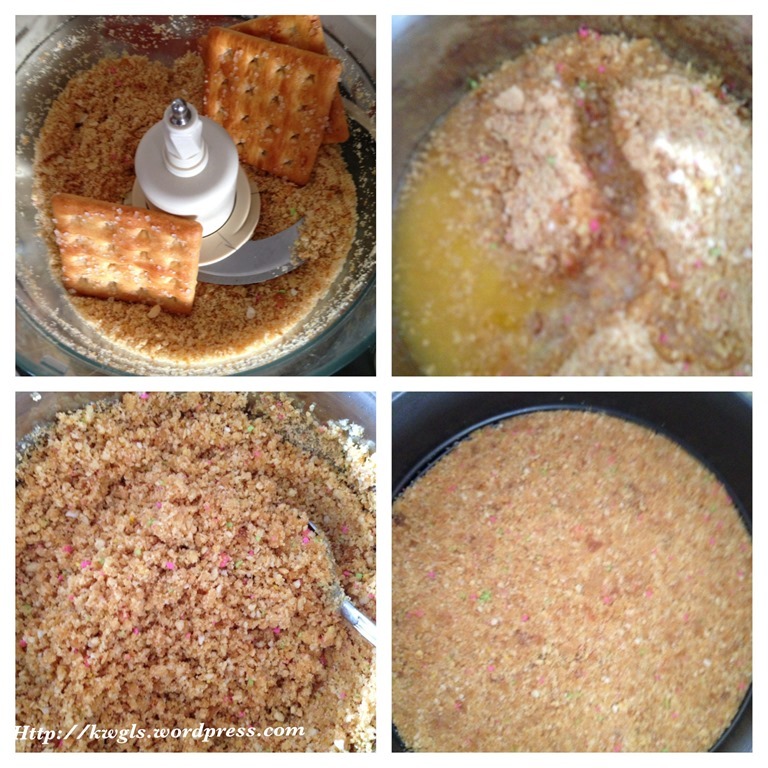 Add in milo powder and mix until it is well mix. 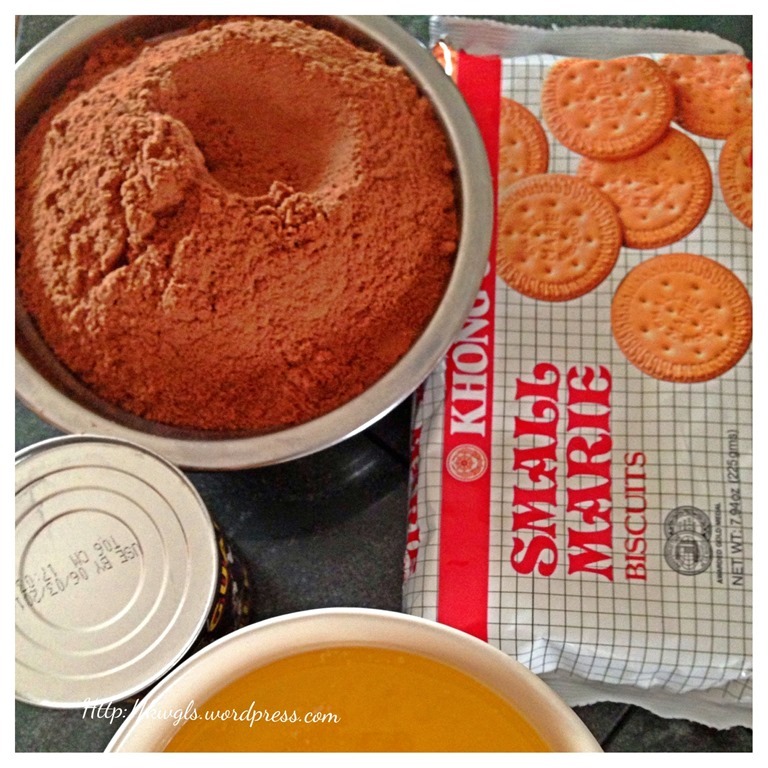 Arrange your Marie biscuits in the tin and pour some chocolate sauce over the biscuits. Add another layer and repeat the same procedures until all biscuits and batter are used up. Freeze it in the freezer for 1 hour or until temporary set. 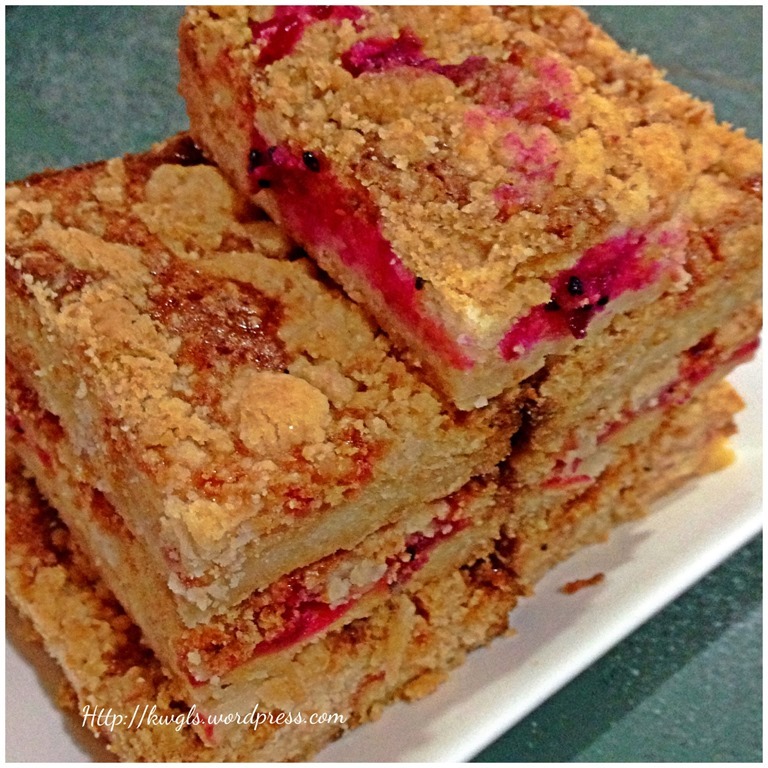 Cut into the desired size and served immediately out from the fridge. The sauce will gradually melt in the room temperature and therefore you shouldn’t put in the serving plate too early especially in hot weather like Malaysia and Singapore. Best serve cold as a form of dessert. 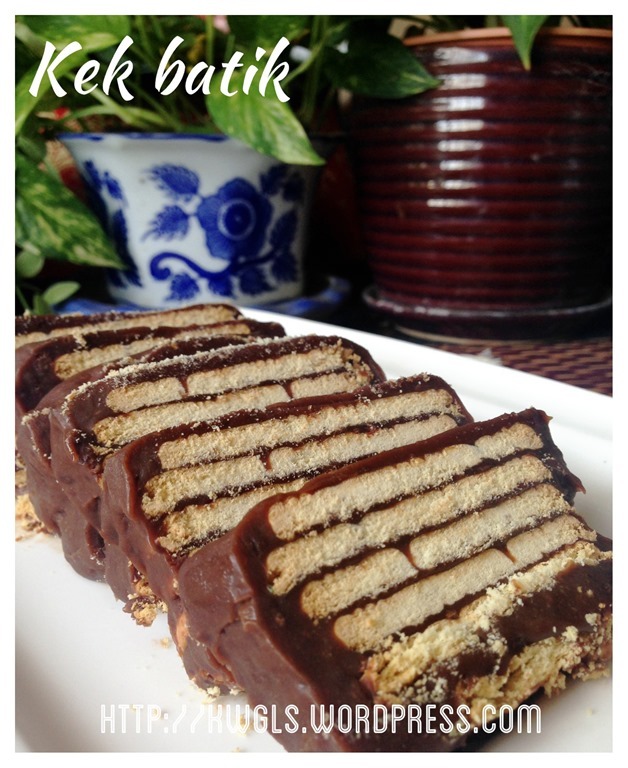 This is a twist of the traditional Batik Cake. I have purposely not to cook the batter since all ingredients are cooked ingredients. 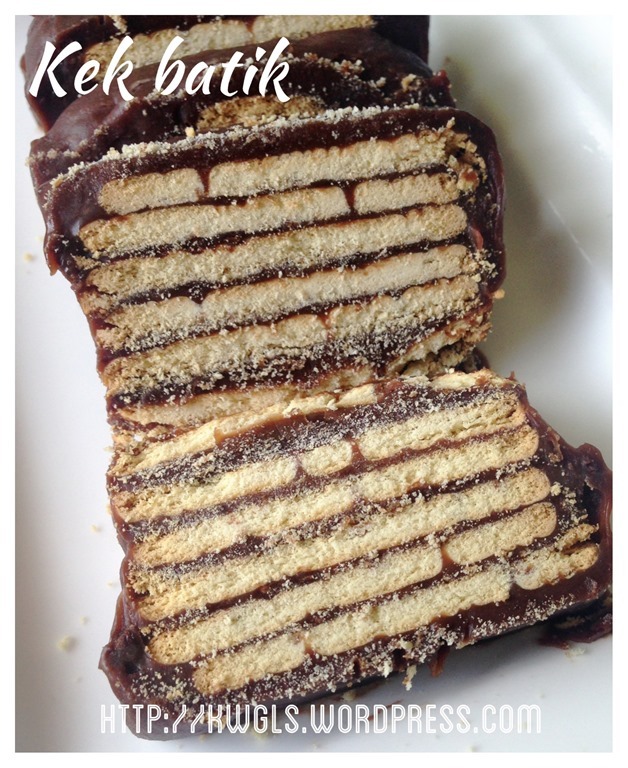 The texture and the level of enjoyment is totally different. While the traditional method of cooking the batter will provide you with better shaping but to me, its texture is compromised. 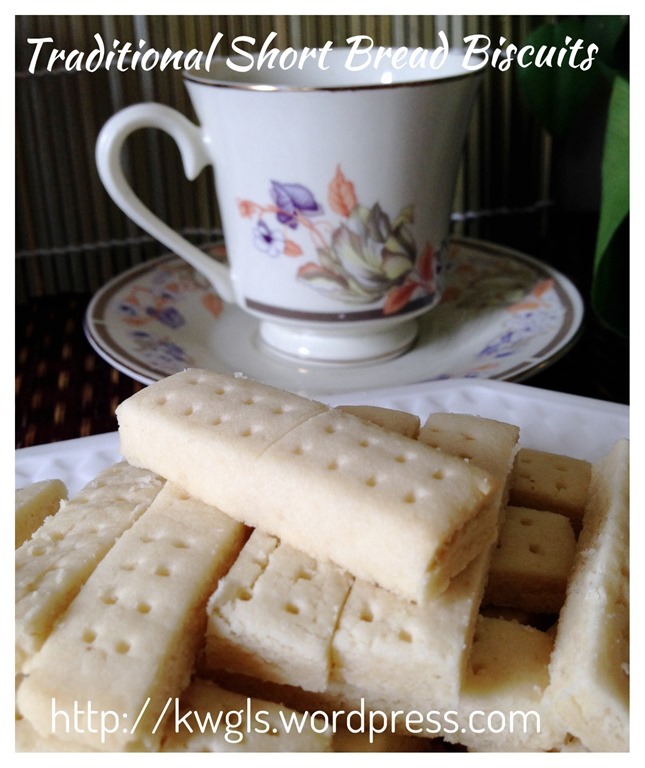 I would prefer something soft, silky, rich and creamy full of chocolaty flavour to go with this simple plain biscuit. 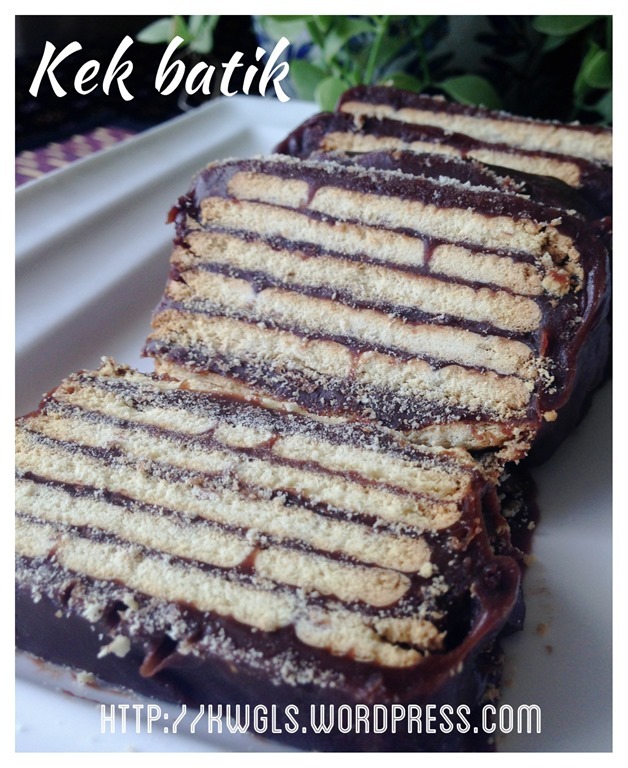 Whether or not this can still called a batik cake is irrelevant to me. The texture and taste will definitely a better alternative for me. The cake is made with simple ingredients, no complicating beating using expensive equipment, why not making one today and try. 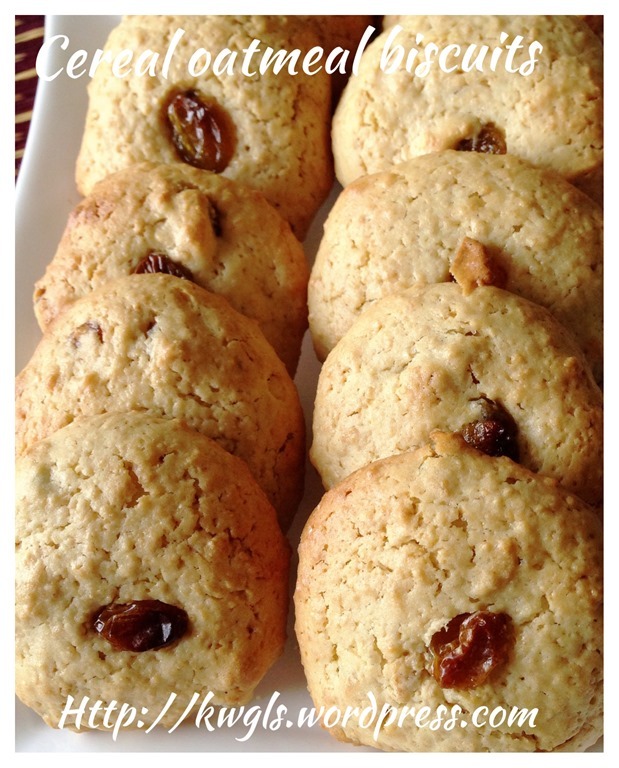 You can add nuts if you want to, can add some Nescafé if you prefer, change to some other types of biscuits if this suit your taste buds. Remember, boiling method can give you a better shape but the texture is slightly harder. 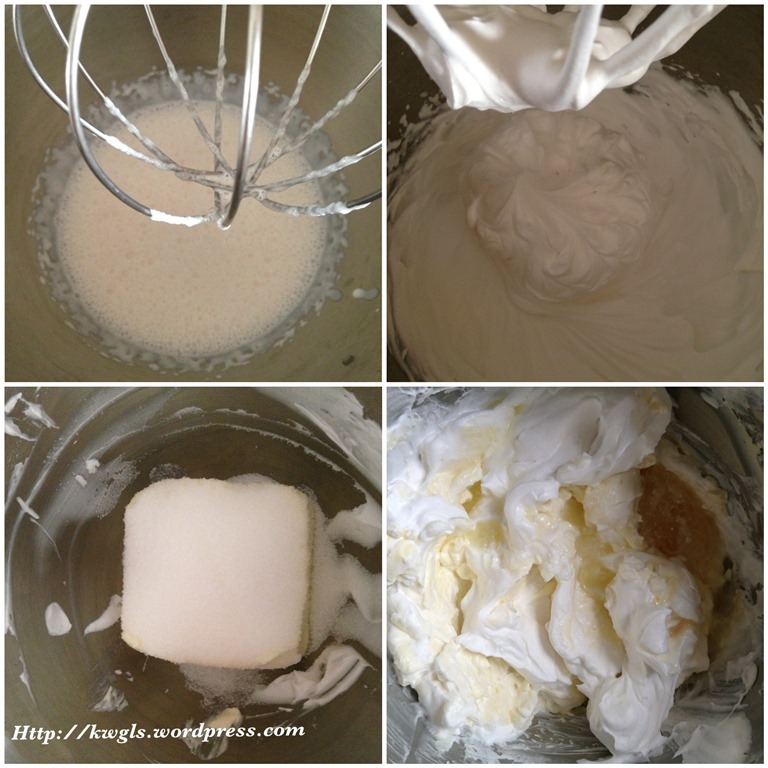 Chilling method is very creamy but a bit messy. If you asked me which do I prefer? 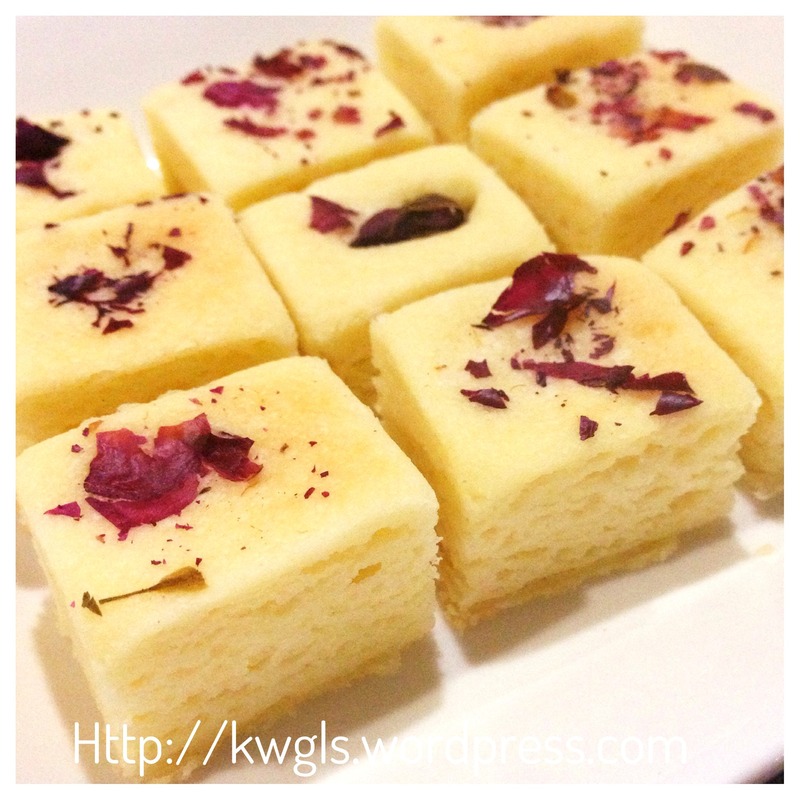 For small gathering at home, chilling method. 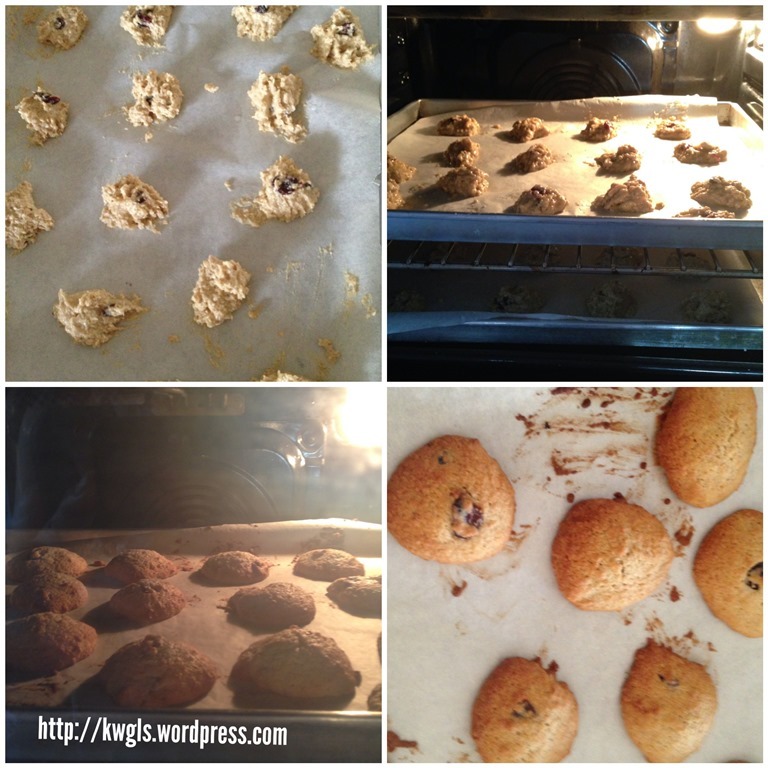 As gift or buffet style, boiling method…. 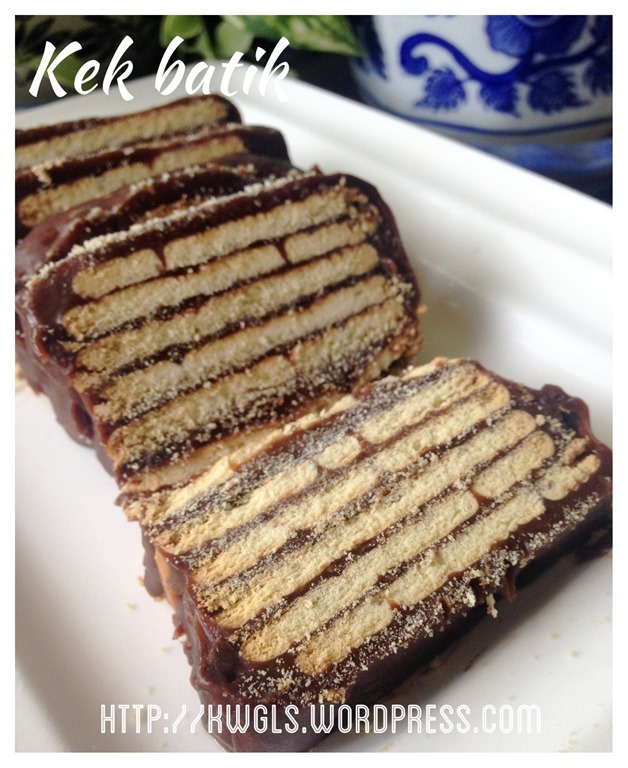 Last but not least, I forgot to say that this taste like Asian Kit Kat.. Ha-ha. Cheers and have a nice day. 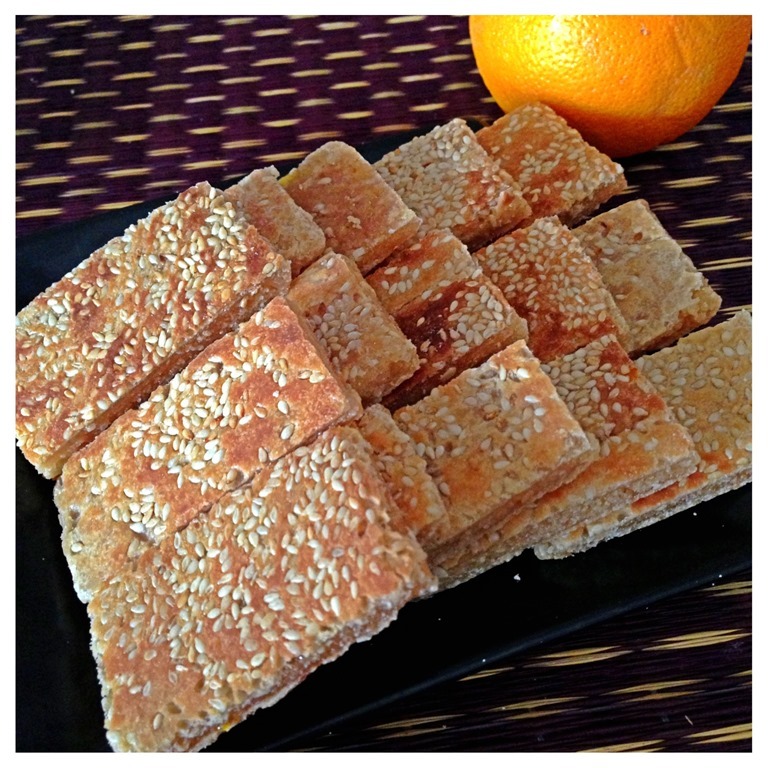 Last year, I have prepared this mooncake but I cut it in square shape and I have put sesame seeds in the crust. 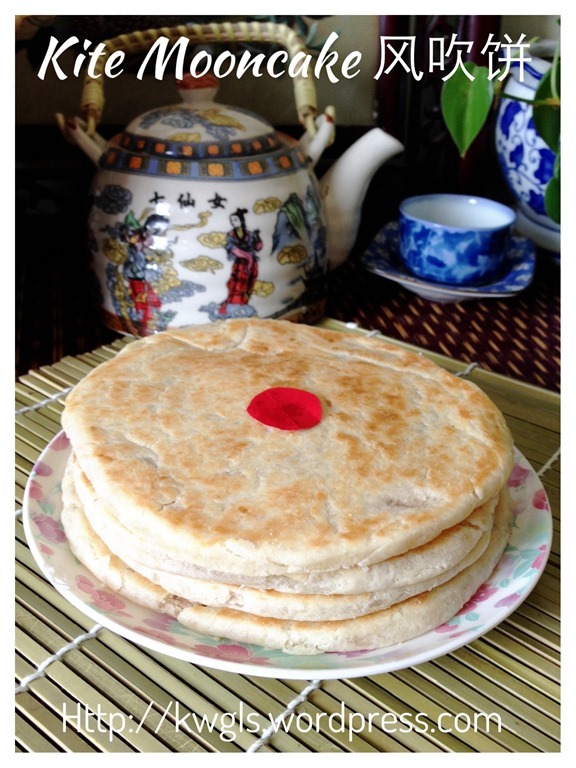 It doesn’t look that authentic and this year, I have decided to prepare again in the traditional shape which is round and without any sesame seeds. The recipe is in the post proper itself. 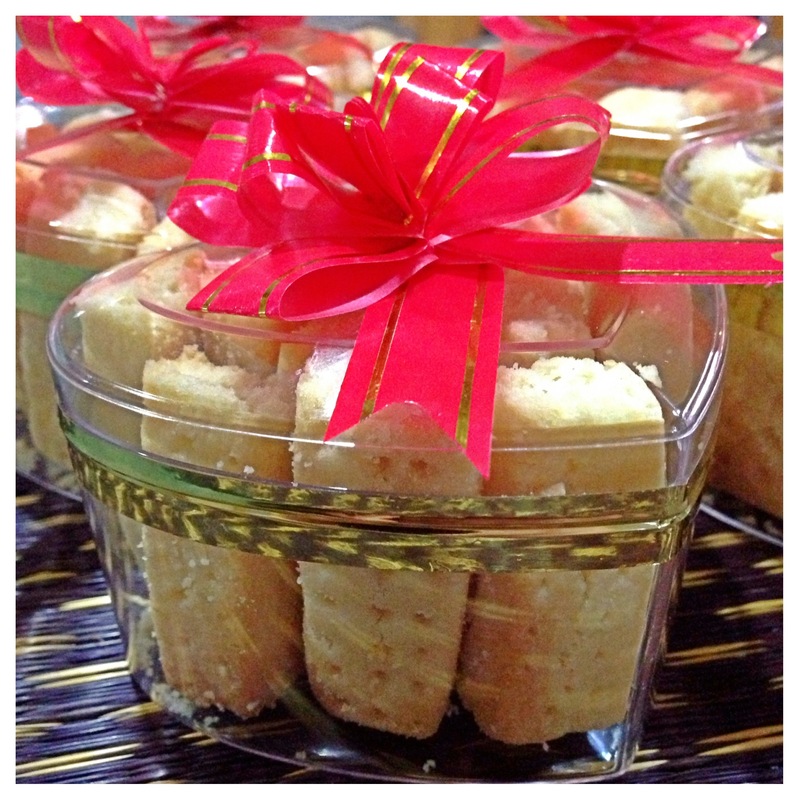 This is how it was being packaged and sold in Kuching Teochew Cake House. Picture courtesy from Mr. Tan Sia Hong who take the trouble and go around taking picture for me. 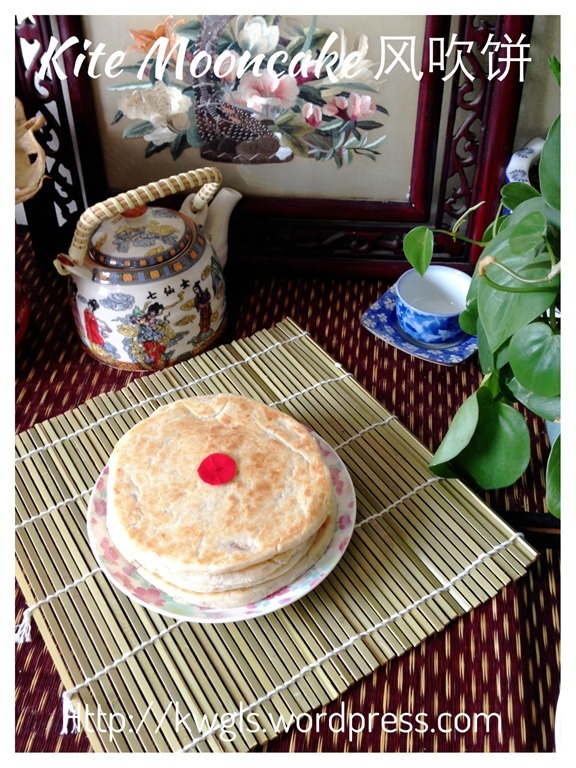 Mid-autumn festival is approaching and I am now homesick of this special pancake (and some dialects group) treat it as moon cake. 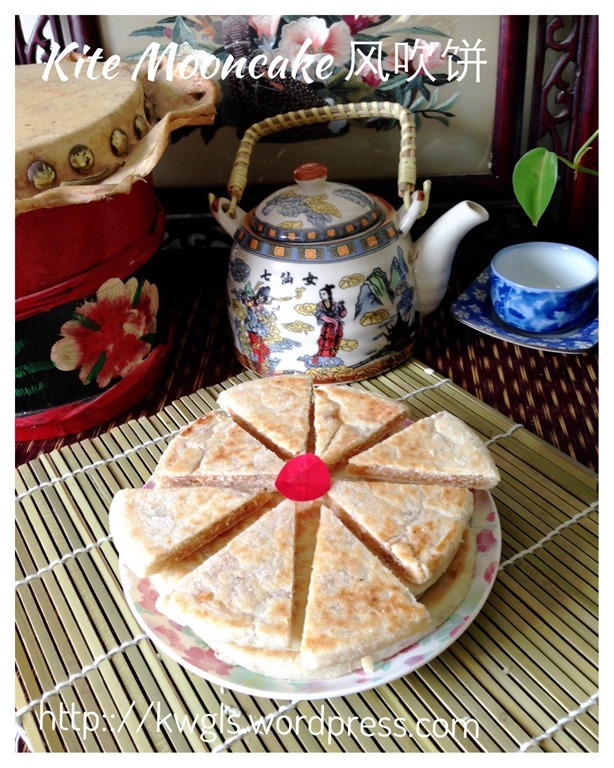 I am not really fancy about current type snow skin moon cake or the traditional Cantonese moon cake but I have the inclination to like the Teochew style of moon cakes with the flaky skins. 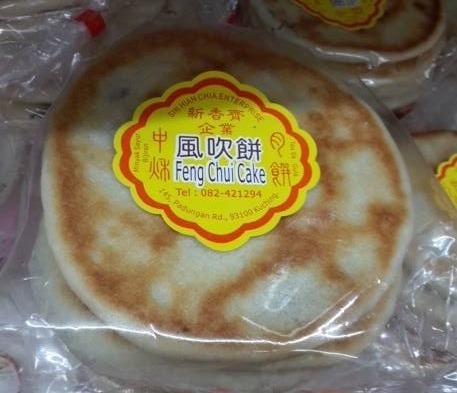 I never fancy lotus paste (should be the most expensive) filling and I usually opt for the white mung bean filling (白豆沙）。But this just suddenly came across my mind that it is another type of moon cake that I missed. 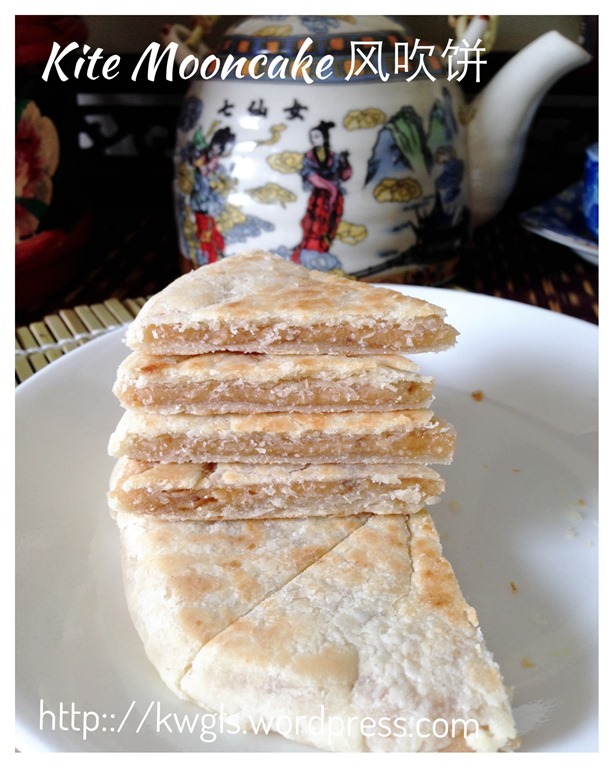 This special pancake can be found in East Malaysia rather easily. I have to be very frankly I do not know how to translate this traditional Chinese delicacy. 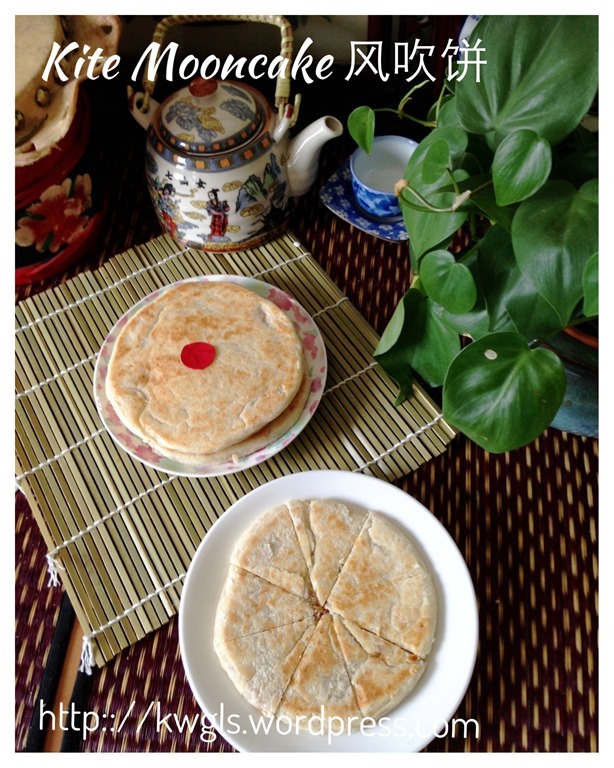 Literally, it was translated as the Kite Pancake. 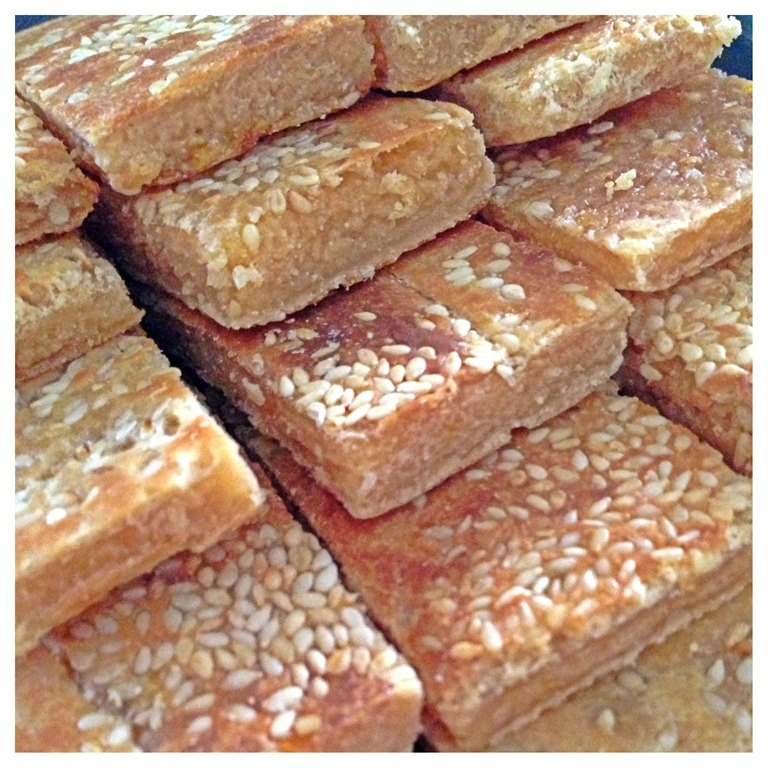 The origins have yet to be traced but I seriously believed that it is a type of Zhaoan or Teochew sweets. 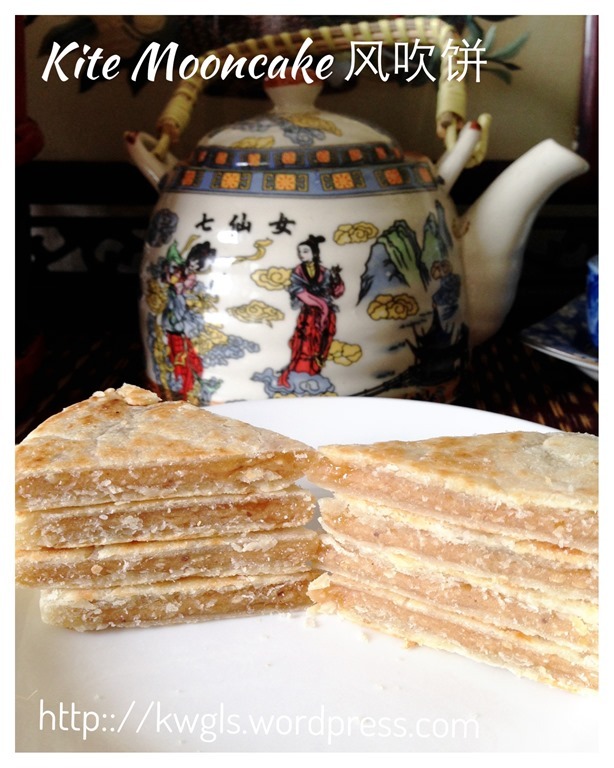 This is because I can get it in Singapore during moon cake festivals from the famous Teochew cake house called “Yang Hua Teochew Cake House) (荣华饼家）. 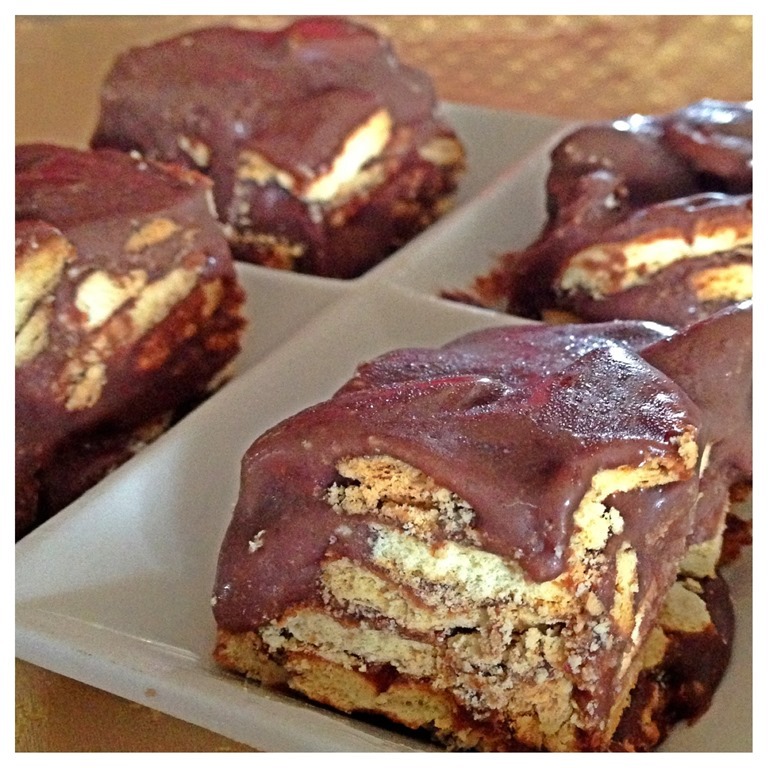 Apparently, there are not many bloggers who blog about this special sweets and in fact you will have a hard time to search for a recipe on the net. 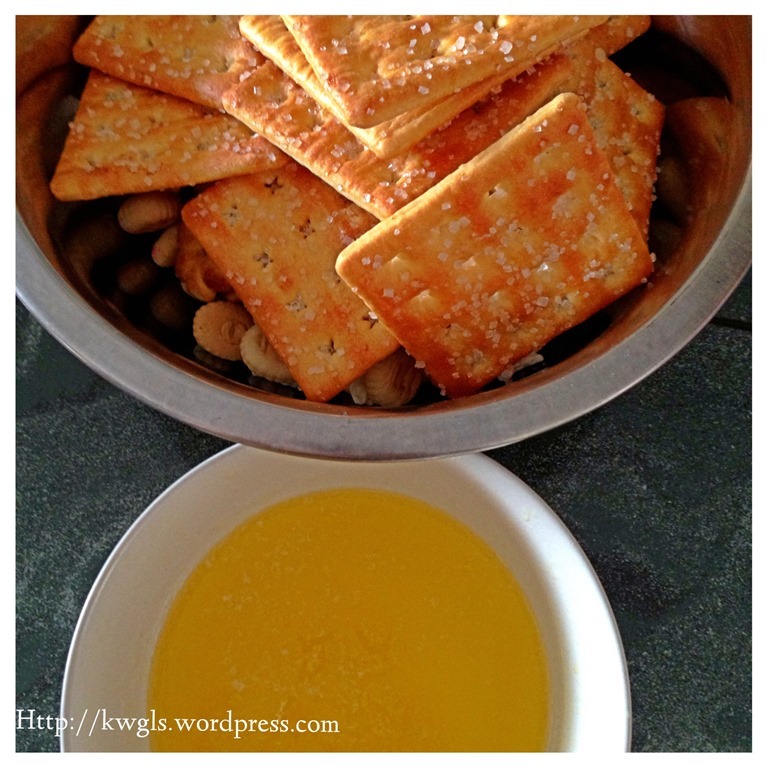 I managed to get a recipe from HERE and immediately I just bookmarked it and today, I have recreated it but modified to include sesame seeds. This blogger is also from the State of Sarawak, Malaysia. As I did not manage to get Maltose (麦芽糖), I have substituted with home made golden syrup . 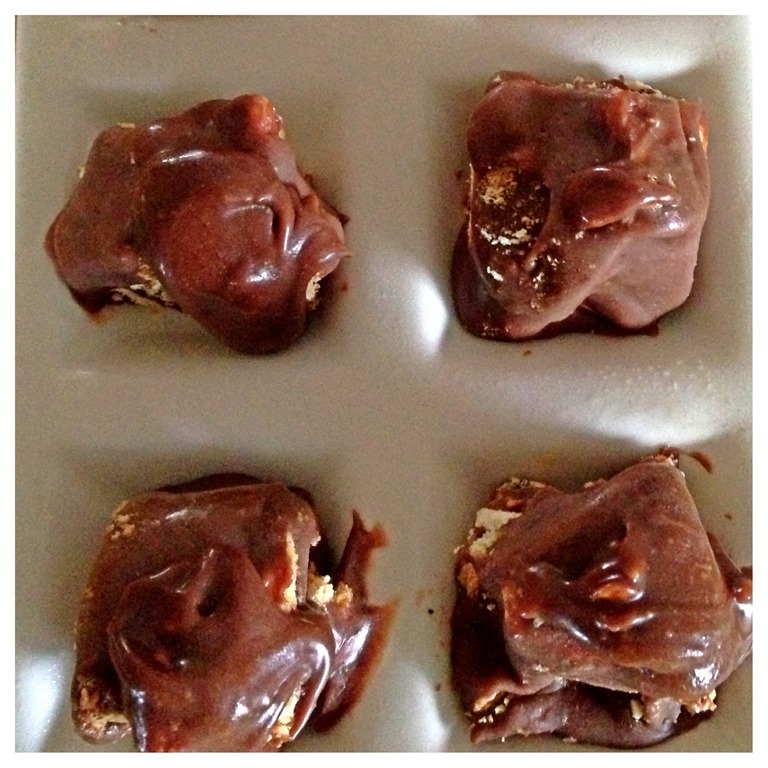 Overall, the results are satisfactory especially for those who craved for this snacks. 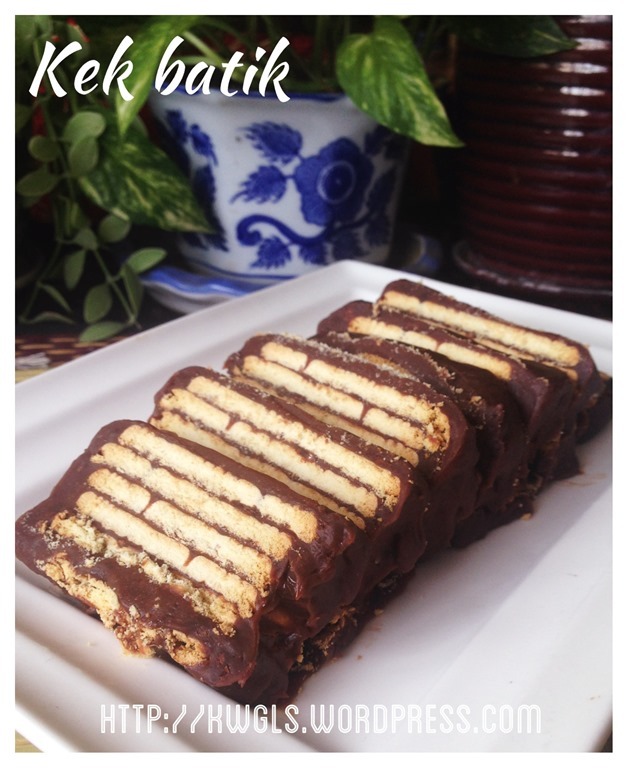 As there are very limited or only one recipe available, I have difficulty to compare between recipes but overall, I will think that it is 90% resemble those who sold in Kuching market and definitely something that I would do in the near future. 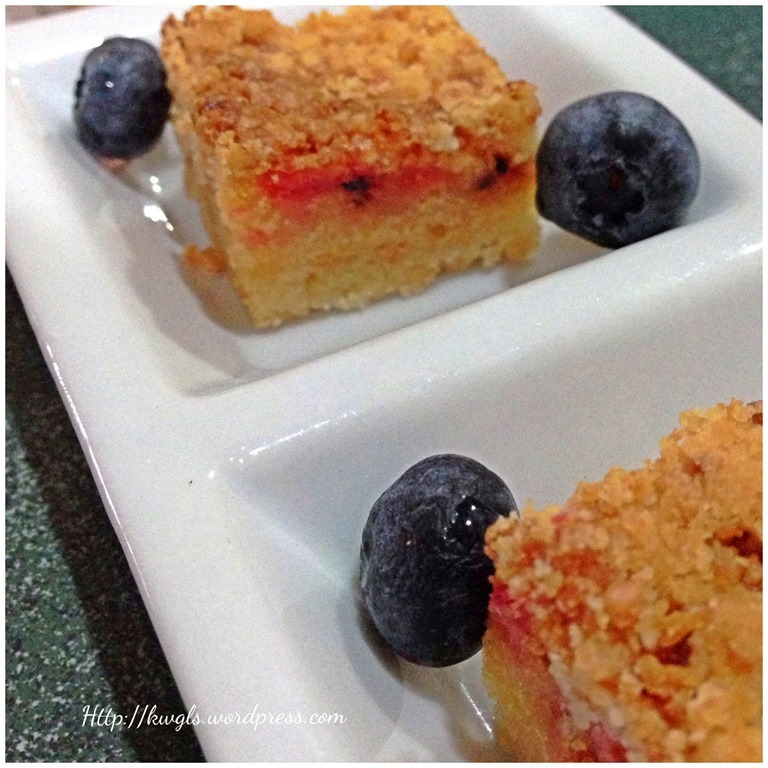 I have purposely do it a rectangular shape because it is easier for me to cut for serving. The snack shall be a bit crunchy on the crust and the inside a bit chewy and sticky full of citrus flavours.I missed this pancake. 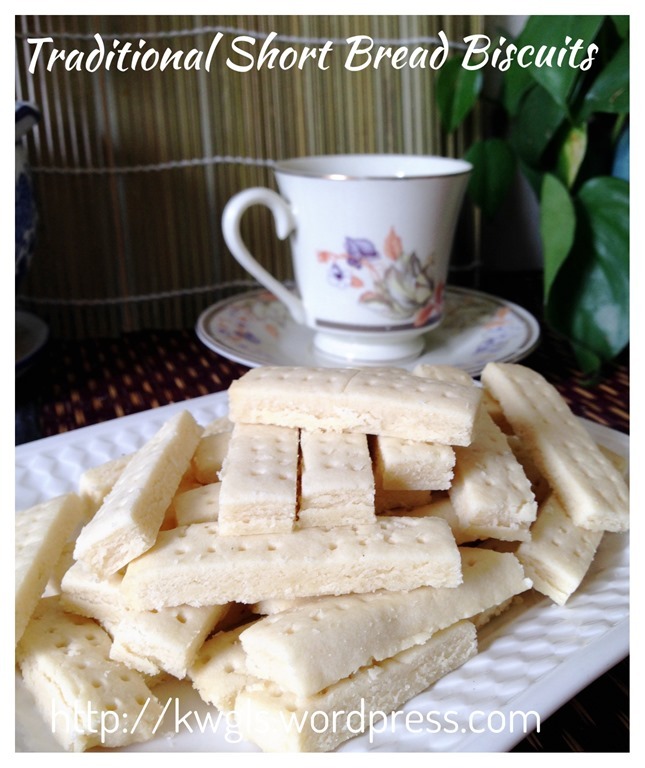 It goes well with a cup of hot tea or coffee. Have a sauce pan, add water and sugar. Heat the sugar and water over “MEDIUM HEAT” and constantly stir it until it melts. Let it boil until it re-crystalized. Please avoid using non stick pan as I have a hard time to get it crystallized. If you use high heat, instead of re-crystalizing, your sugar will become caramelized and you will have a hard time to “break” the sugar. 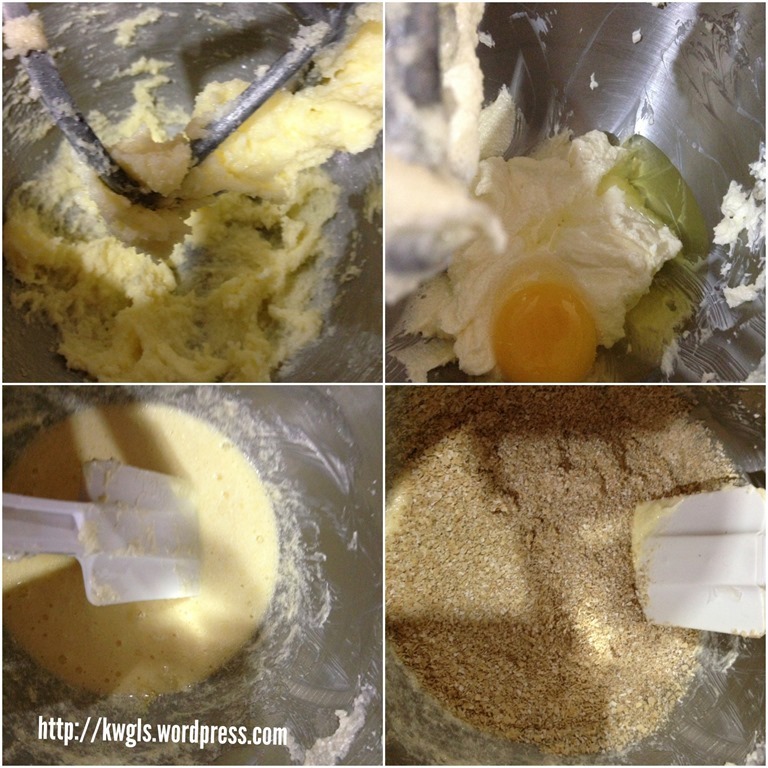 In a big mixing bowl, add vegetable shortening, plain flour, golden syrup/maltose, icing sugar and hot water. 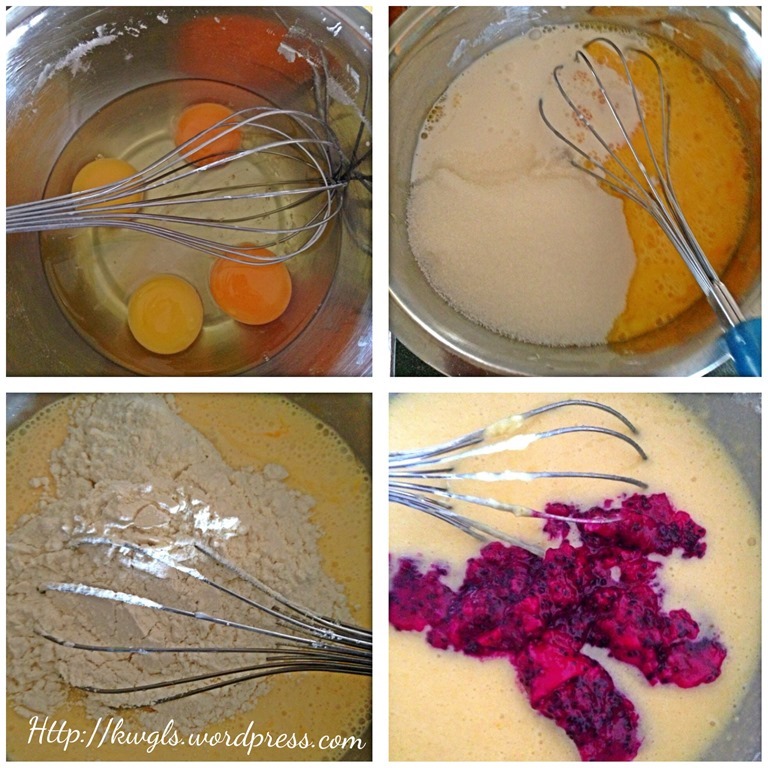 Slightly mix using a tablespoon. Knead until it form a soft dough. Set aside of later use. In a bowl, put golden syrups/maltose together with crystalized sugar. Add 50 grams of water and let it slightly dissolve. 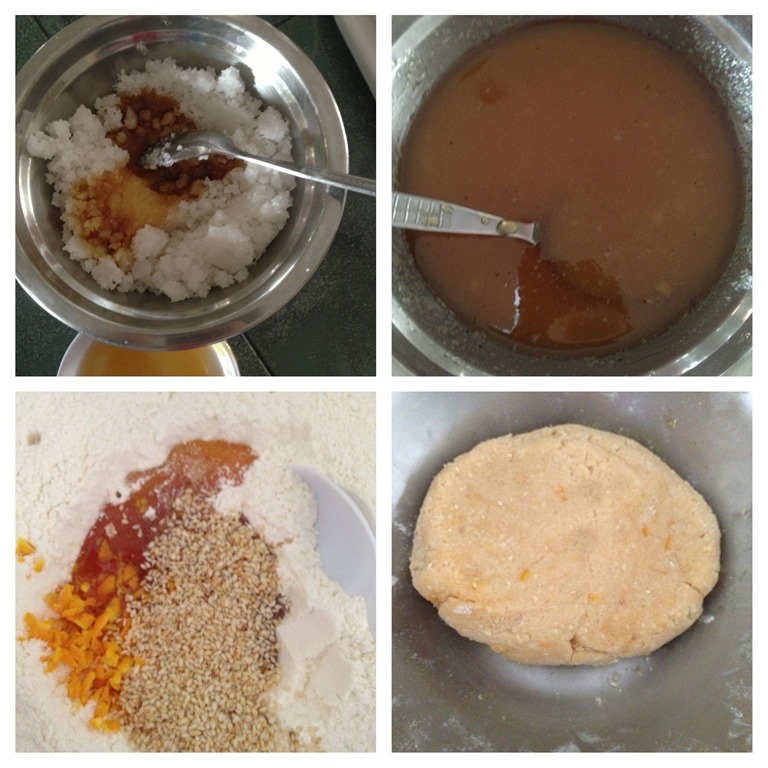 In a big mixing bowl, add plain flour, cooked glutinous rice flours, orange zests. Make a hole in the centre of the flour mixture, pour the liquid mixture and knead until smooth. 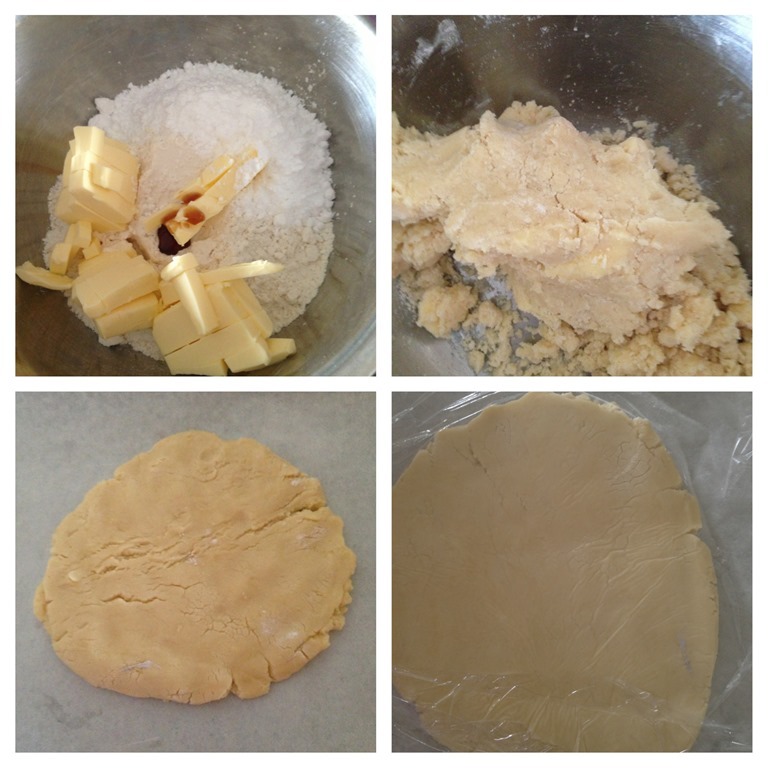 Divide the dough and the fillings into 4 equal portions. Slightly flatten the rough dough and wrapped the fillings with the dough. Use a roller pin to roll it in a round shape with a height of about 5mm thick. 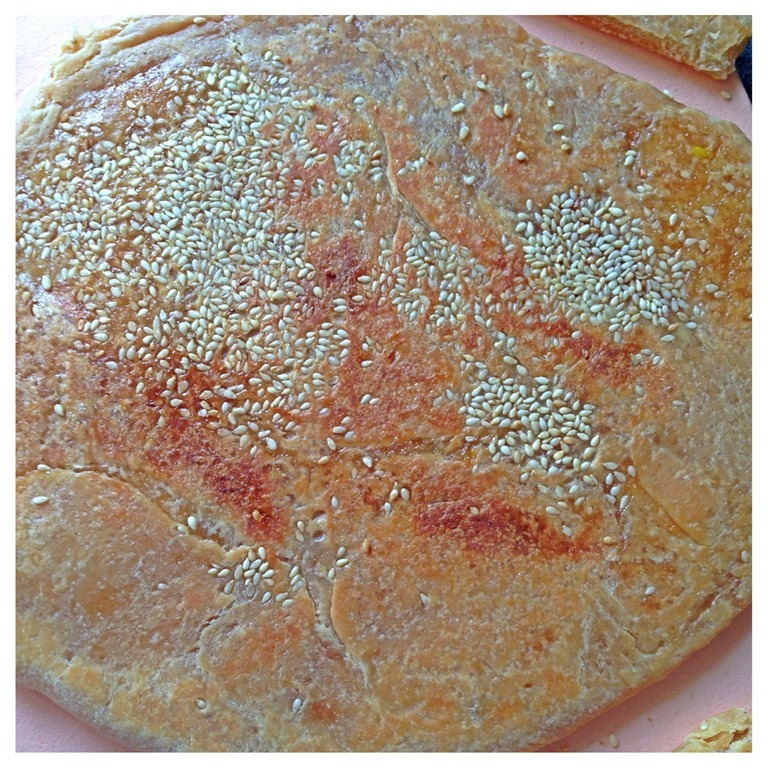 Sprinkles additional sesame seeds on both side and pan fry using the lowest heat until the dough is cooked and turned golden brown in colour. 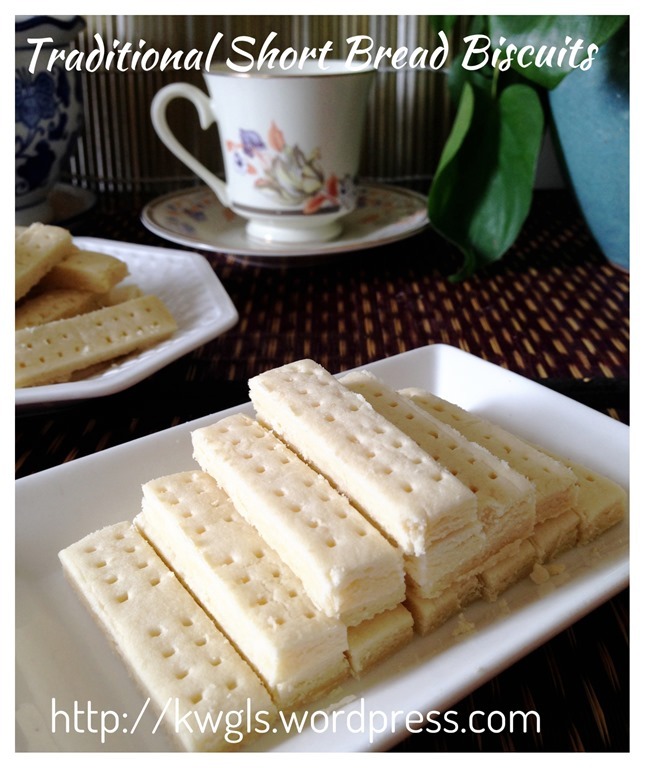 For servings, cut into your desired shapes and sizes. 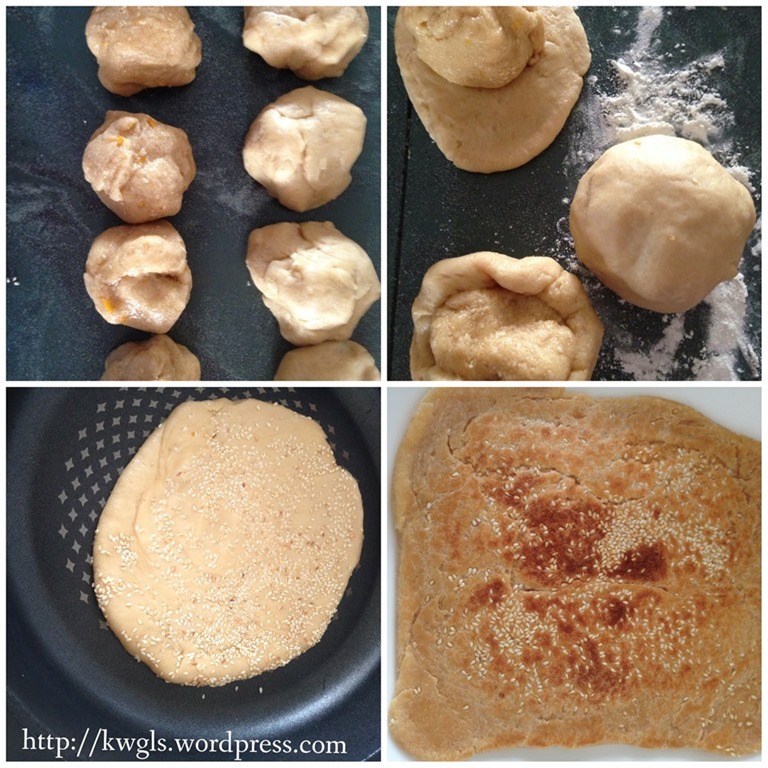 I have tried to re-create pancake based on the only recipe that I have. I have decided to post in the blog as I want to introduce this to my international readers. Do give it a try and see if it suit your taste bud. Hope you like the post today and cheers.